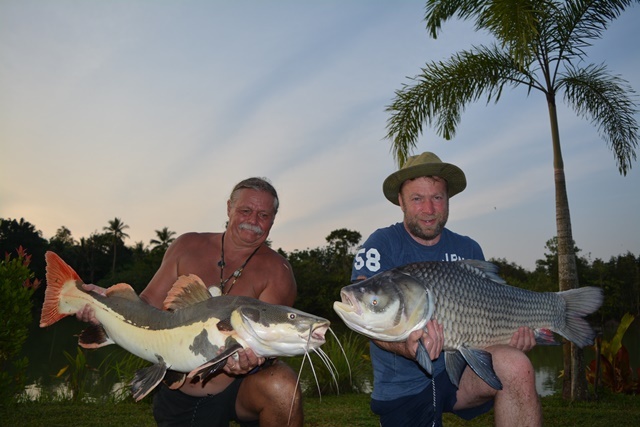 Andy Rutherford (aka Scary Man) was back and what a truly amazing session he had, not joining just one but two Palm Tree Lagoon BIG fish clubs. 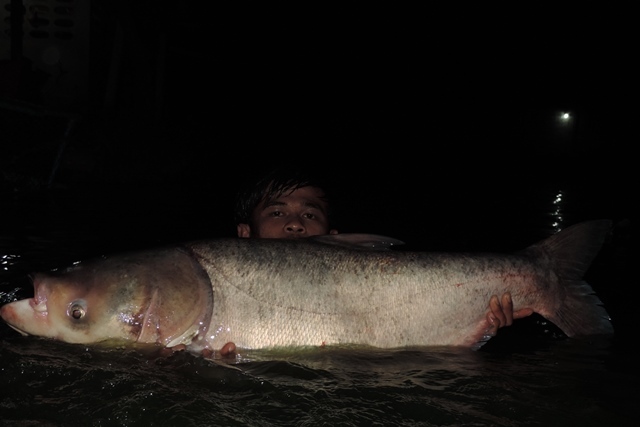 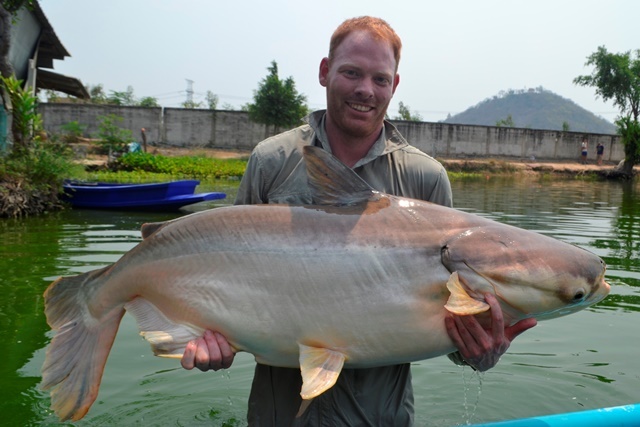 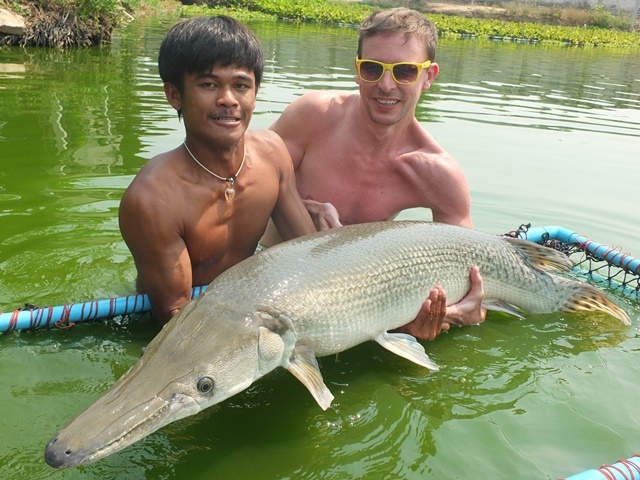 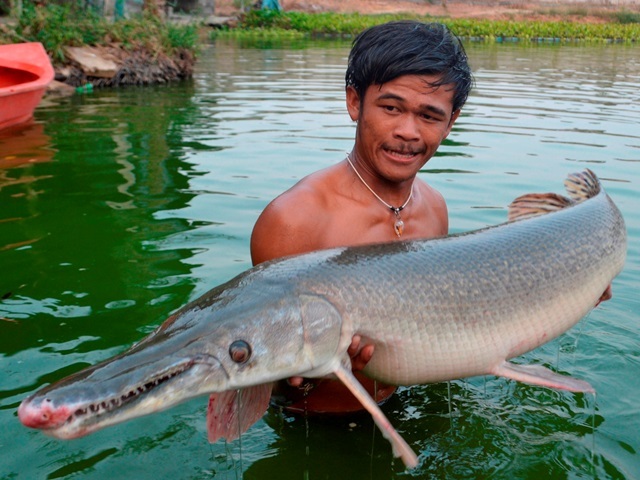 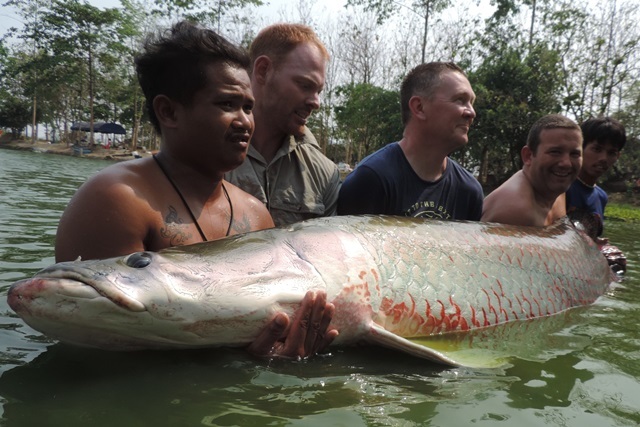 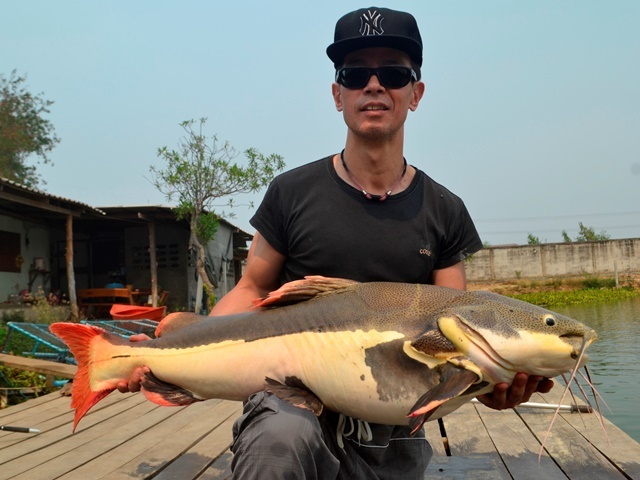 Firstly, after a lengthy two and a half hour battle he landed a Mekong catfish well over the 300lb mark, and then later in the week he completed the double with a nail biting one hour battle with a 460lb arapaima. 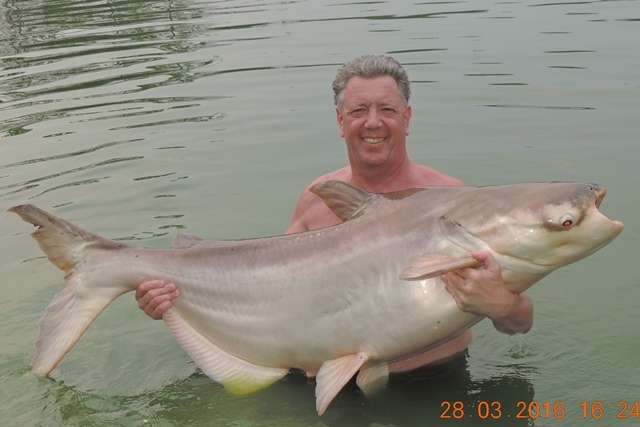 In addition to this he also caught a number of other great species that included a strikingly marked tiger catfish, alligator gar that he was not too keen to pick up, pacu, mollycot, big-Y catfish, striped catfish, catfish shark and numerous Amazon redtails. 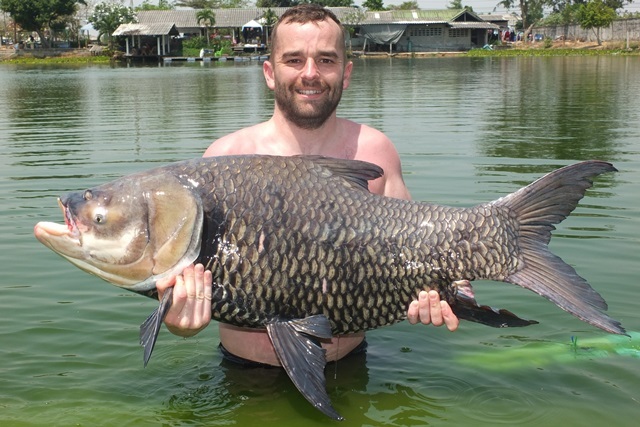 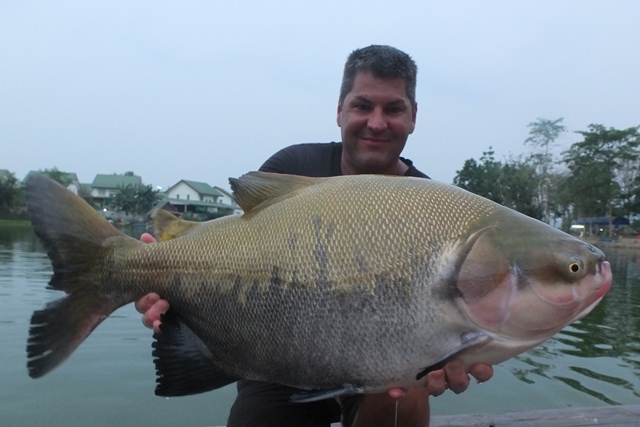 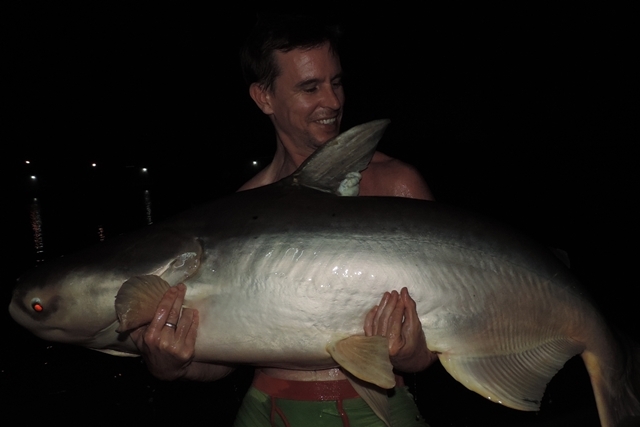 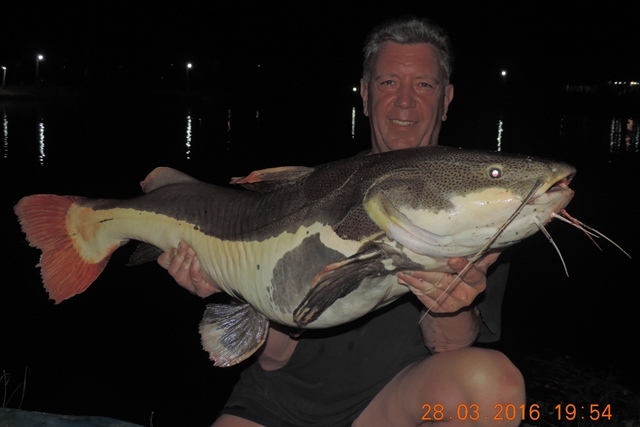 Oliver Jack was back resuming his quest to catch one of the Palm Tree BIG girls and this time he succeeded landing one of the biggest chao phraya ever to come out of Palm Tree and in the process earning membership to the exclusive Palm Tree Lagoon 150lb Chao Phraya Club. 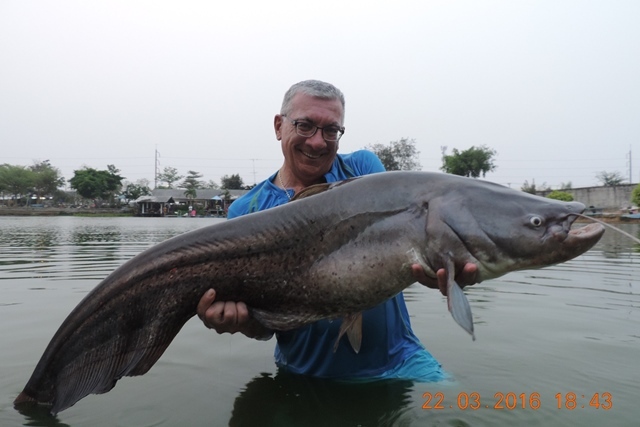 In addition to this more than awesome catch he also caught a number of other superb fish that included tambaqui, big-Y catfish, some monster alligator gar, Juliens golden price carp, yellow catfish, leopard catfish, and both Asian and Amazon redtail. 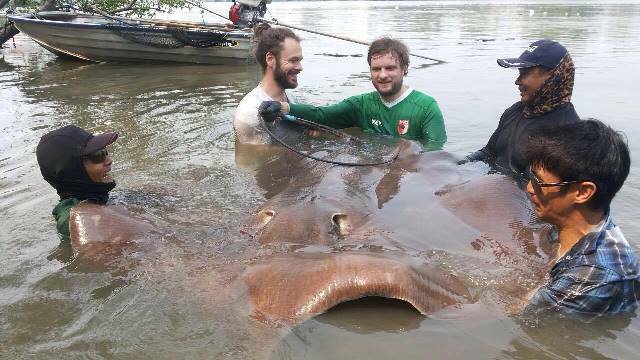 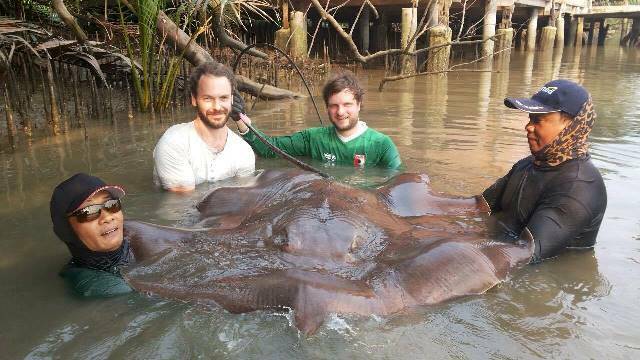 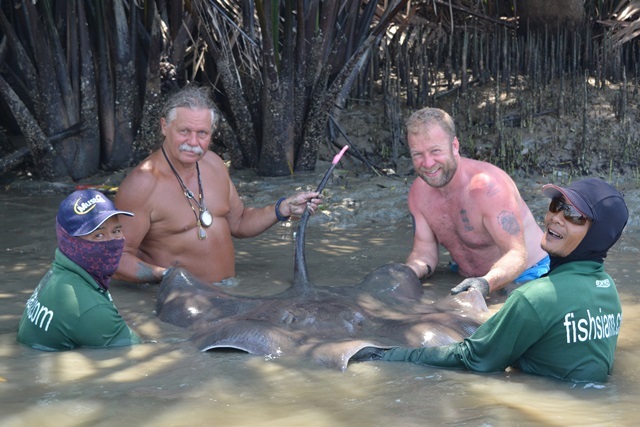 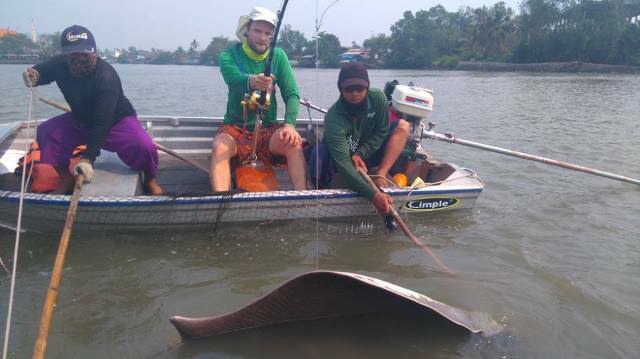 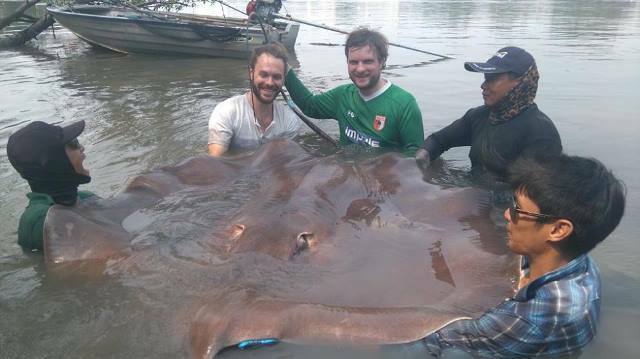 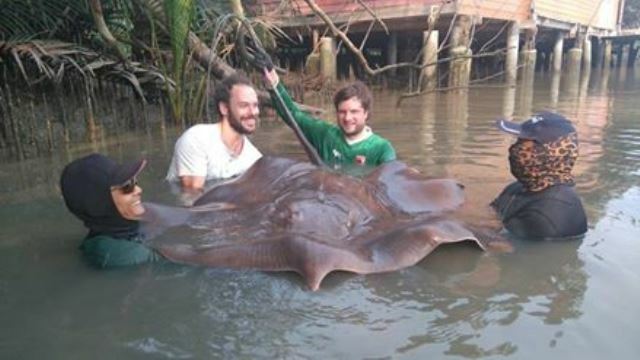 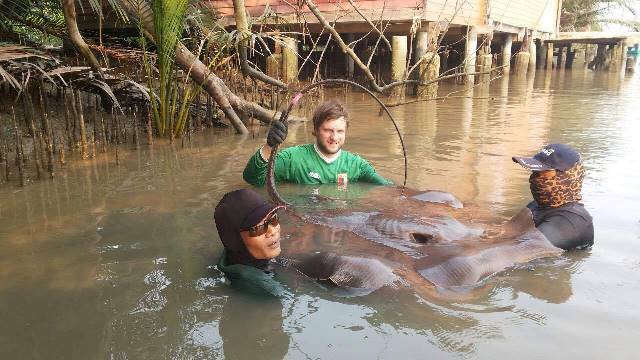 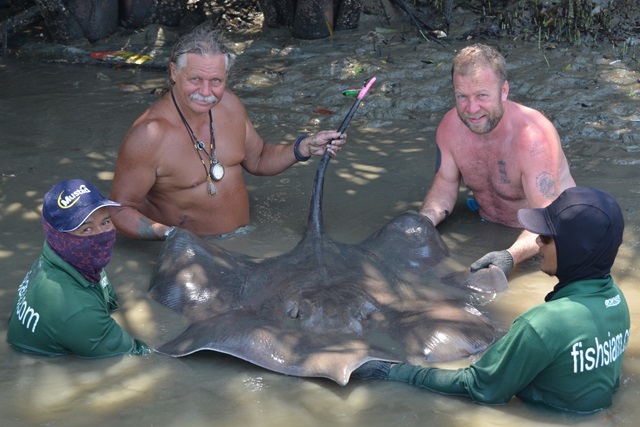 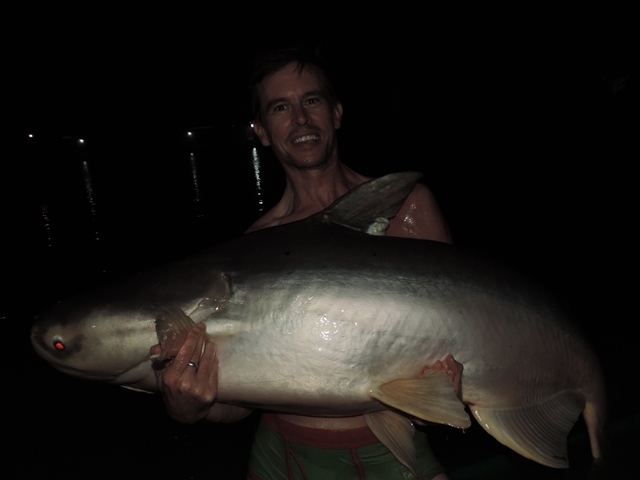 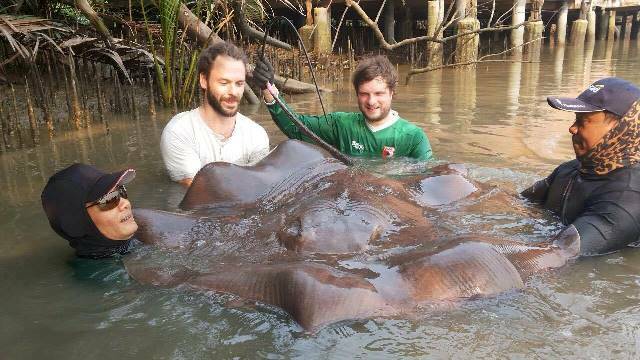 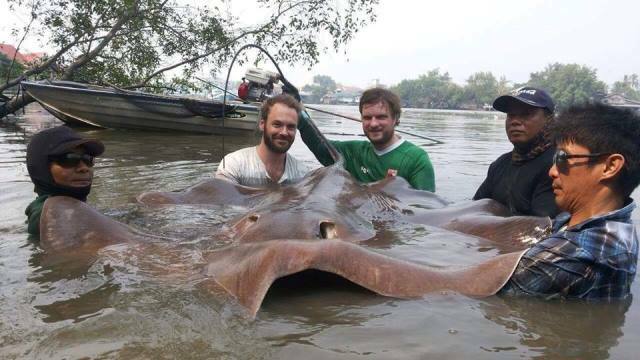 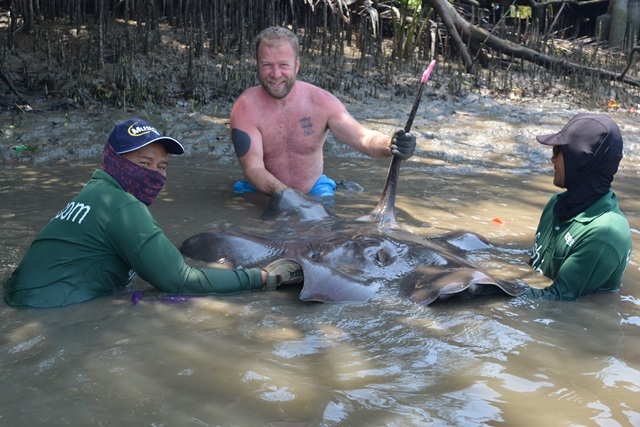 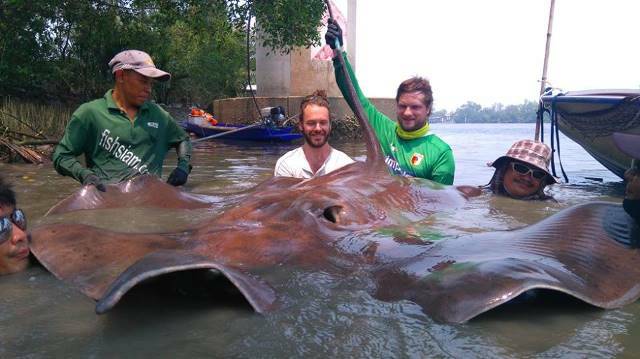 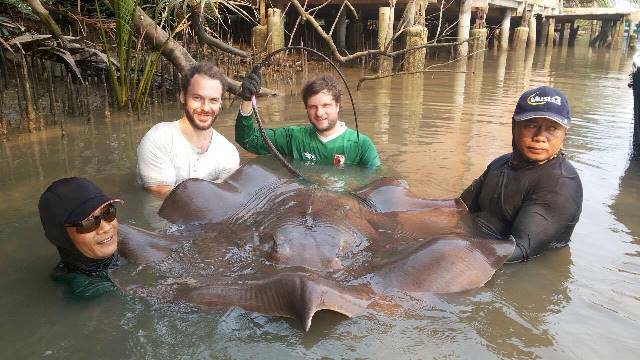 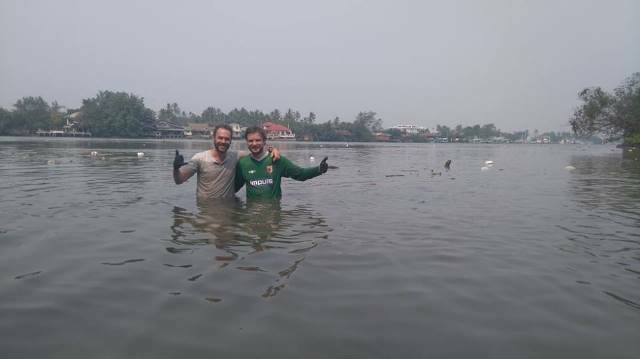 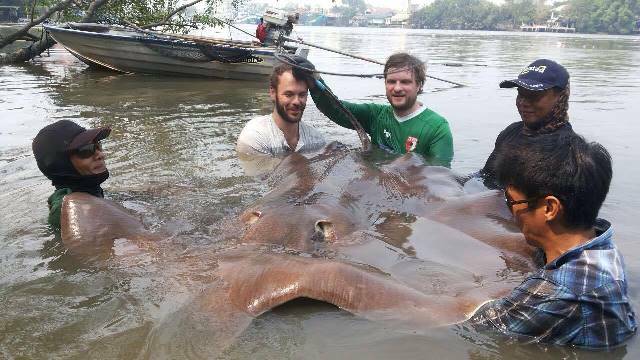 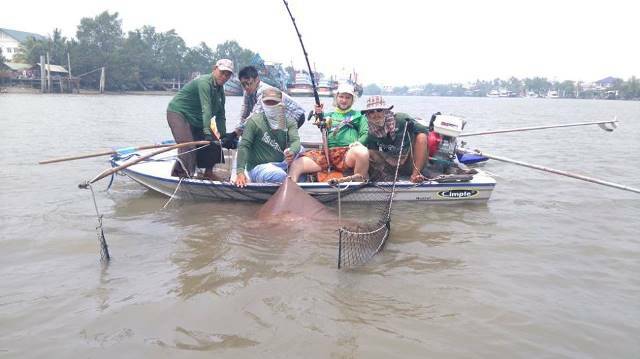 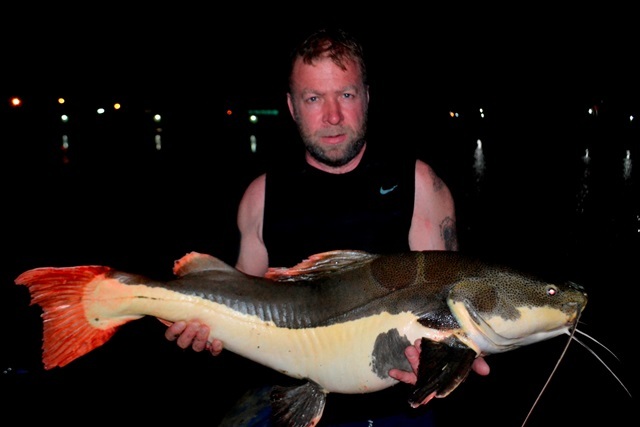 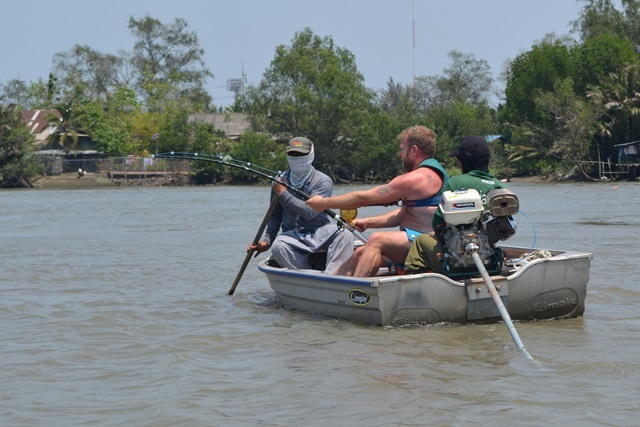 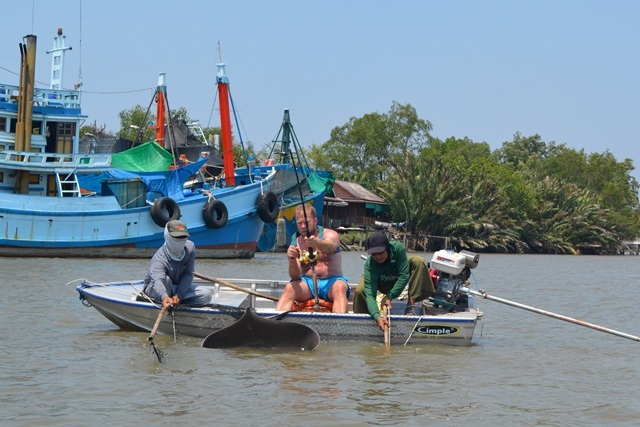 Andreas Lucht and his fishing mate both from Germany made a last minute decision at very short notice to book up a giant freshwater stingray fishing expedition on the Mae Klong River and what a great decision it turn out to be. 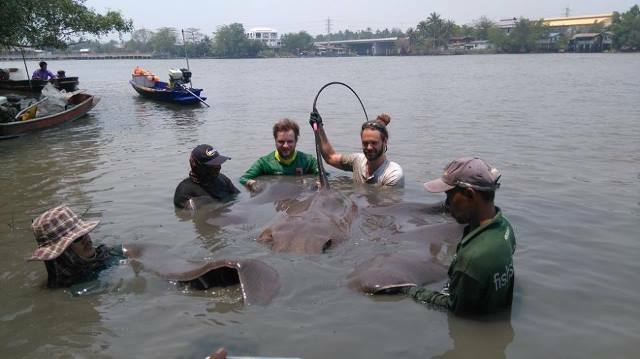 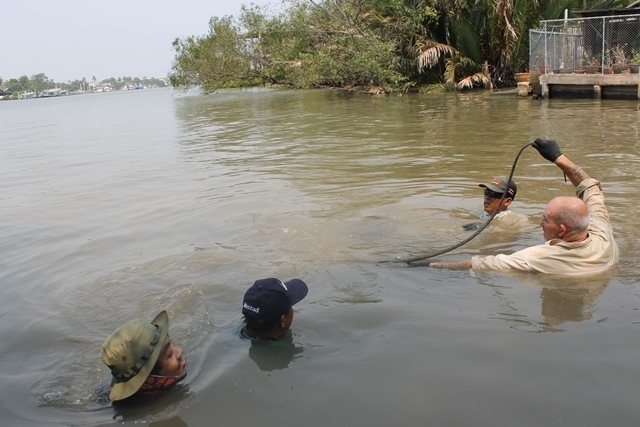 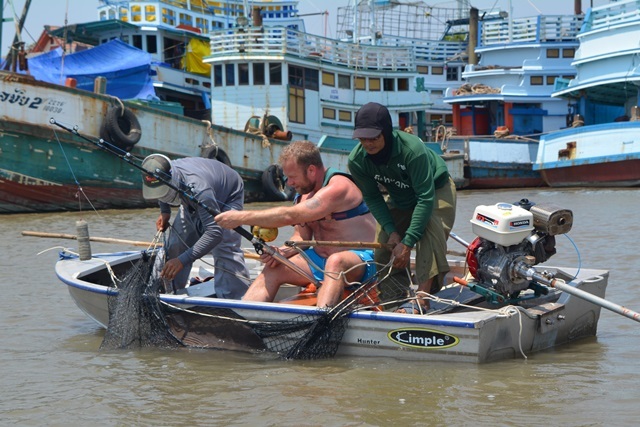 They caught four river monster in total measuring 2.05m, 1.91m, 1.53m and 1.33m the biggest qualifying him for the Palm Tree Lagoon 500lb Stingray Club t-shirt. 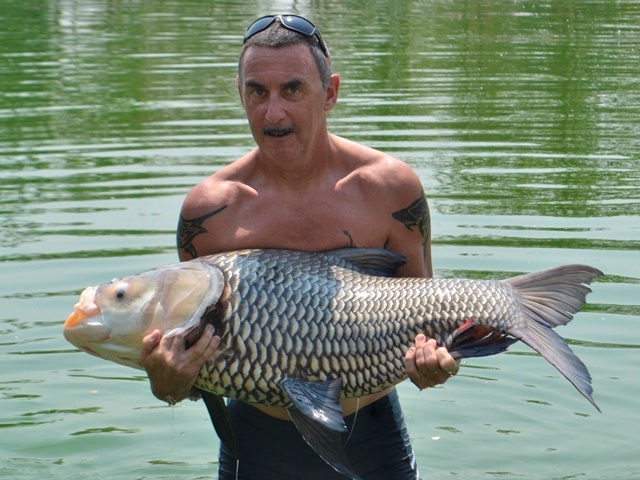 What a session Denis Krivec had catching three huge carp in a single afternoon the biggest at 170lb+ easily qualifying him into the Palm Tree Lagoon 150lb Carp Club. 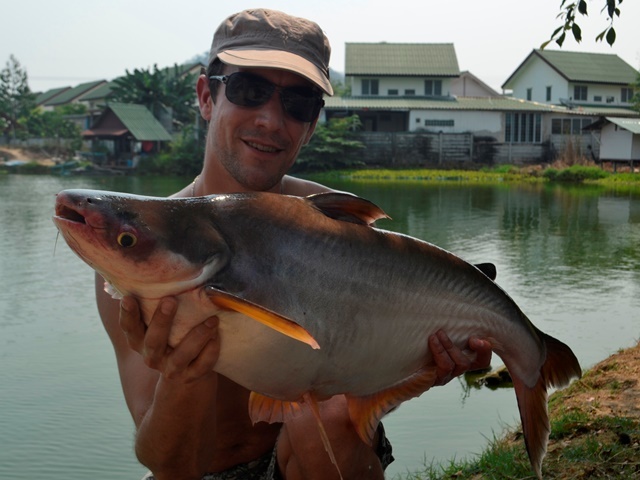 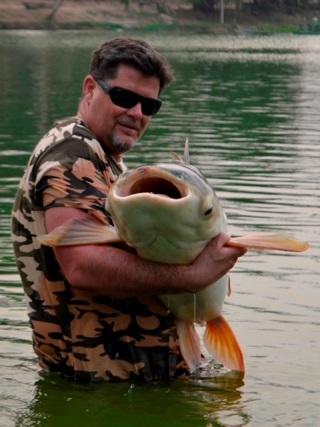 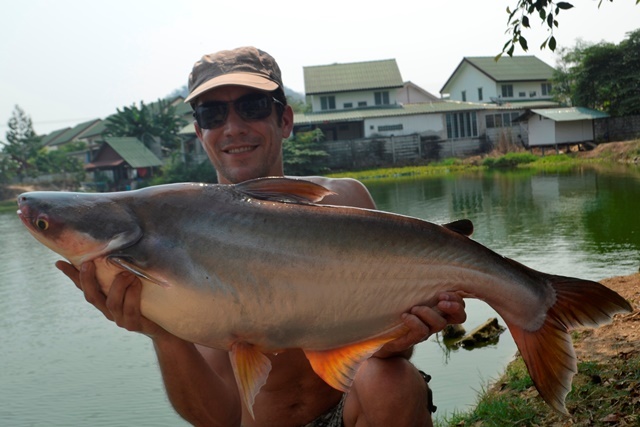 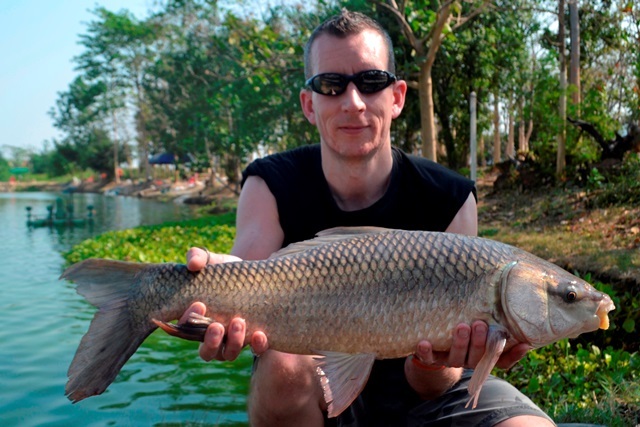 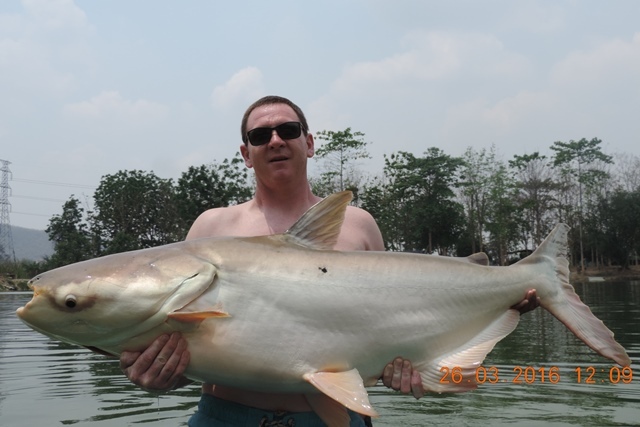 He also caught another smaller carp, Mekong catfish and an awesome Amazon redtail. 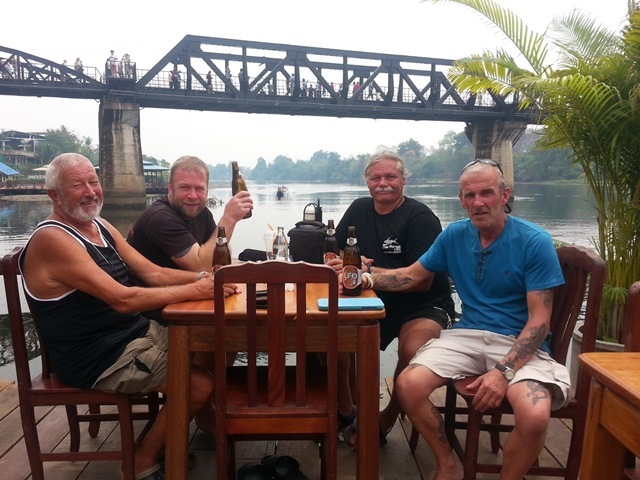 Peter Cobley, Neil Cobley and his son also make there first visit to Palm Tree during the month. 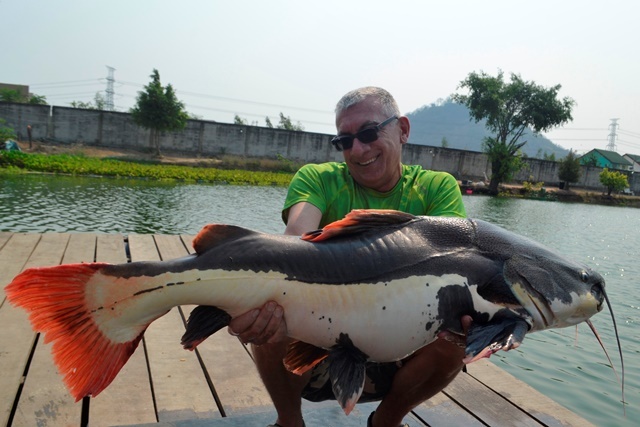 Between them they caught a number of great catches that included a more than awesome 460lb arapaima, a rare vundu catfish, Juliens golden price carp, giant snakehead, Siamese carp, catfish shark, big-Y catfish, chao phraya, parapatinga, mollycot, striped catfish, Mekong catfish and Amazon redtail. 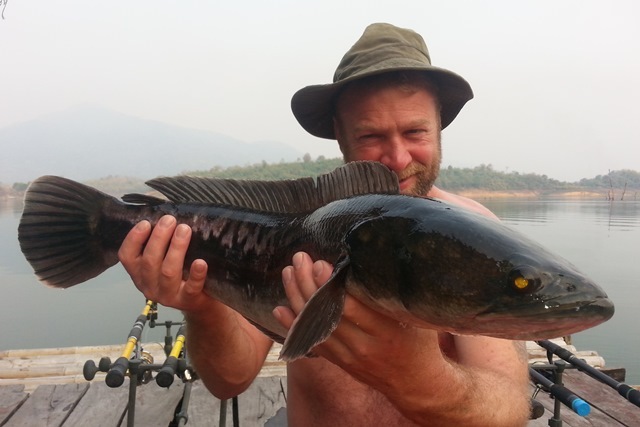 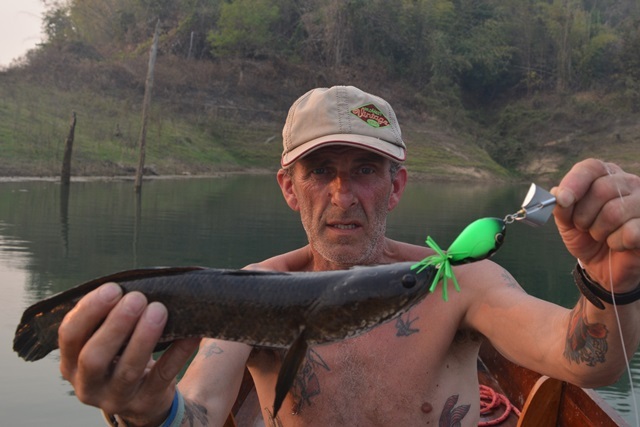 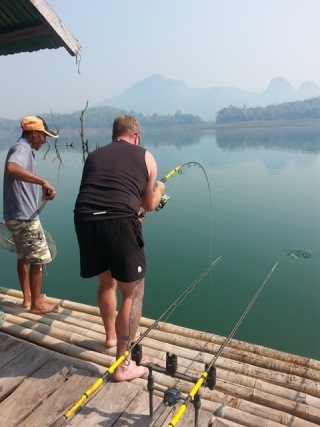 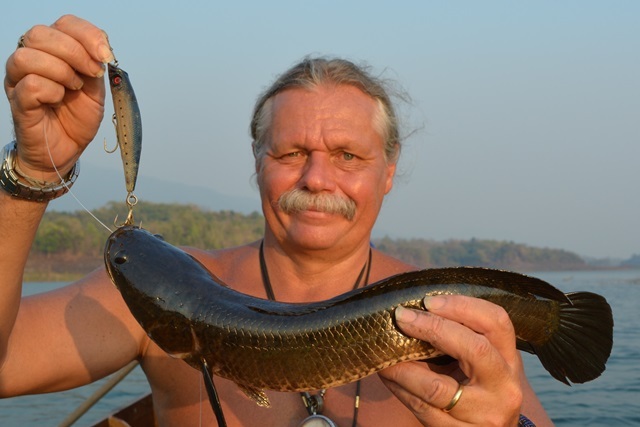 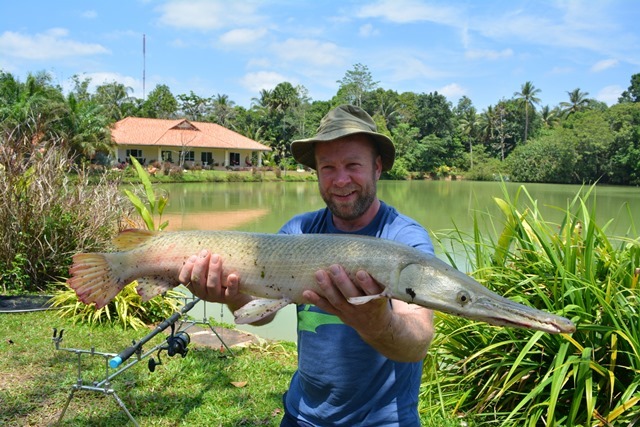 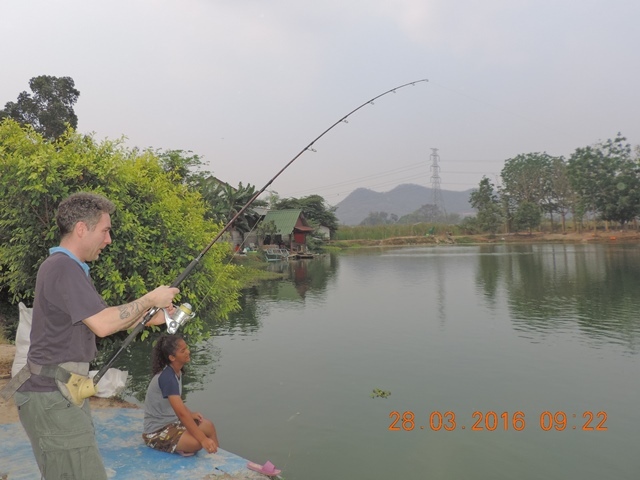 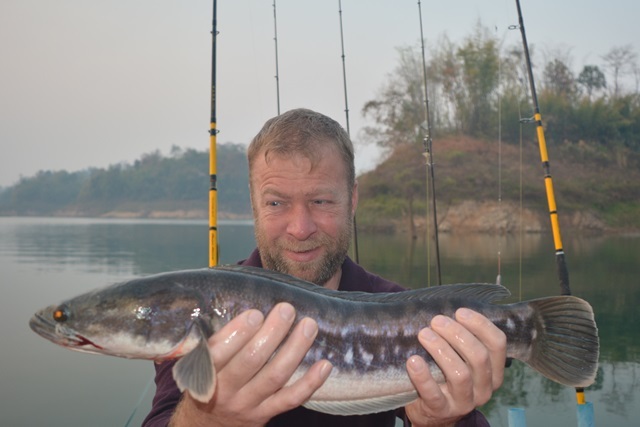 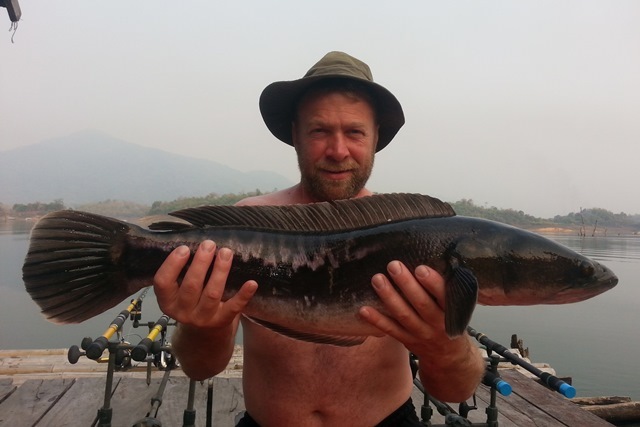 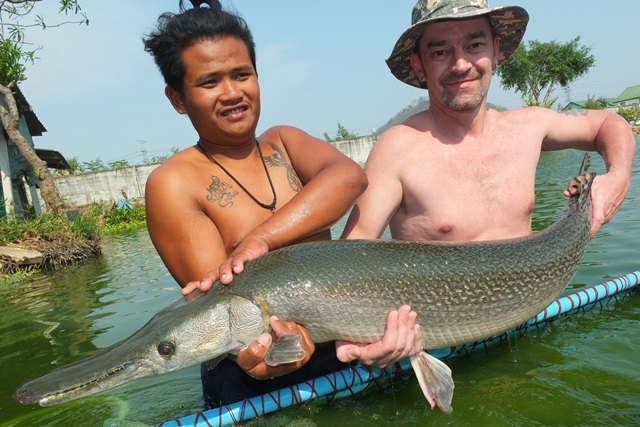 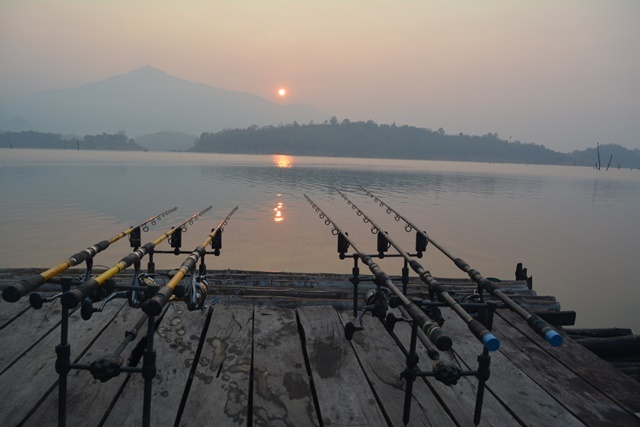 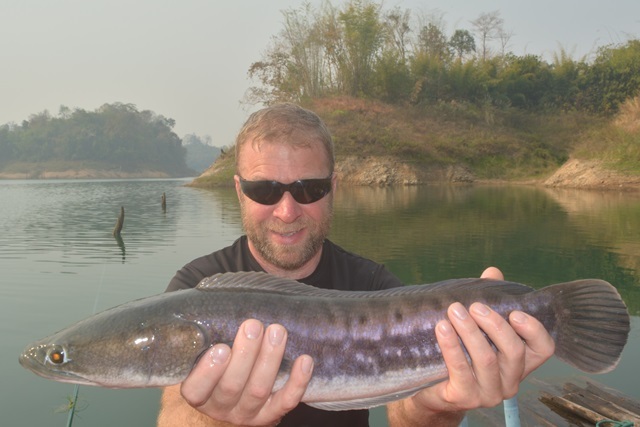 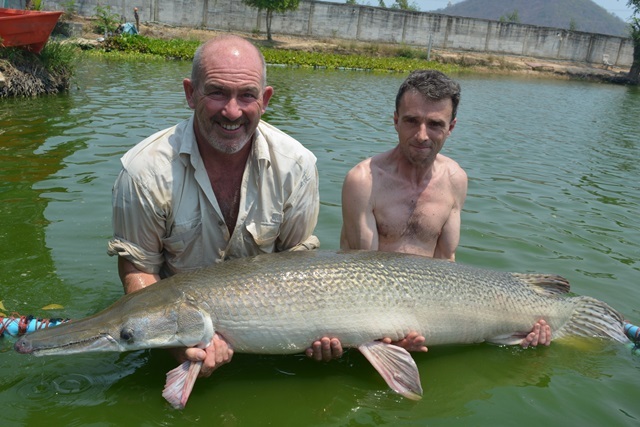 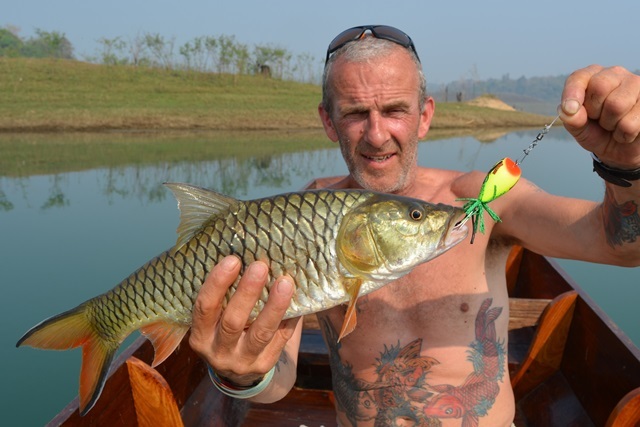 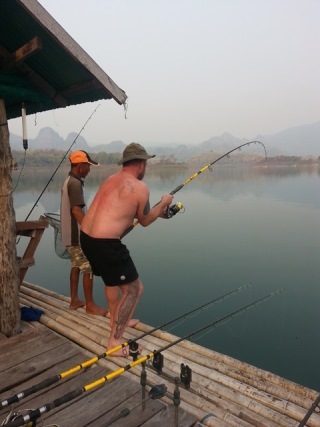 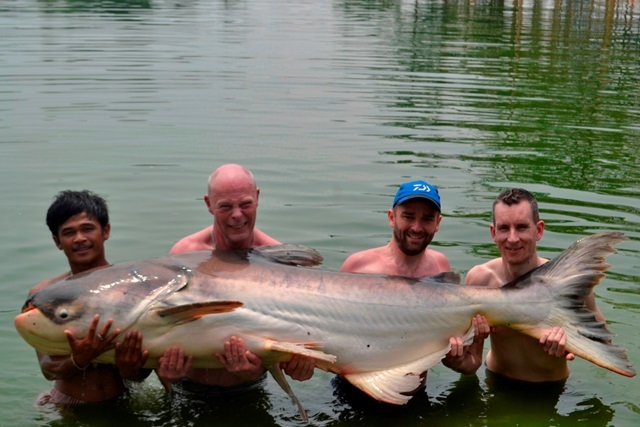 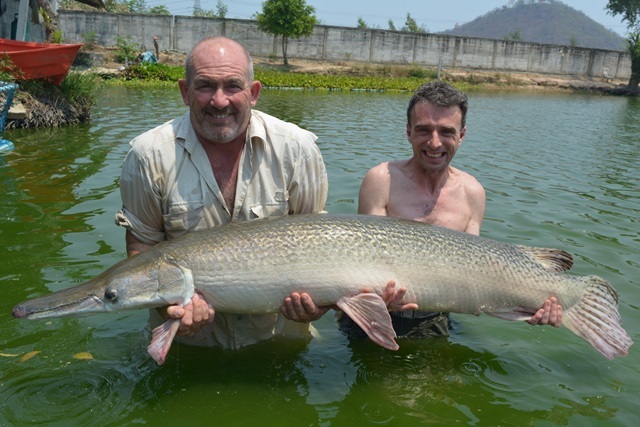 John Wilson, Neil Hunt and Steven Morris decided to take a jungle fishing trip with Tim and Su chasing wallago attu and giant snakehead in the wilds of the majestic Khao Laem Dam, stopping off for a break at the famous 'Bridge over the River Kwai' on the way. 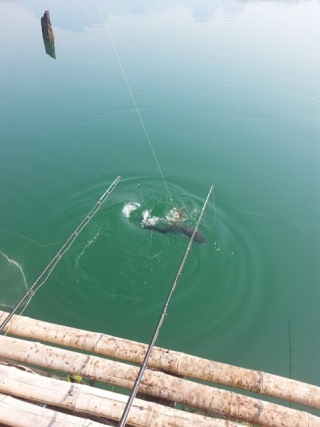 Although there were wallago attu jumping and topping everywhere we could not tempt them into taking the bait. 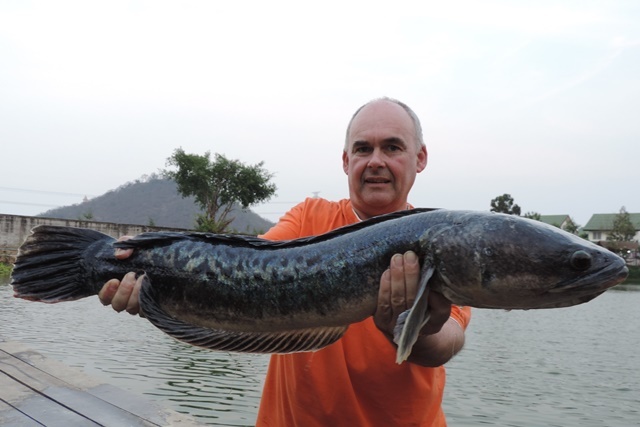 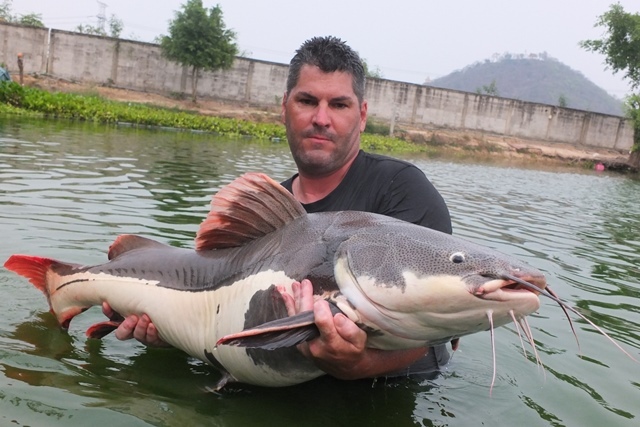 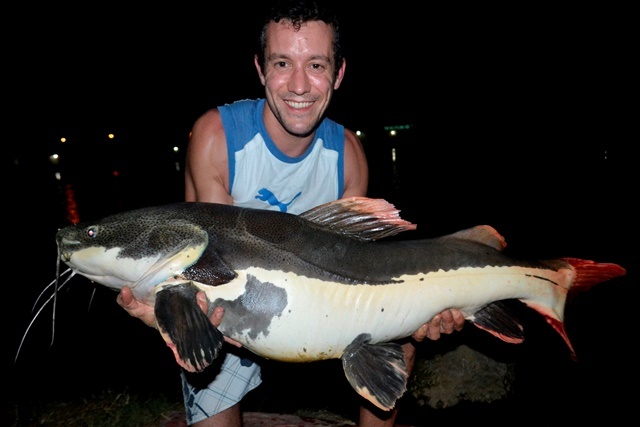 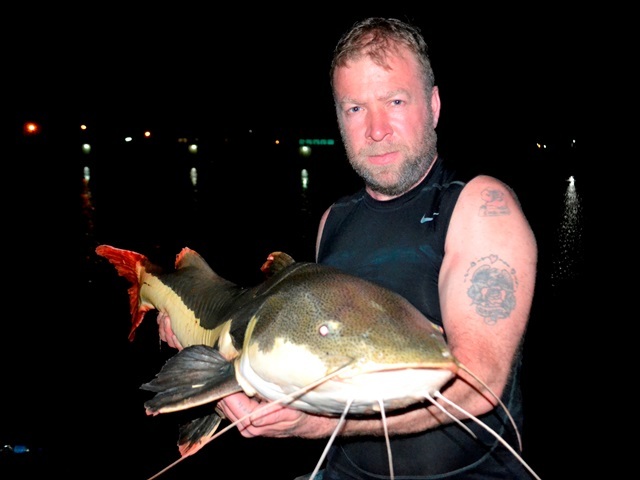 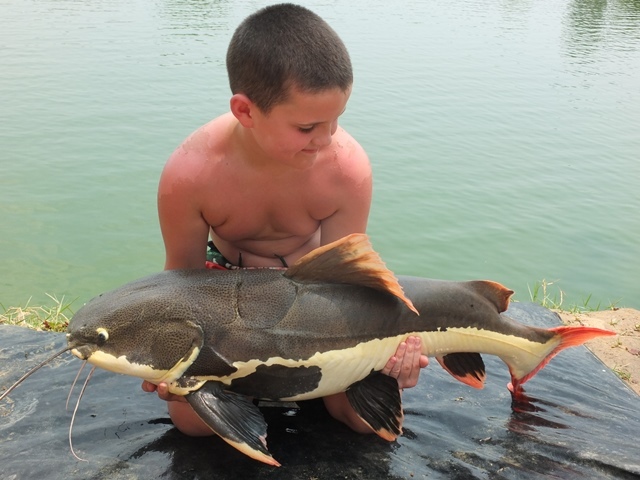 However, they caught a load of other species that was topped by Neil breaking the current IGFA world record for yellow catfish with a 3.80kg specimen.Many other great fish were caught that included lots of giant snakehead, more yellow catfish, marble goby, striped snakehead, hampala barb and eye-spot barb. 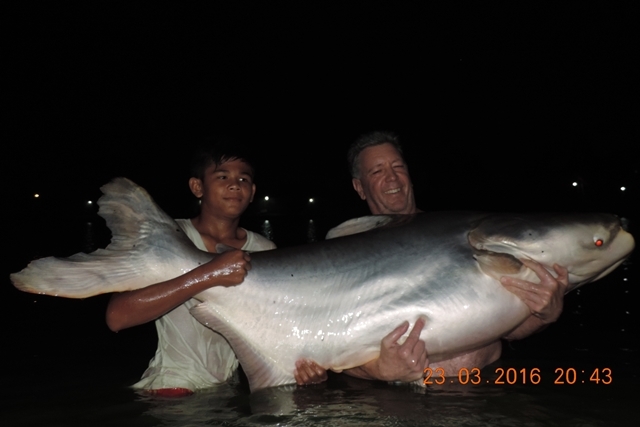 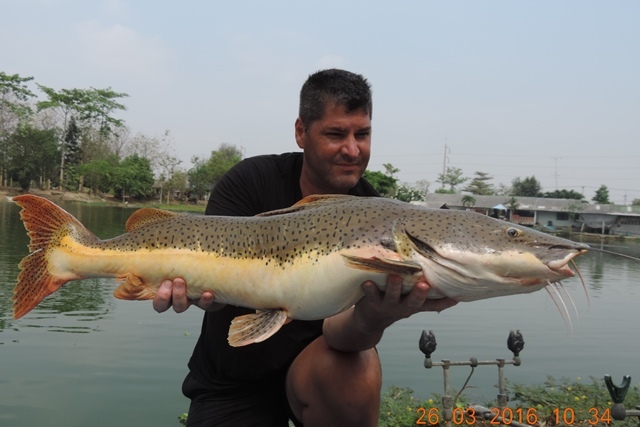 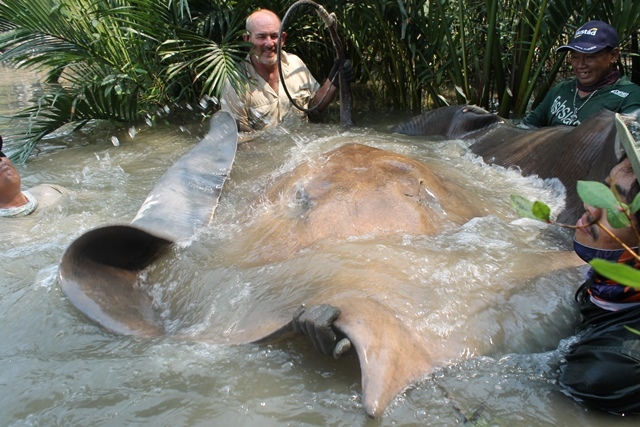 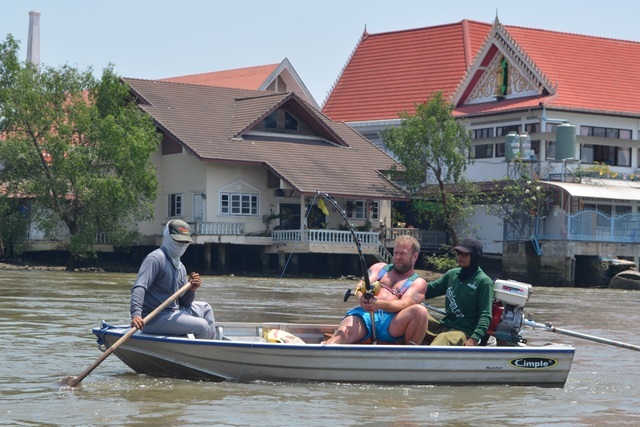 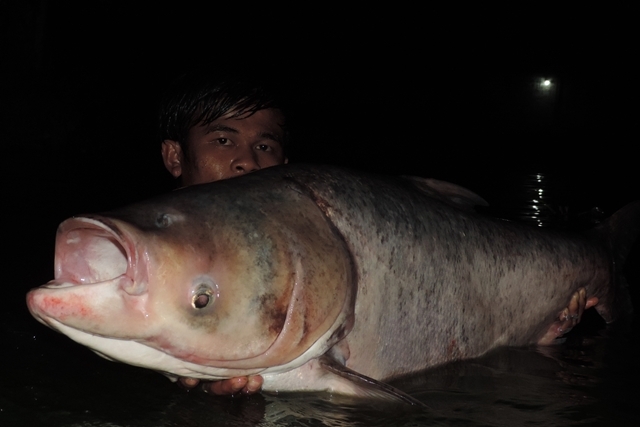 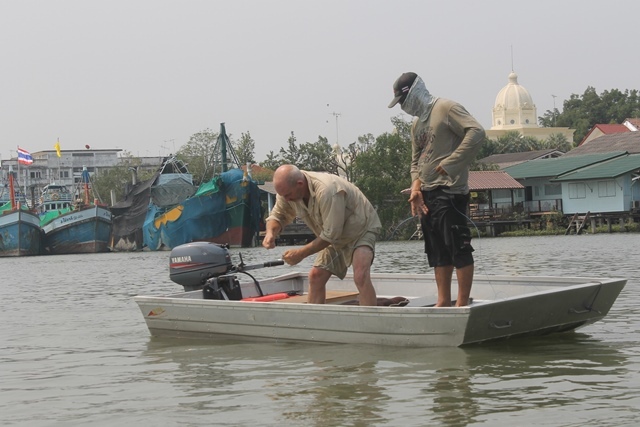 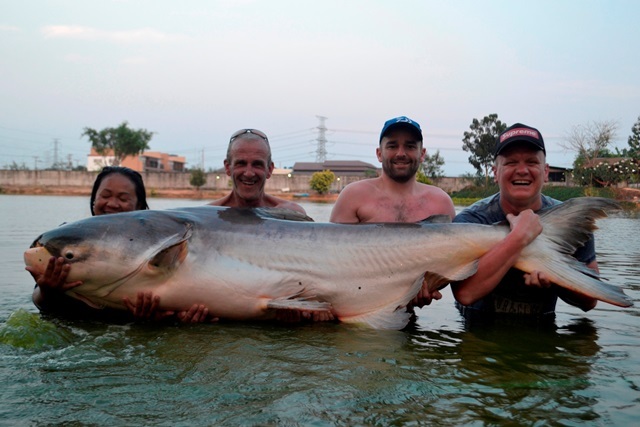 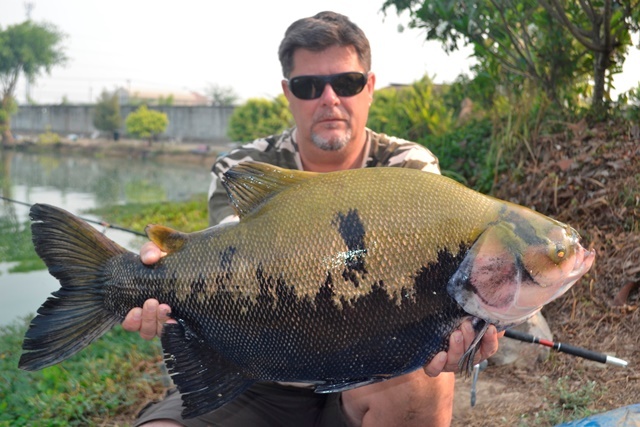 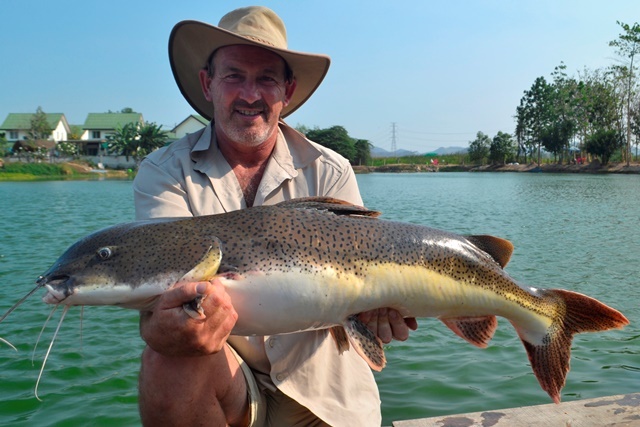 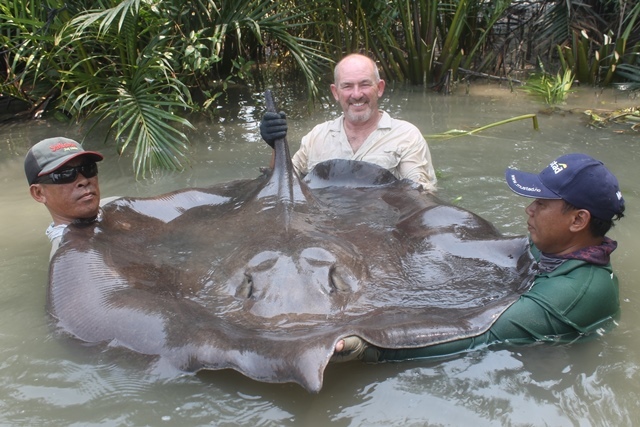 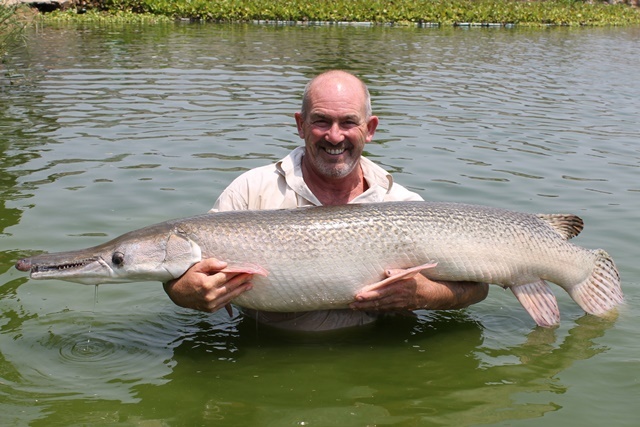 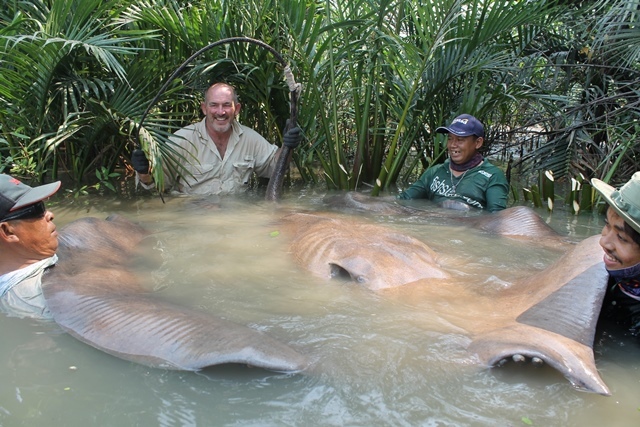 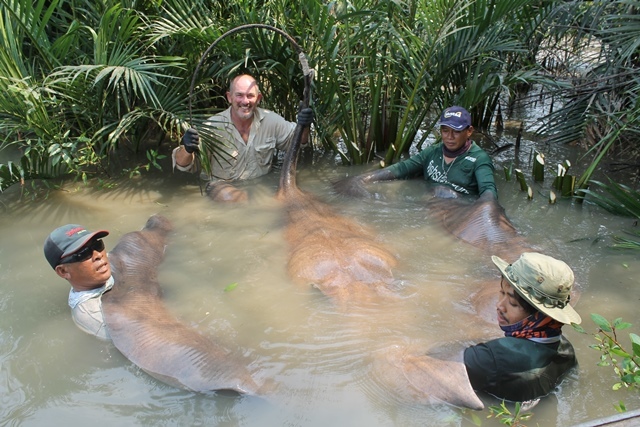 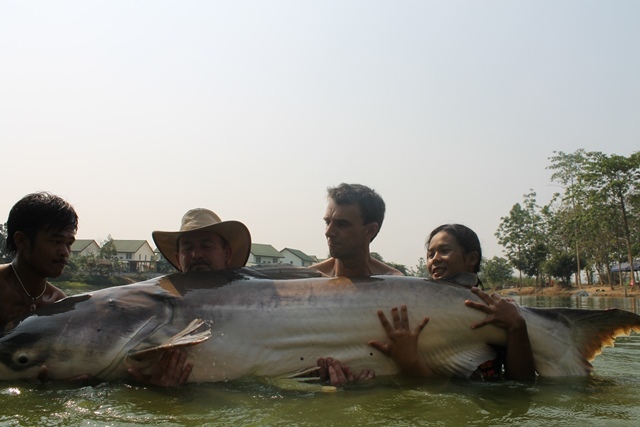 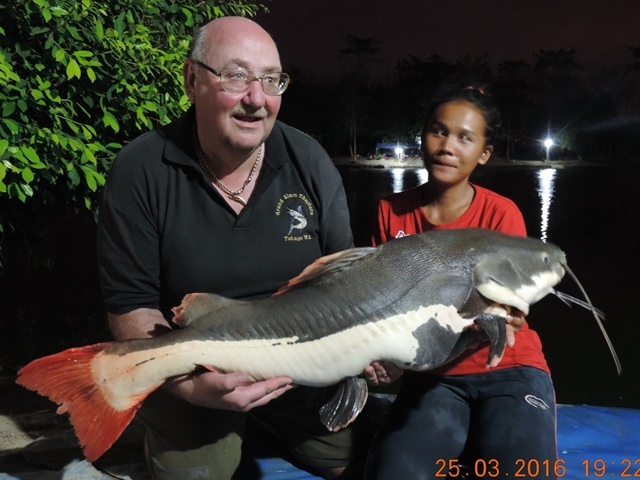 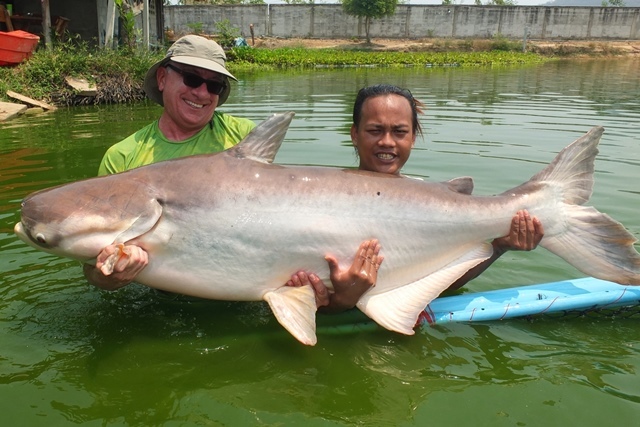 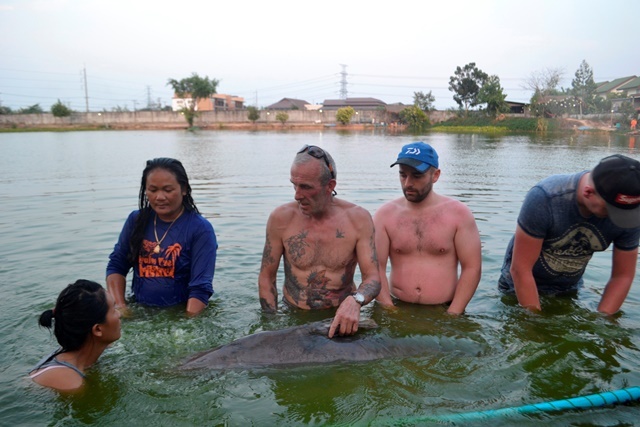 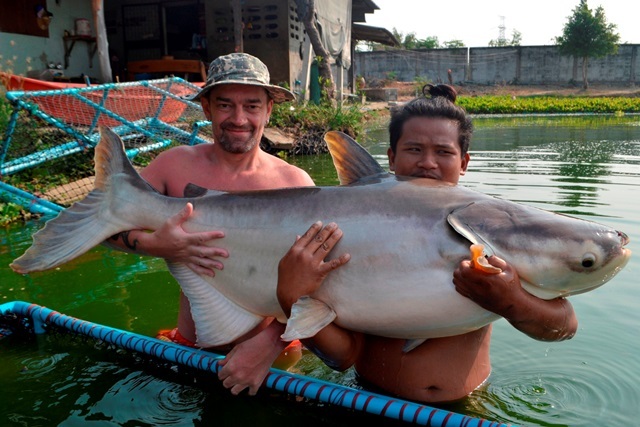 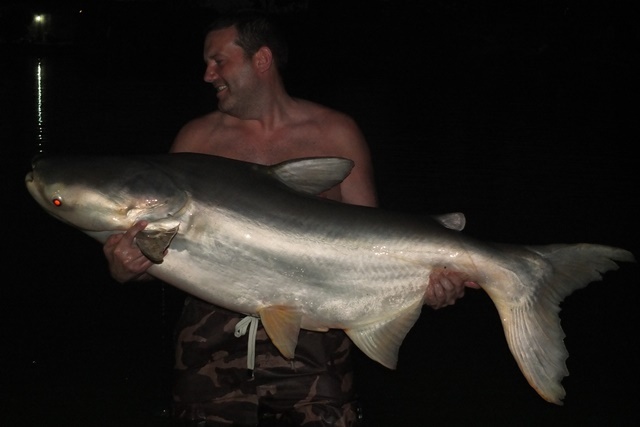 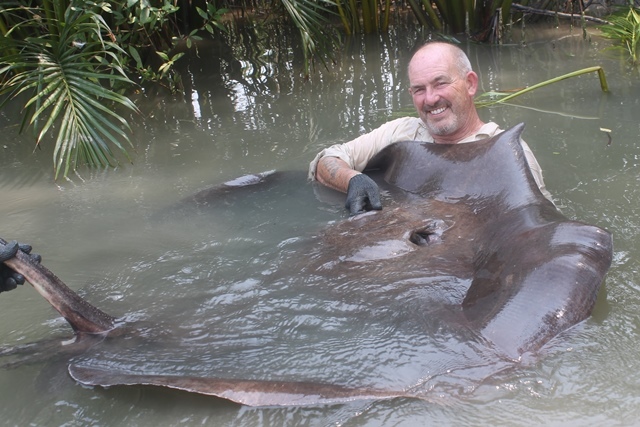 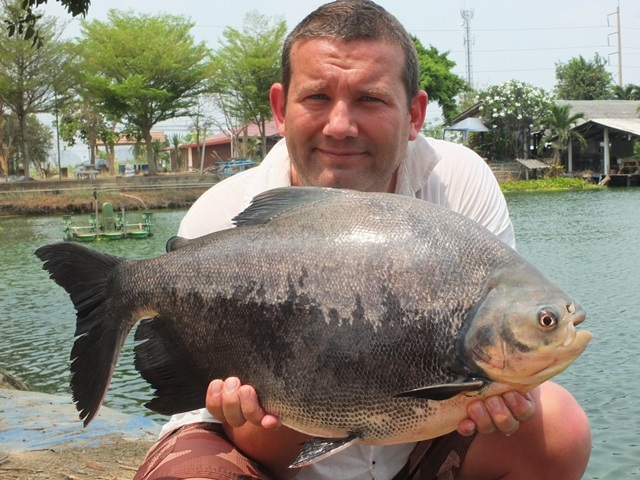 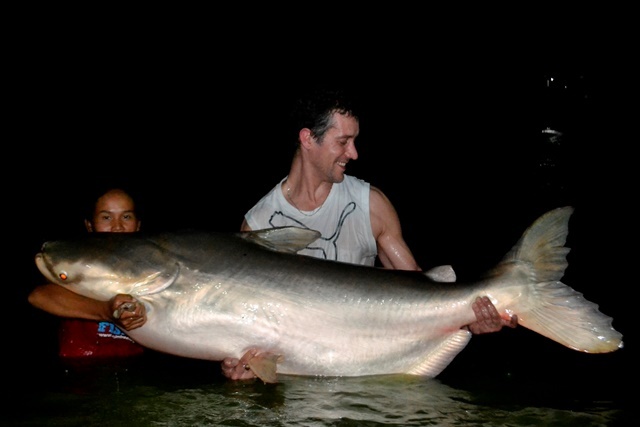 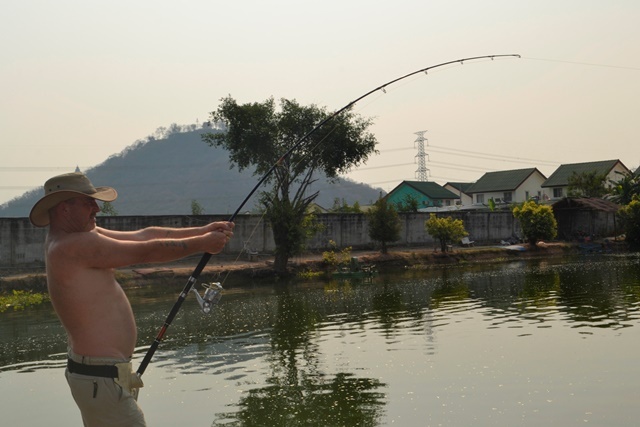 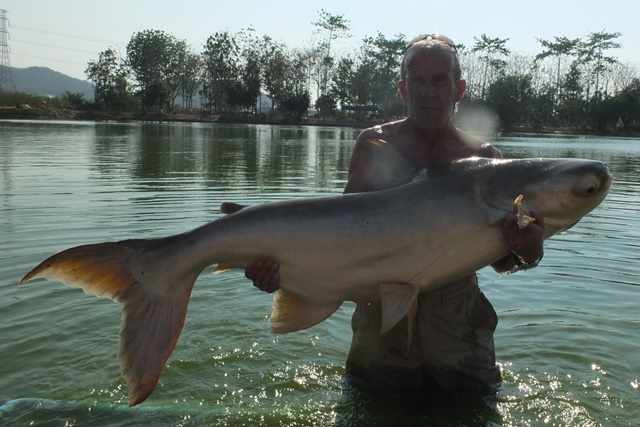 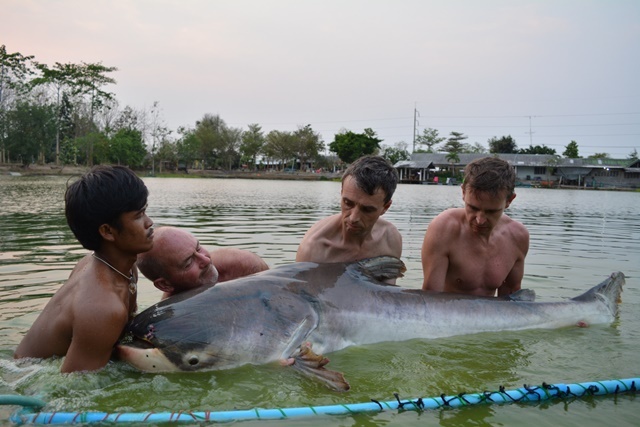 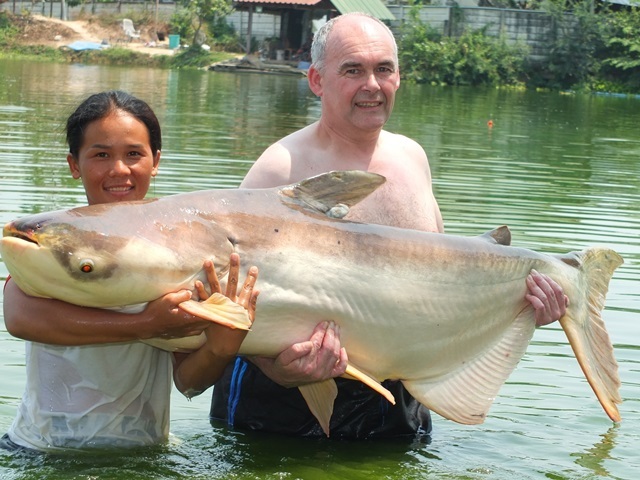 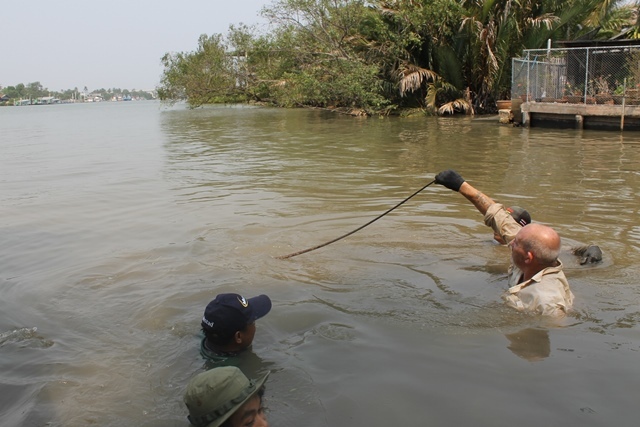 Well it was down to the Mae Klong River for Andy Harman now only requiring a 500lb+ giant freshwater stingray to complete the set of Palm Tree Lagoon BIG 5 Fish Club Memberships and win a free weeks fishing in the process. 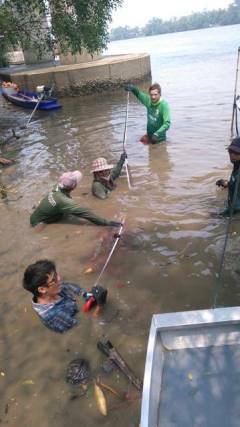 After two and a half hour of straining and groaning the river monster was hauled to the surface and the goal was achieved. 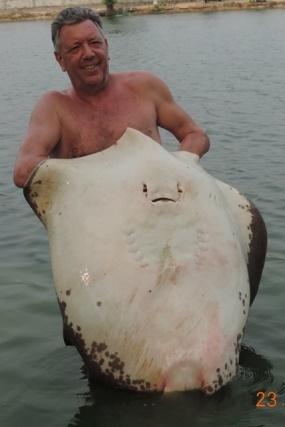 He also caught another good sized stingray later on in the day. 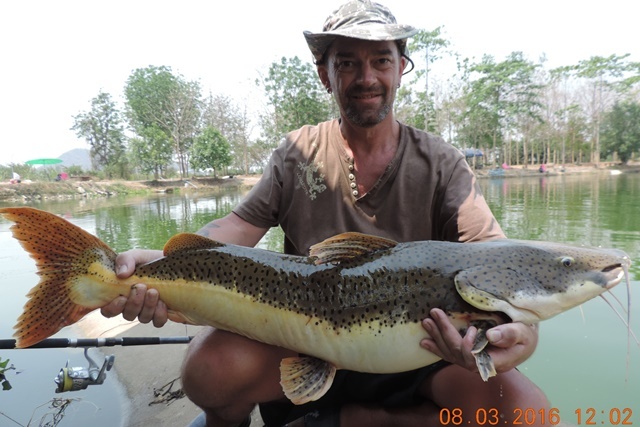 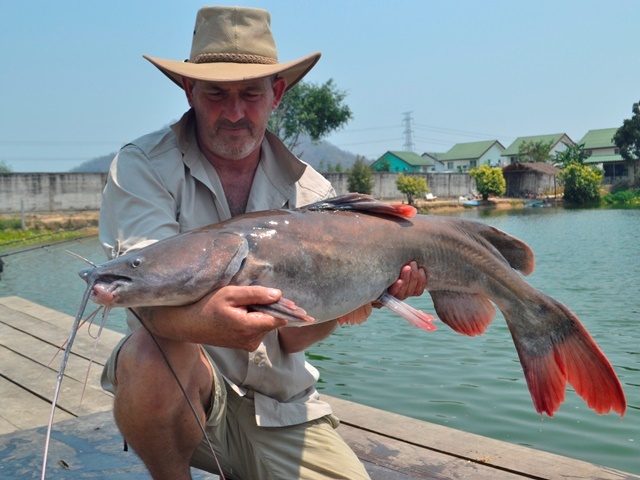 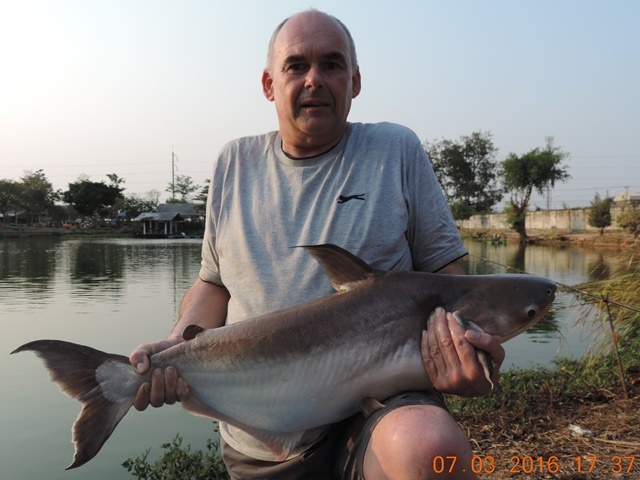 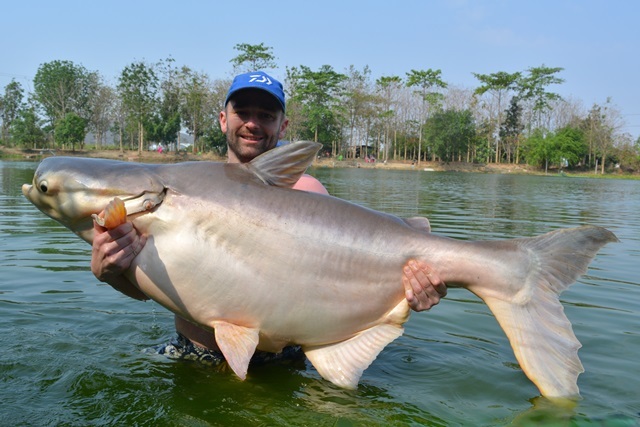 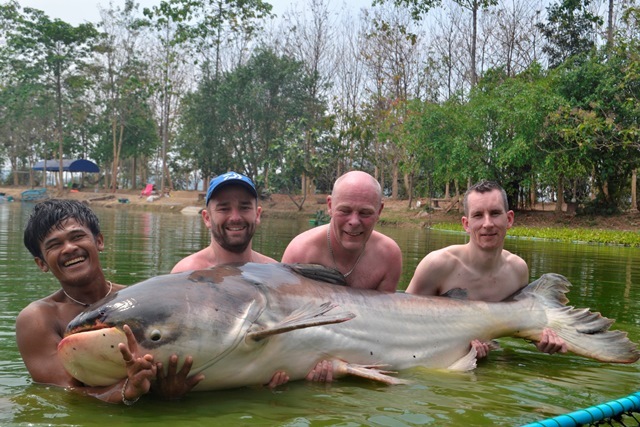 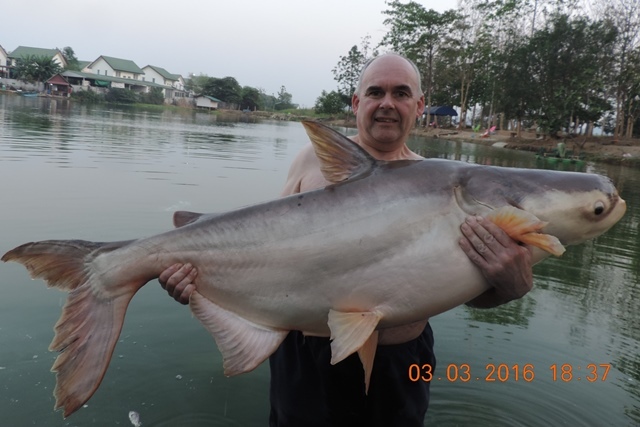 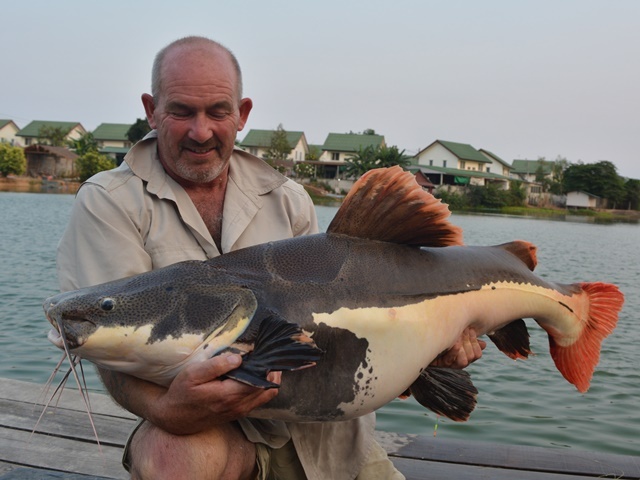 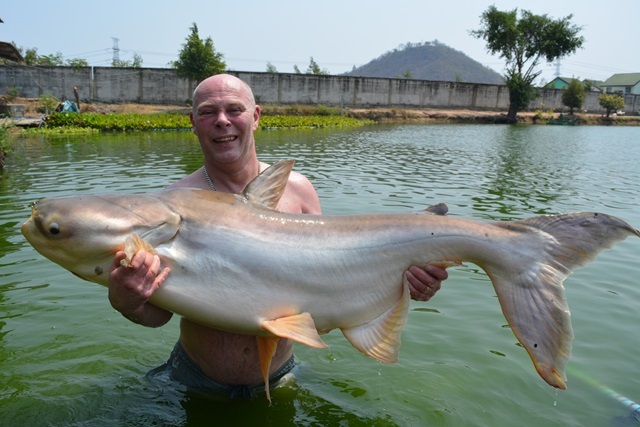 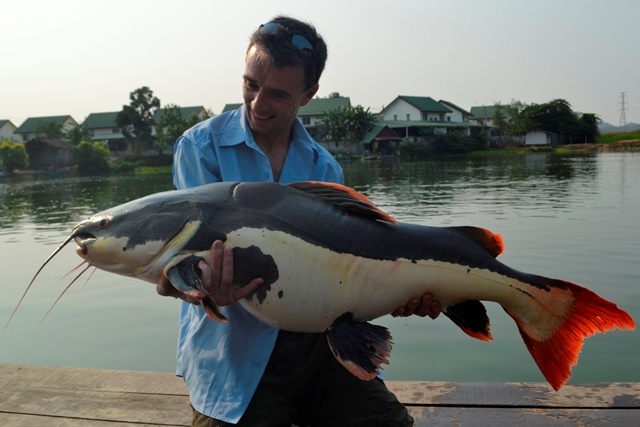 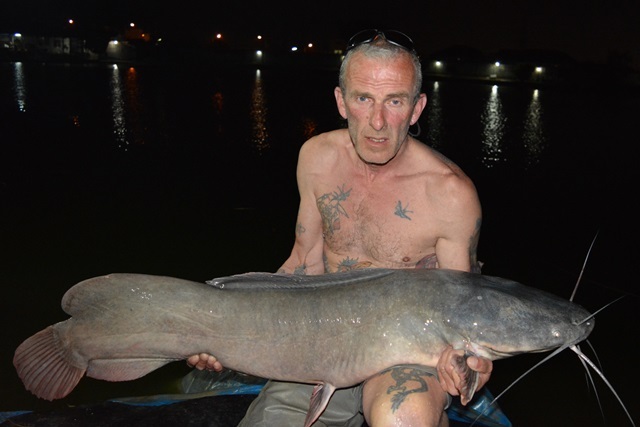 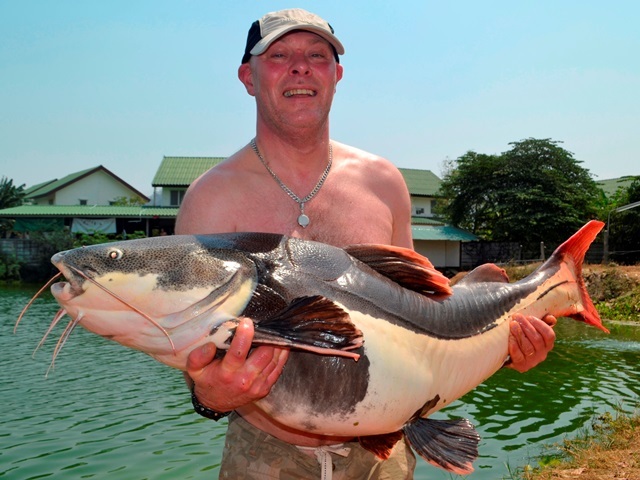 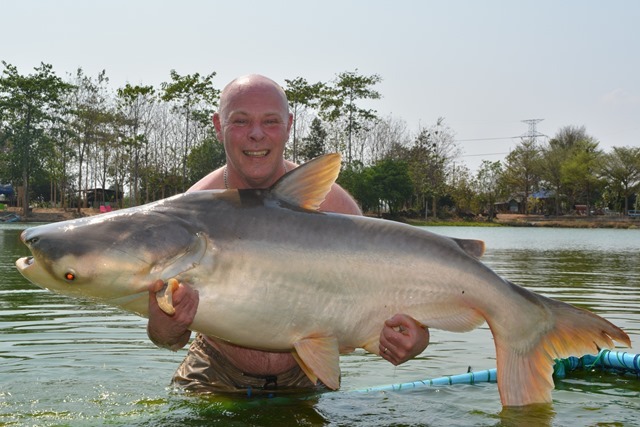 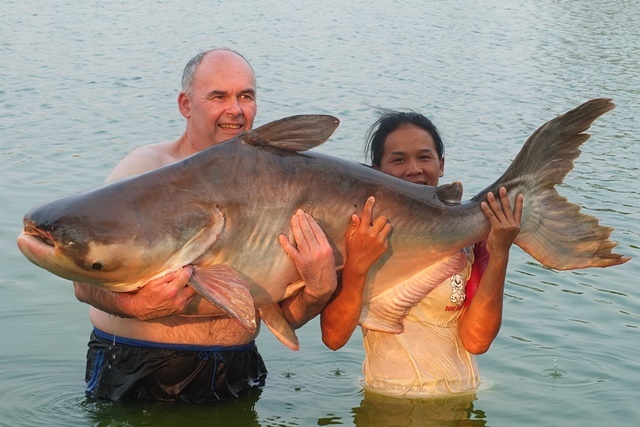 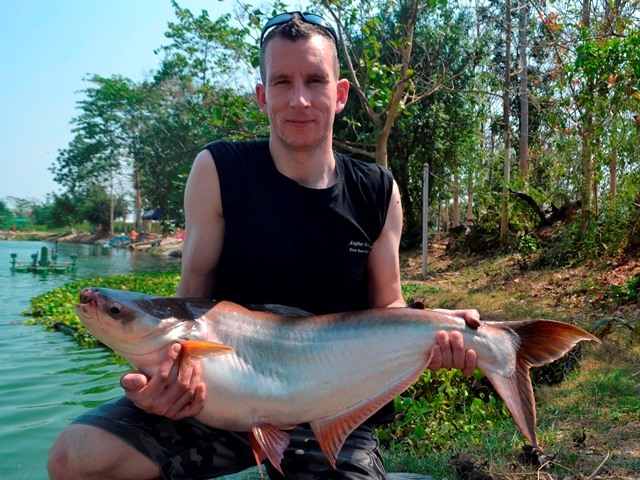 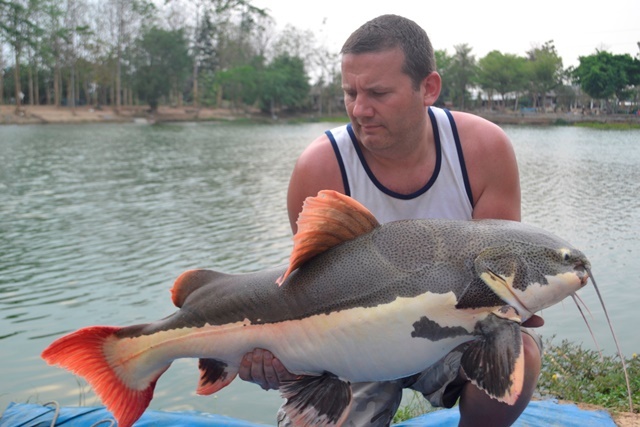 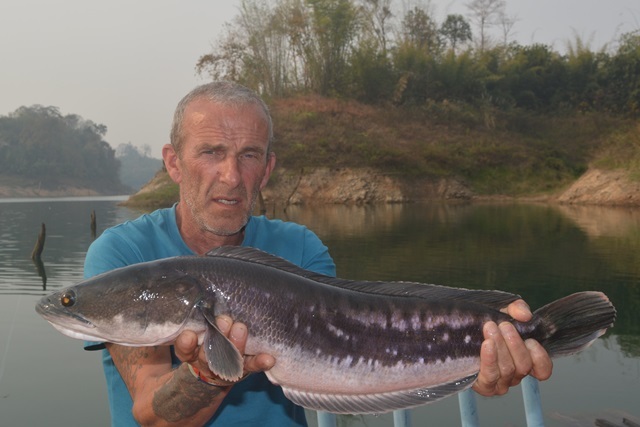 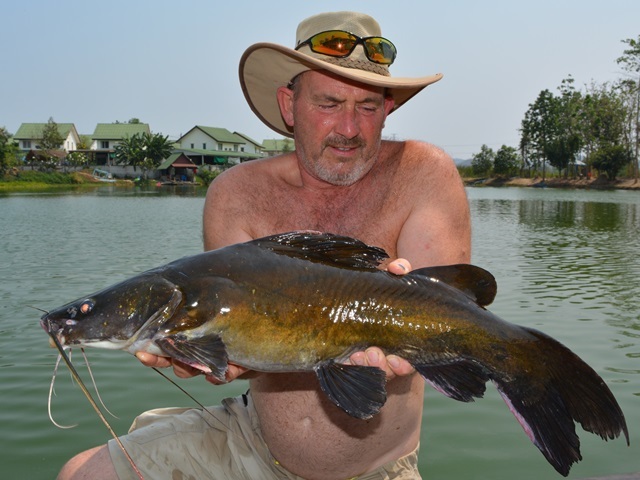 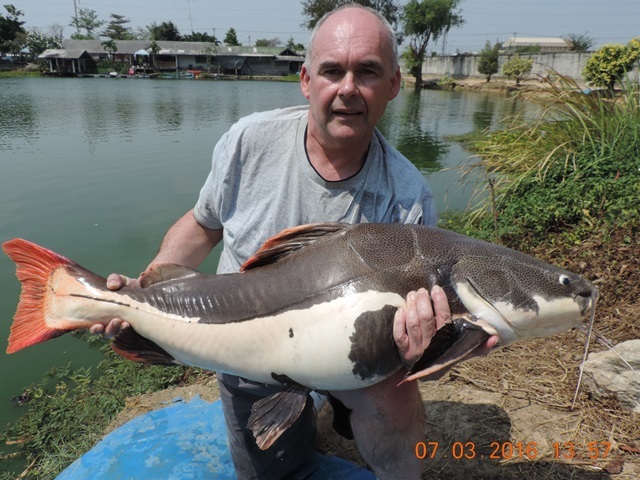 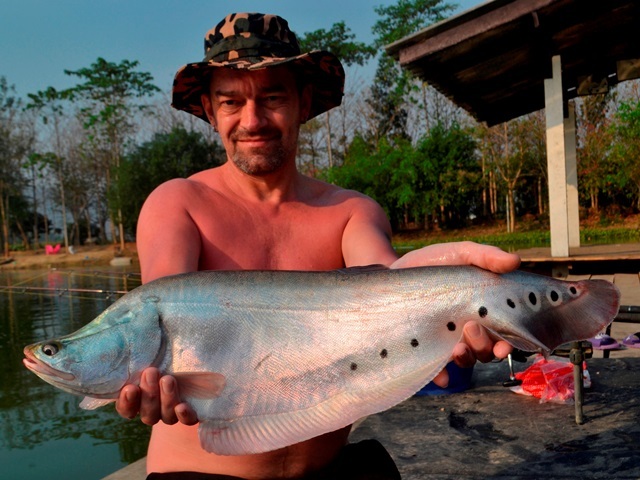 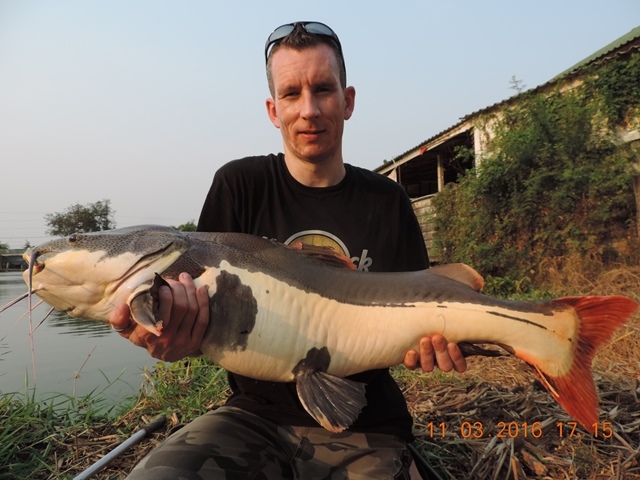 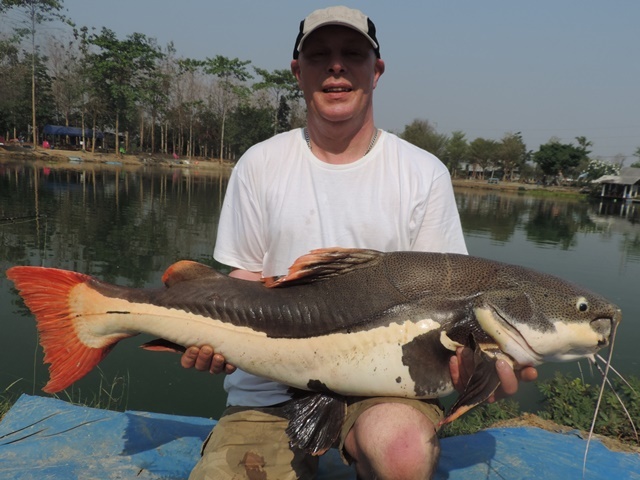 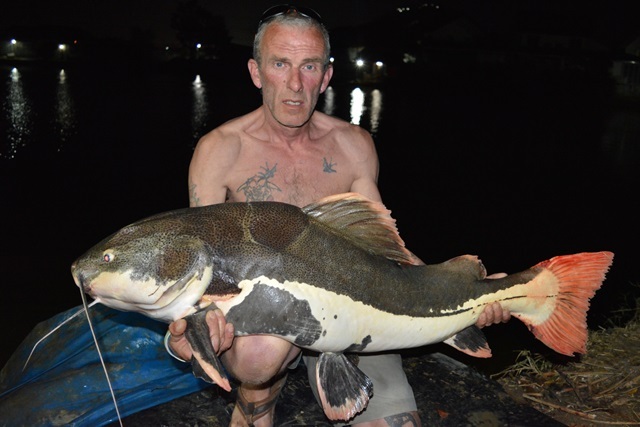 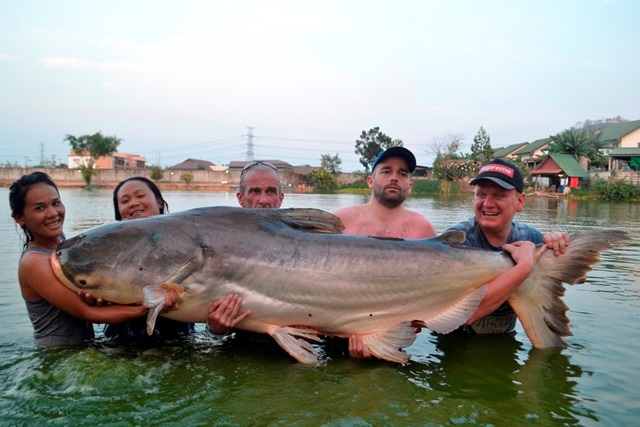 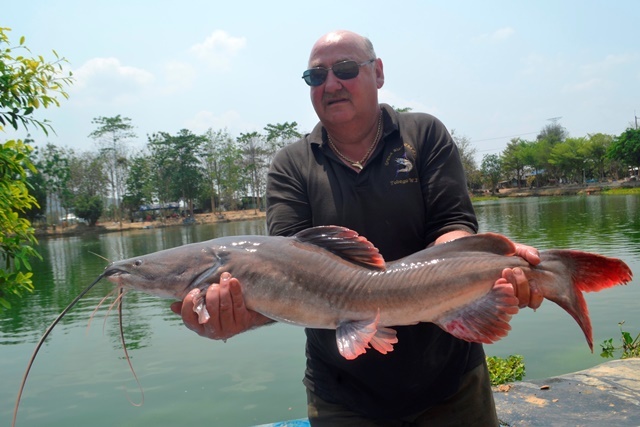 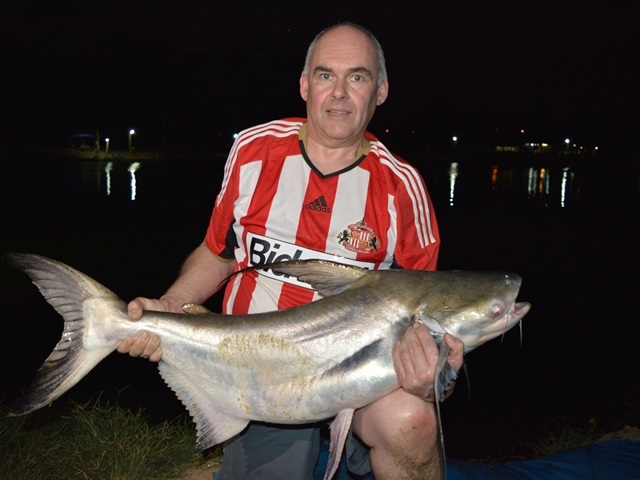 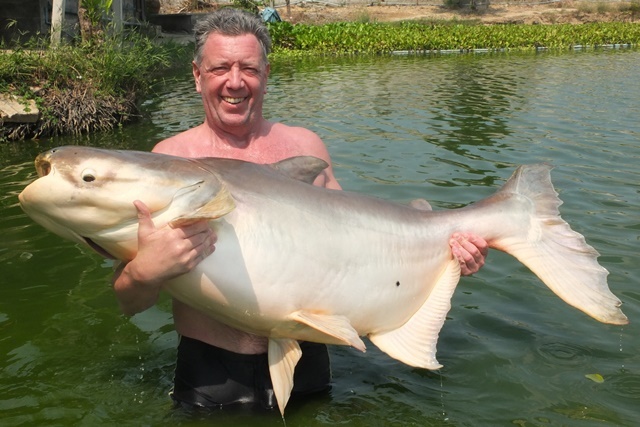 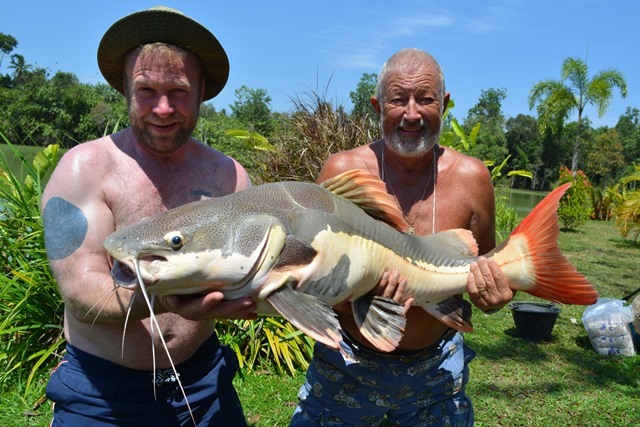 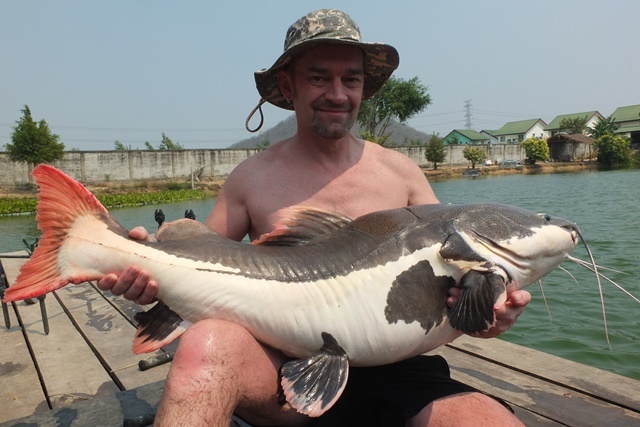 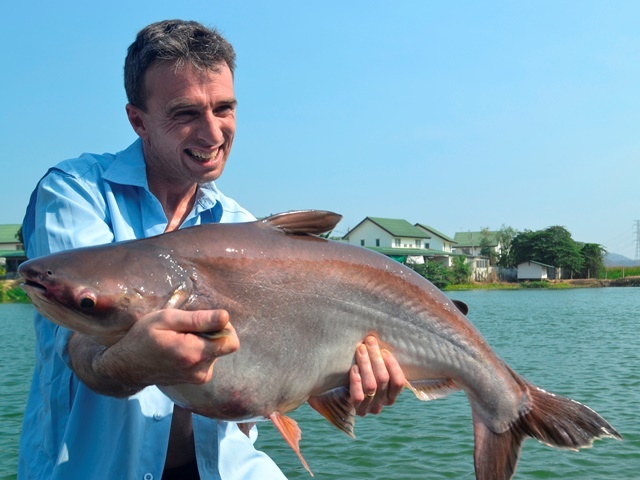 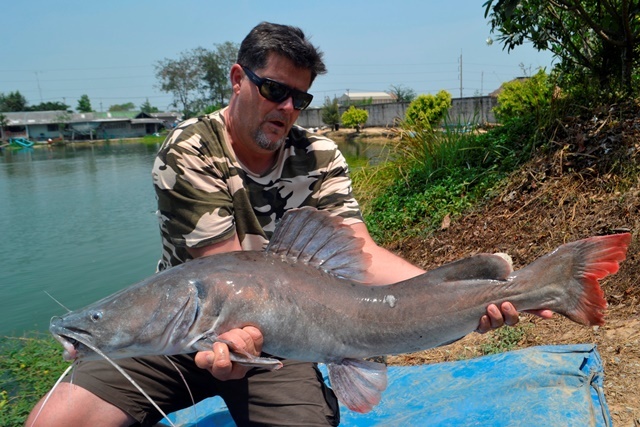 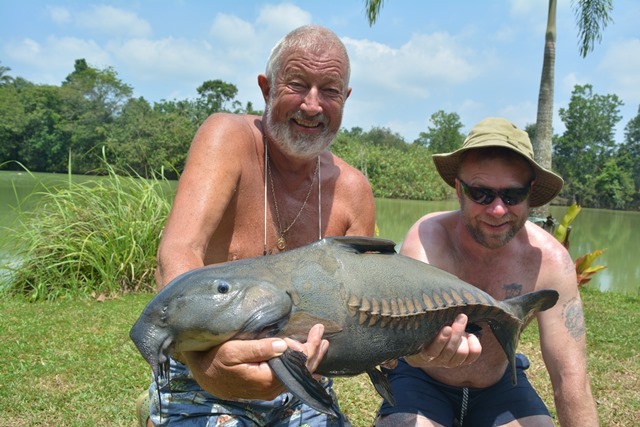 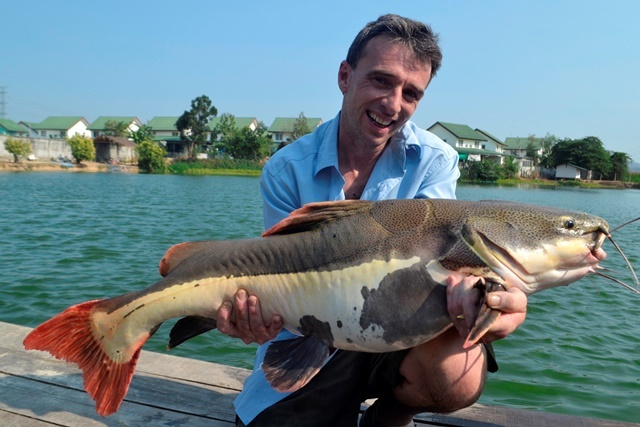 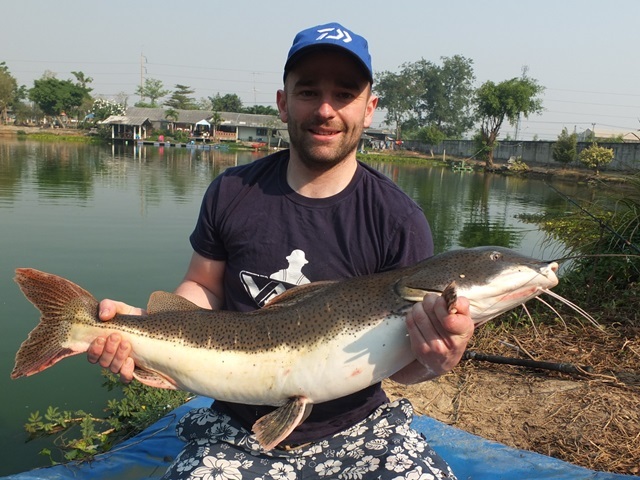 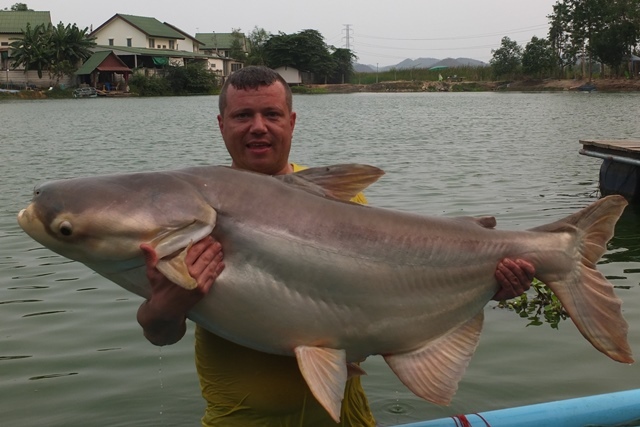 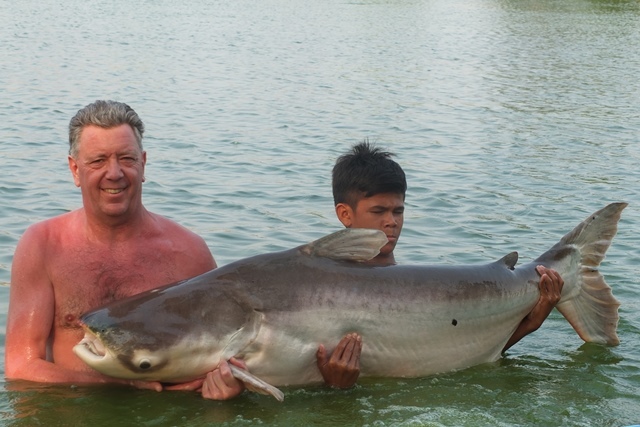 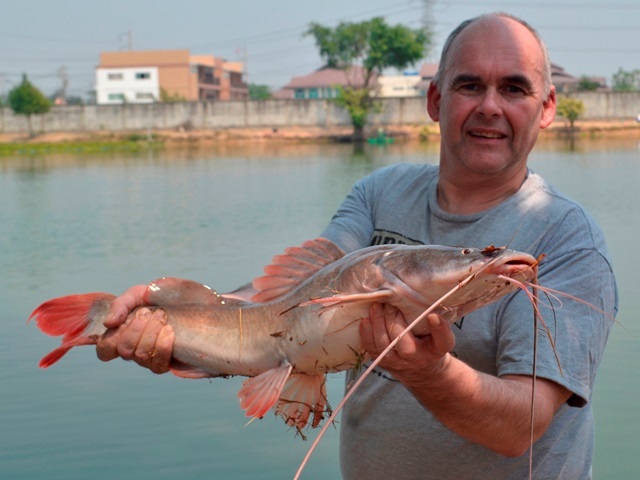 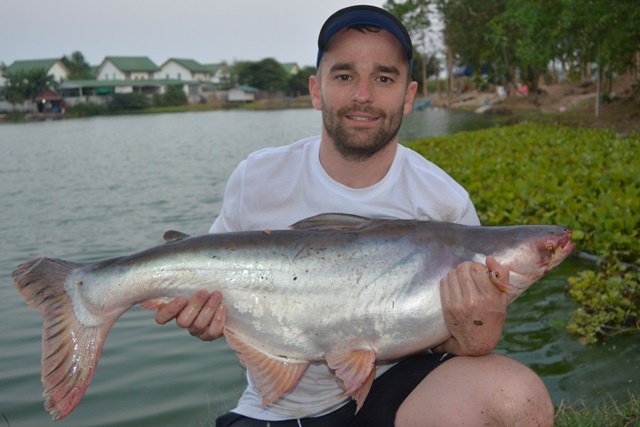 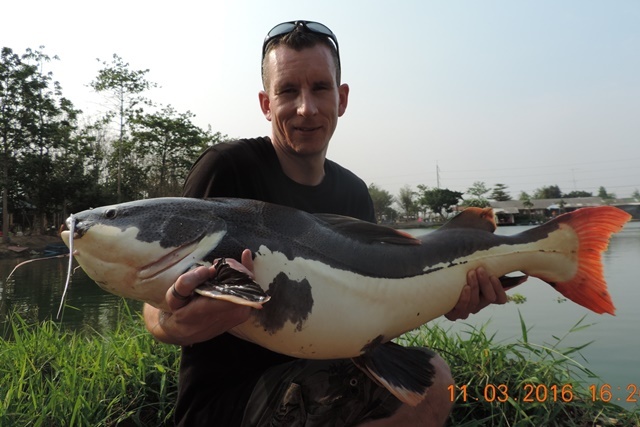 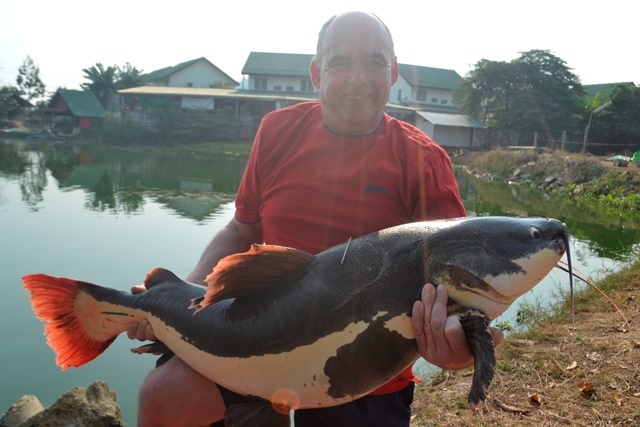 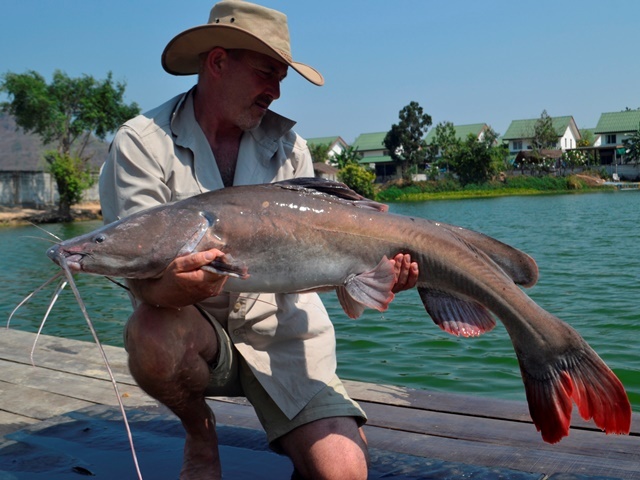 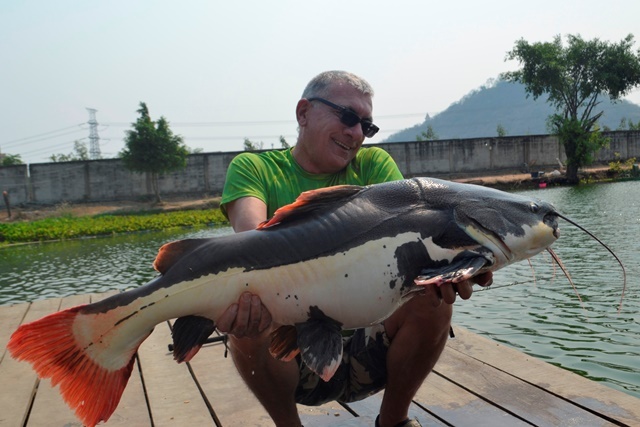 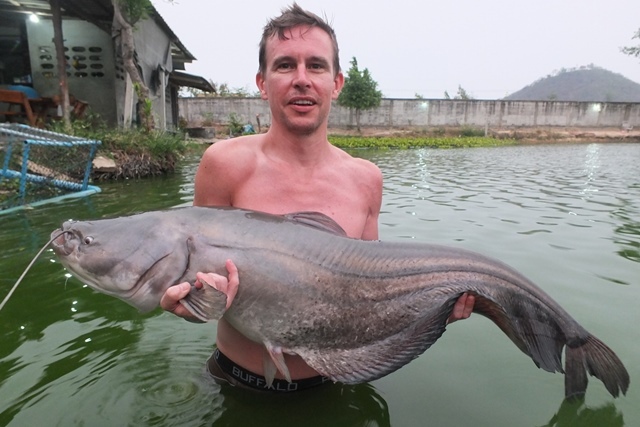 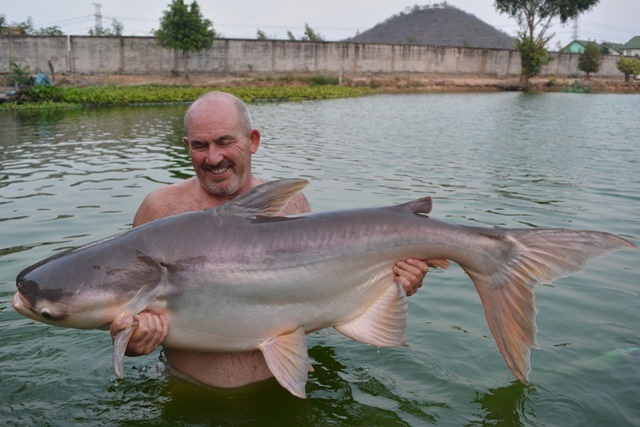 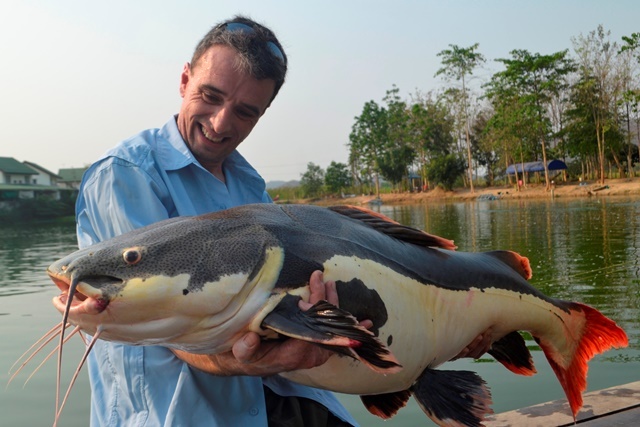 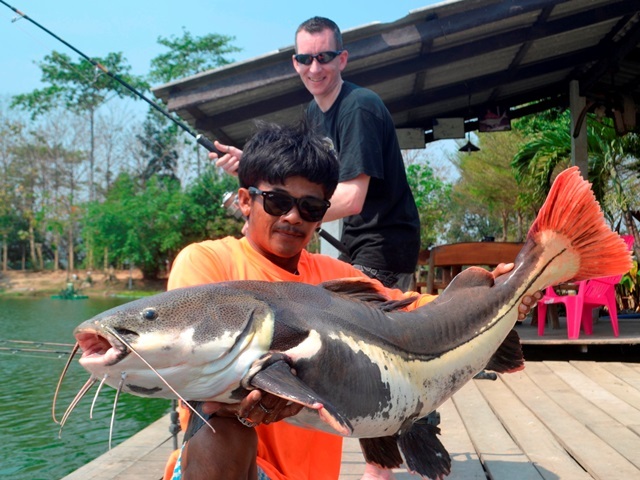 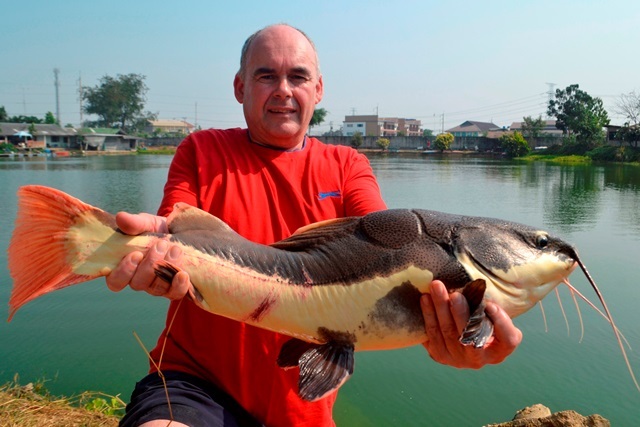 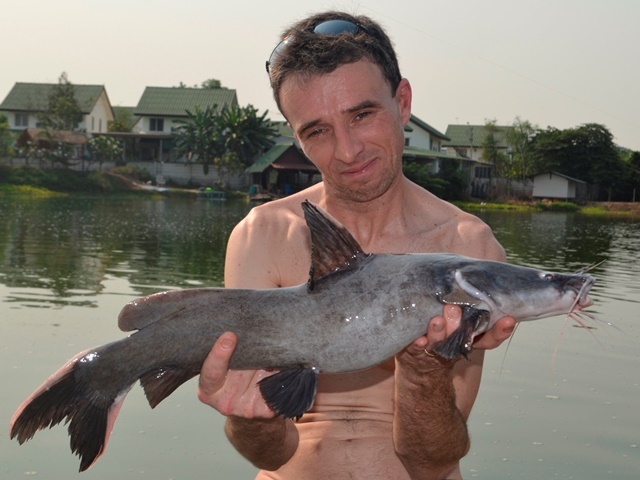 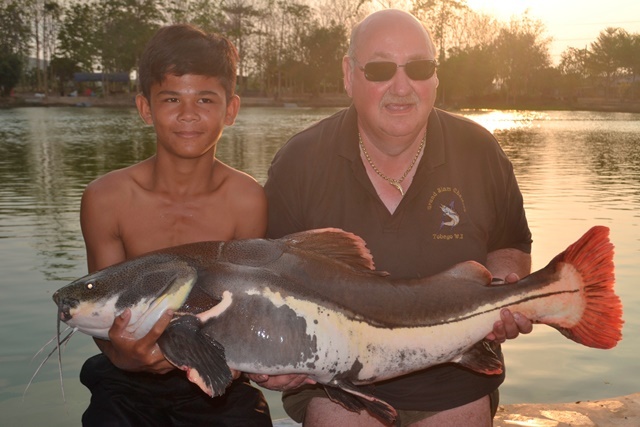 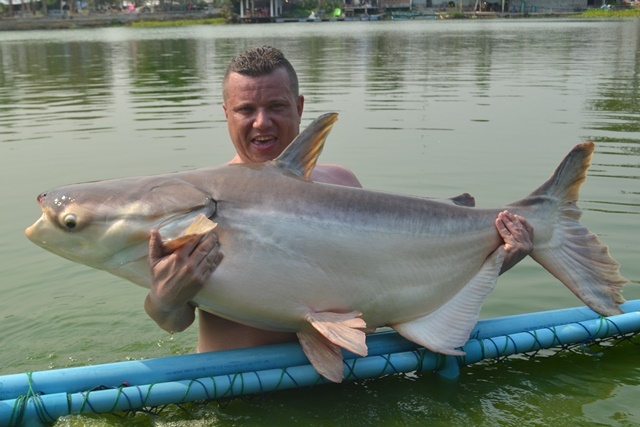 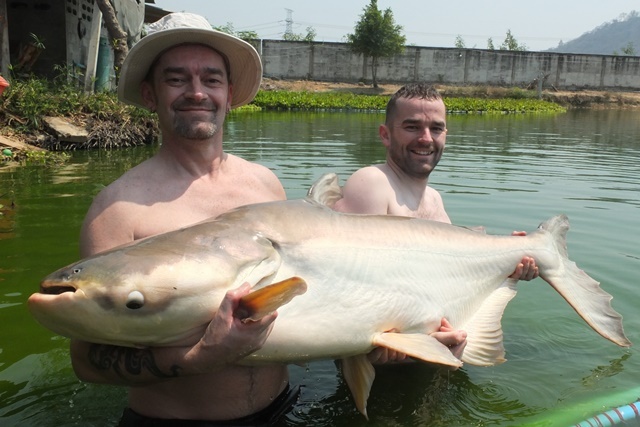 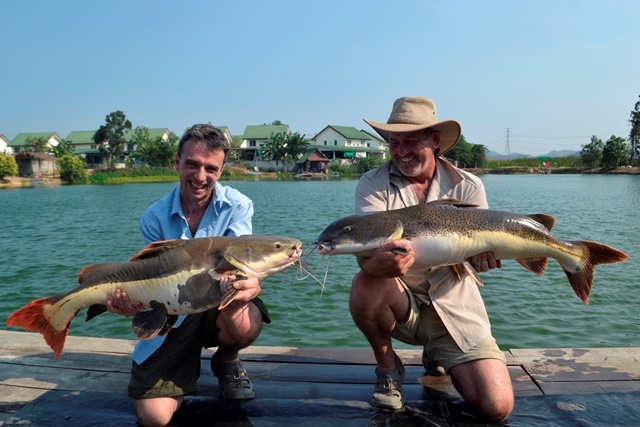 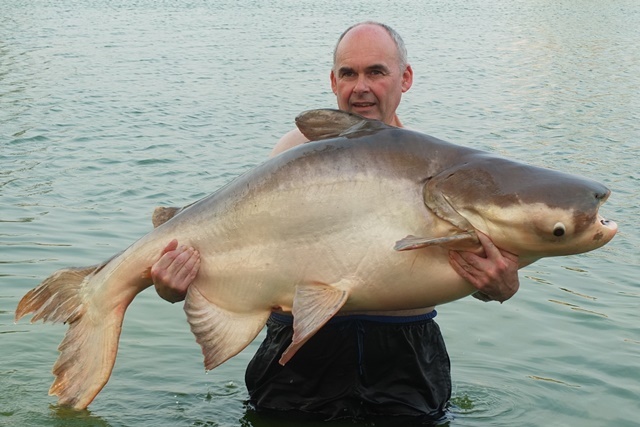 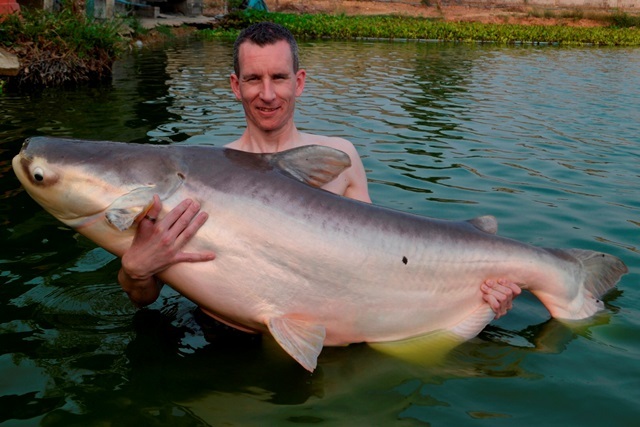 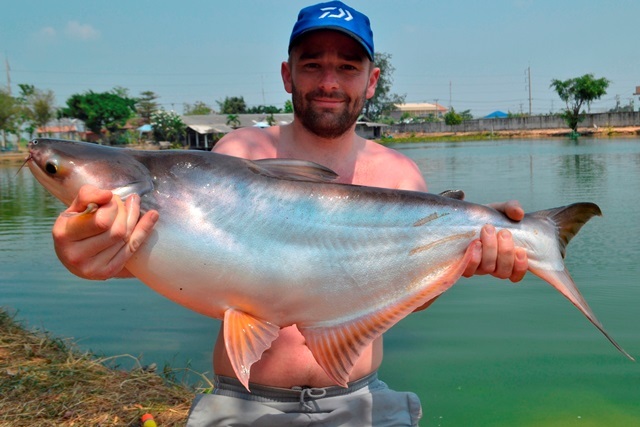 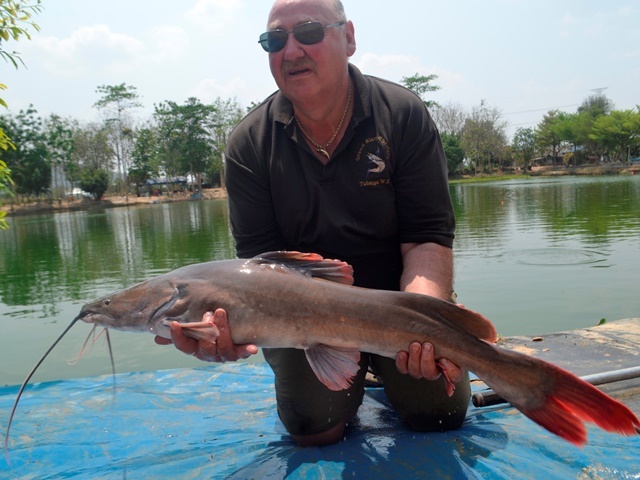 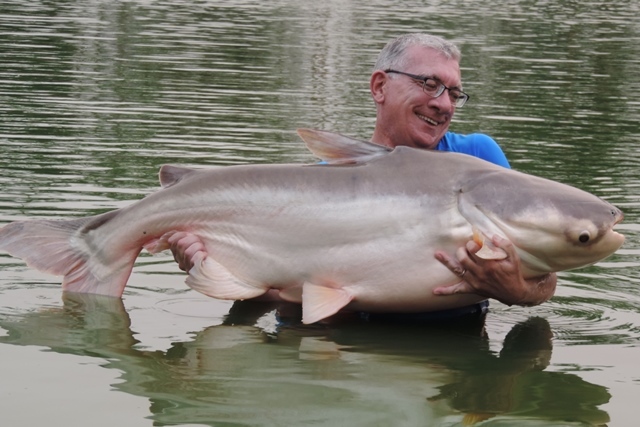 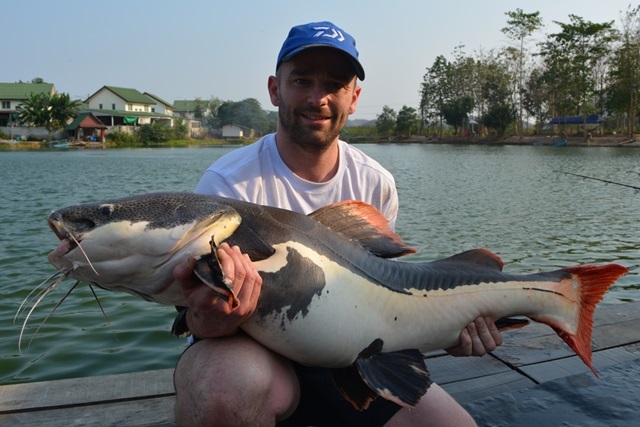 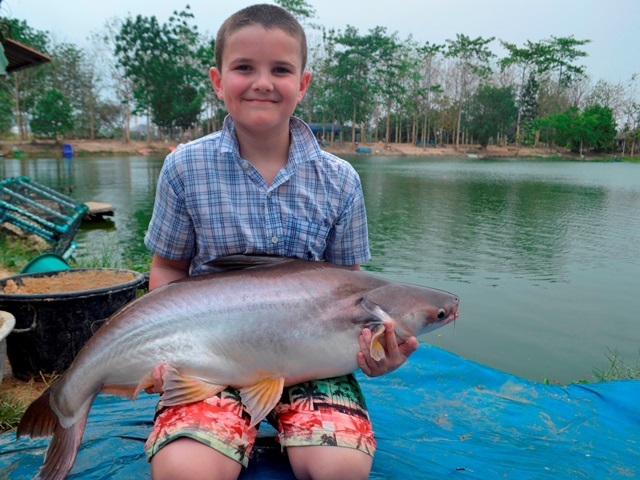 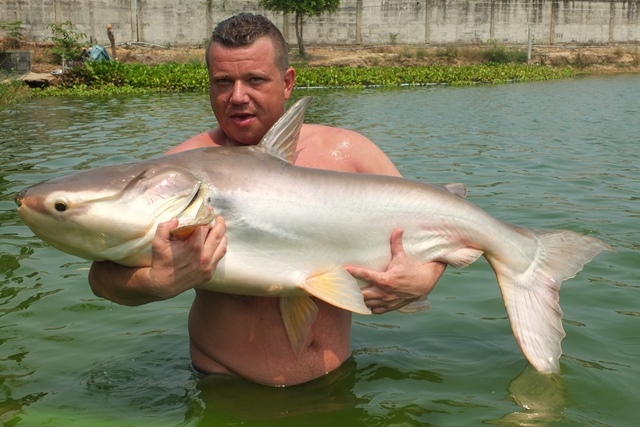 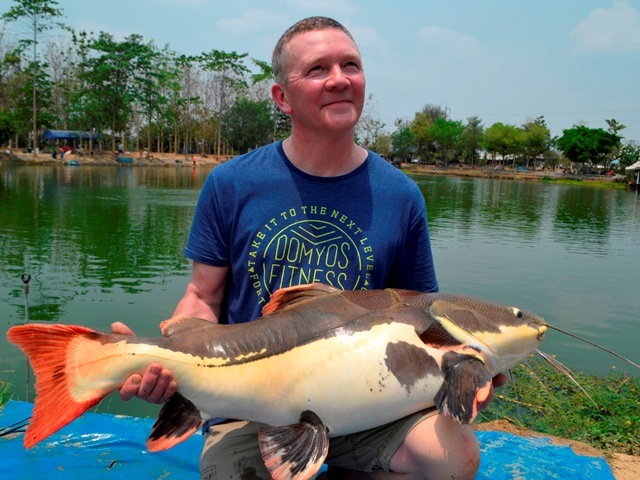 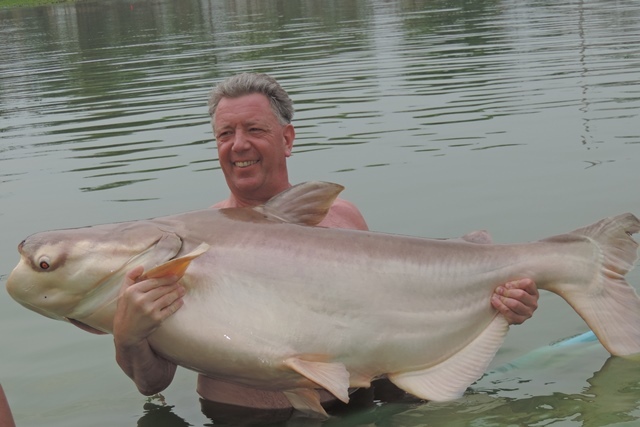 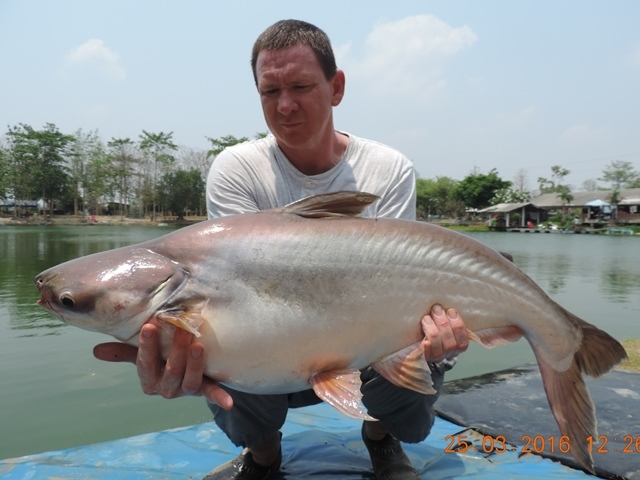 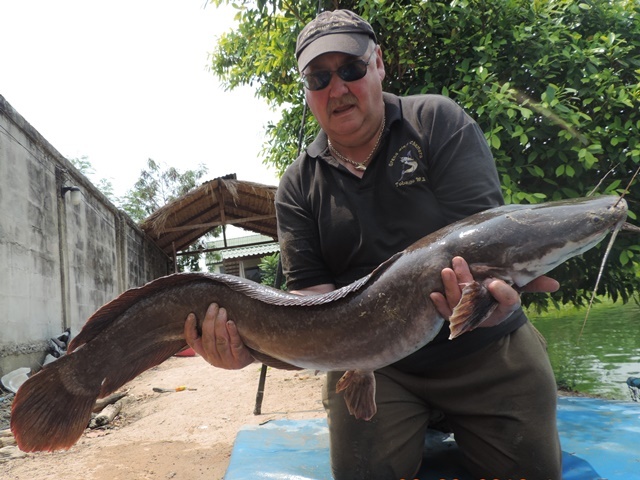 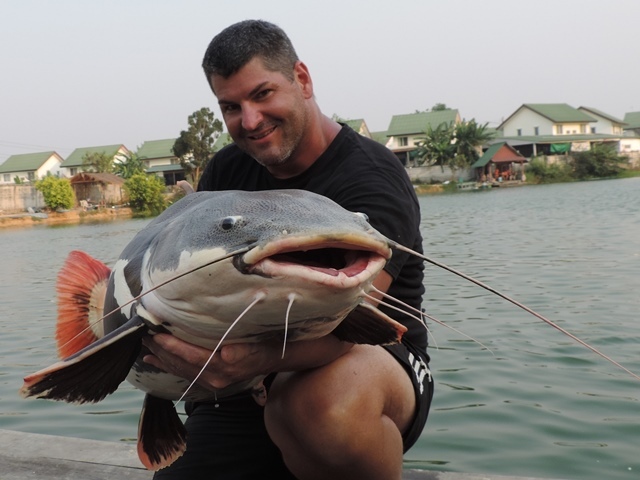 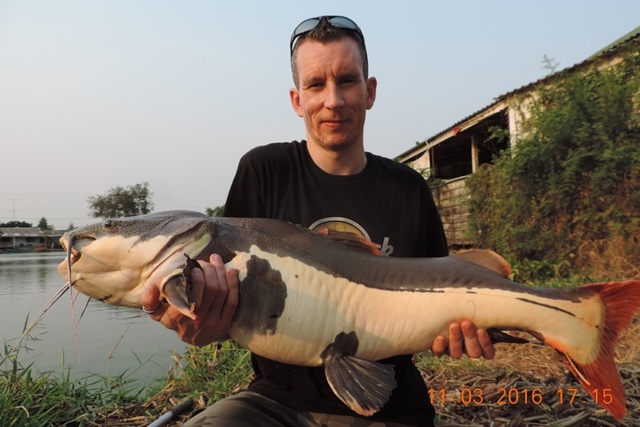 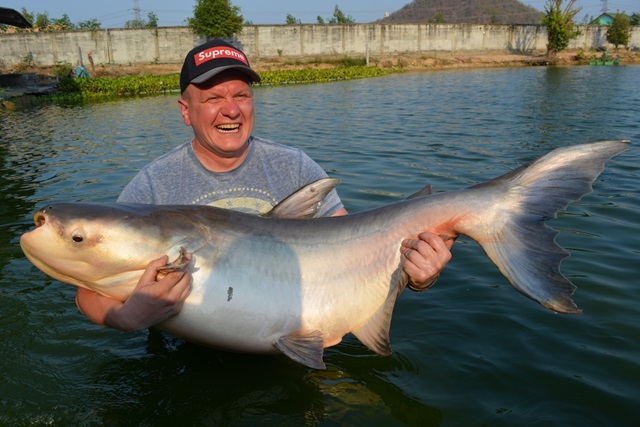 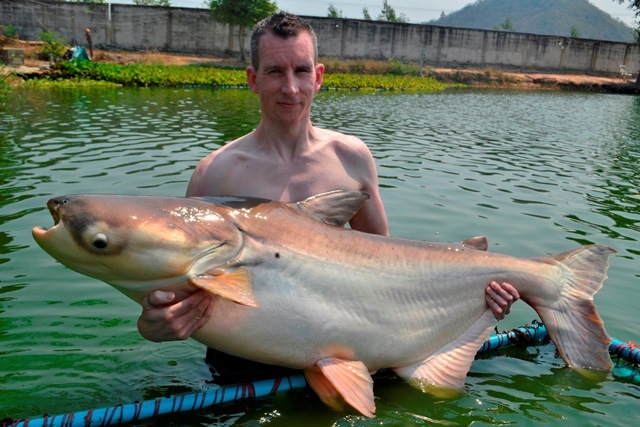 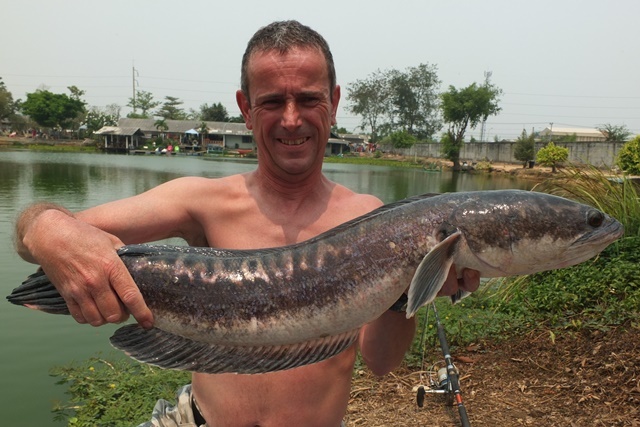 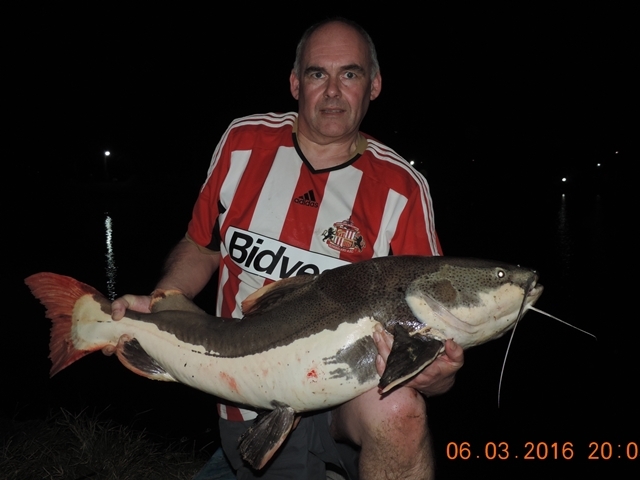 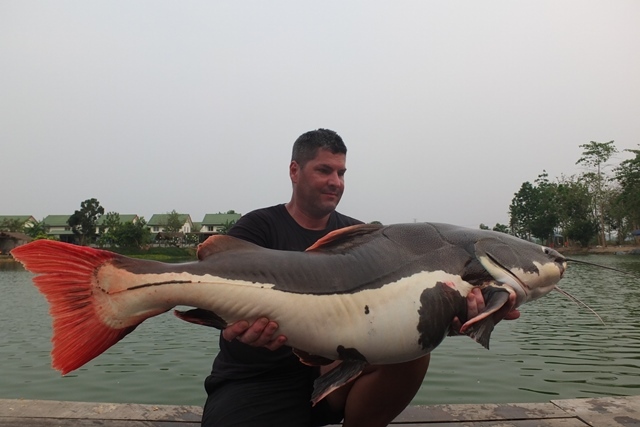 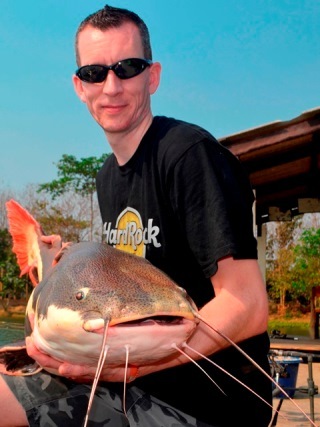 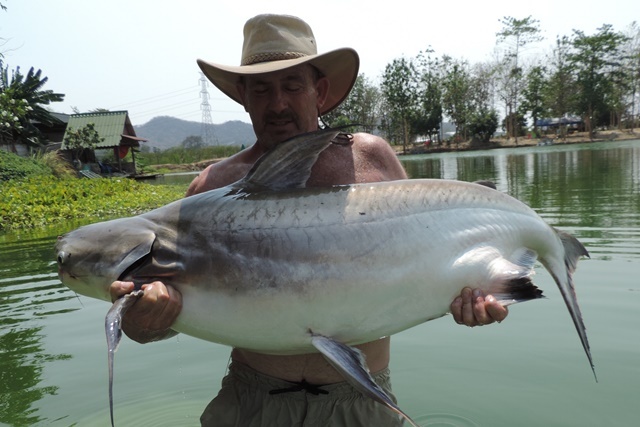 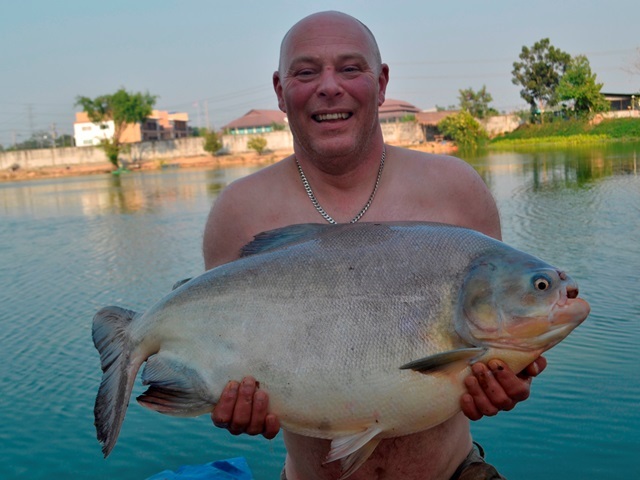 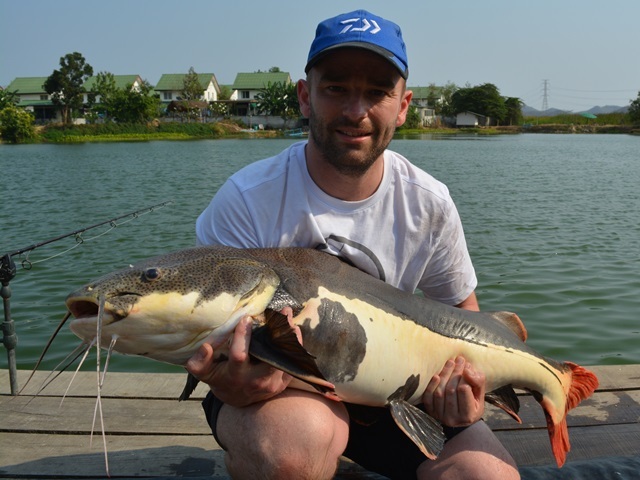 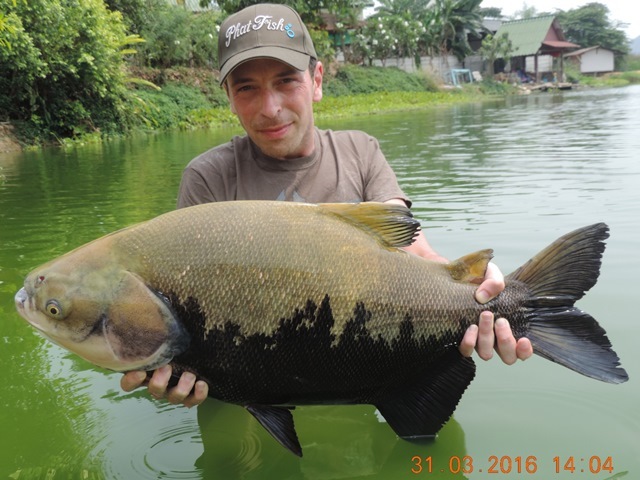 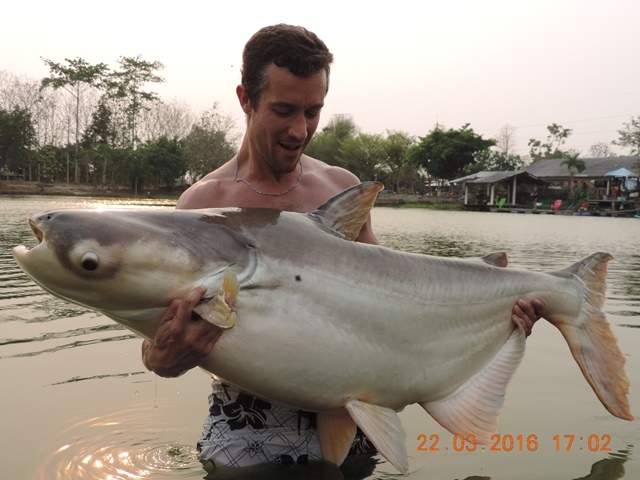 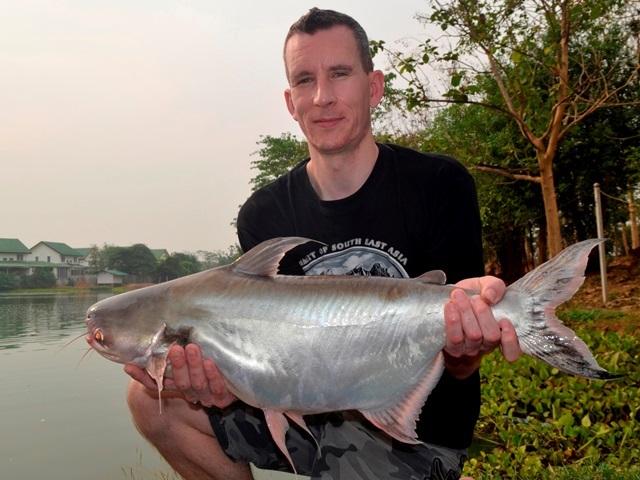 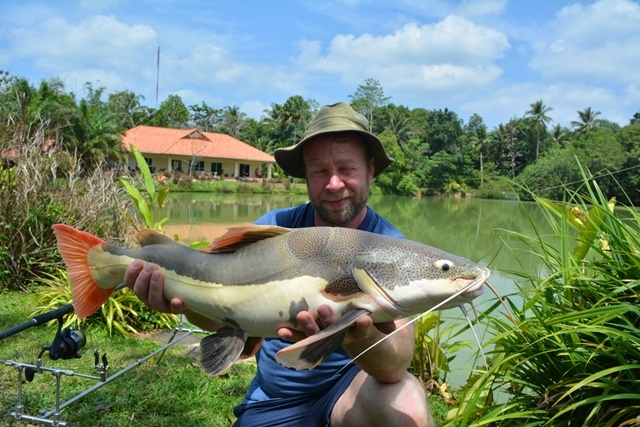 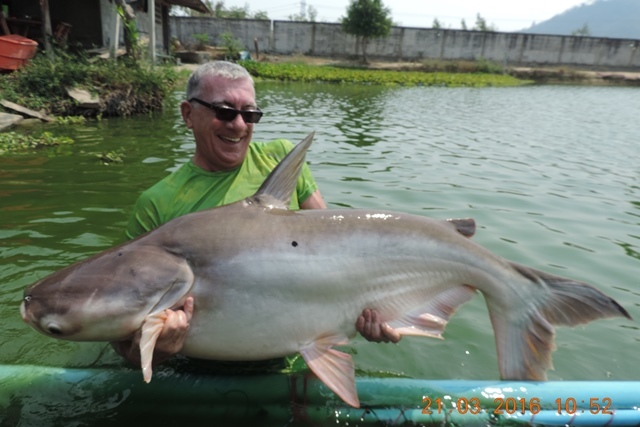 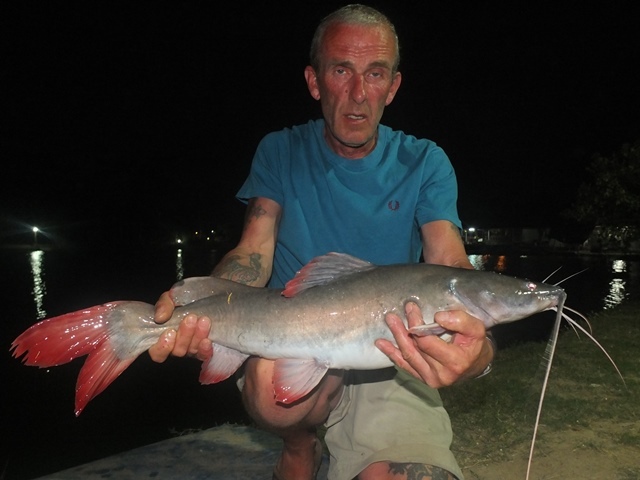 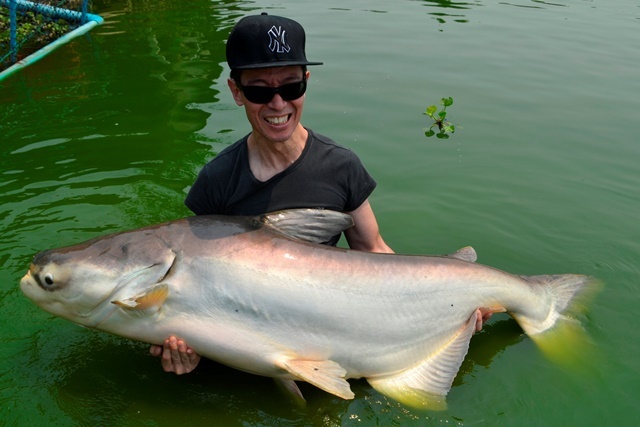 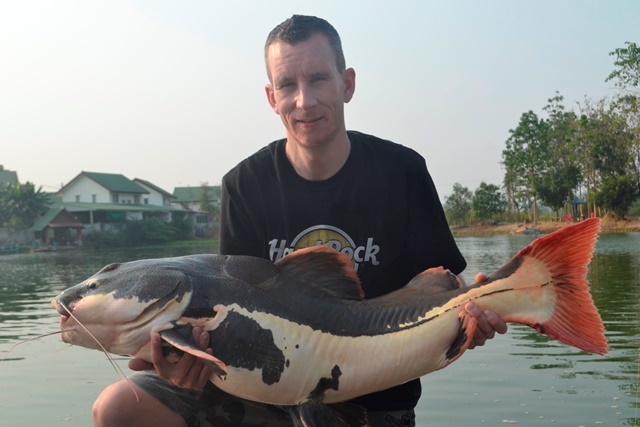 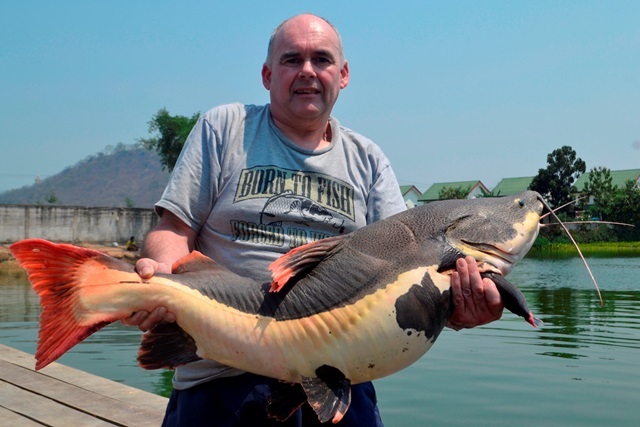 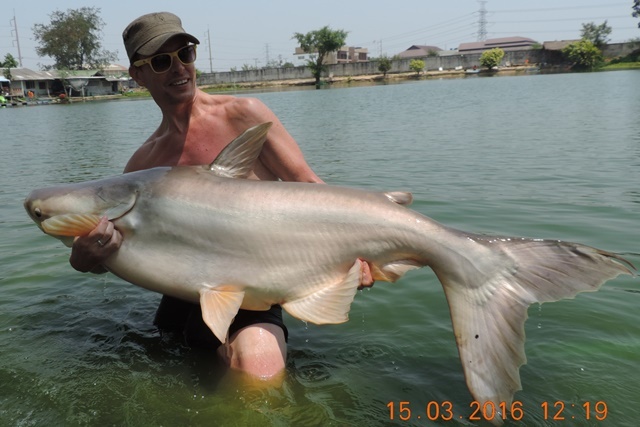 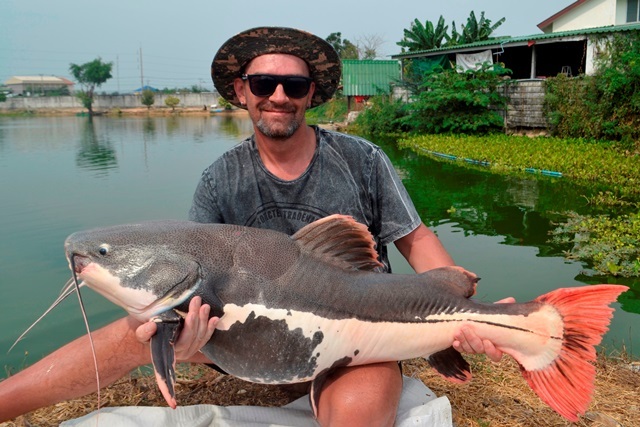 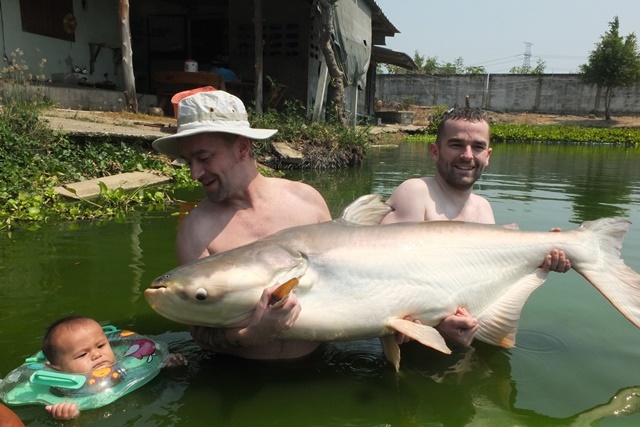 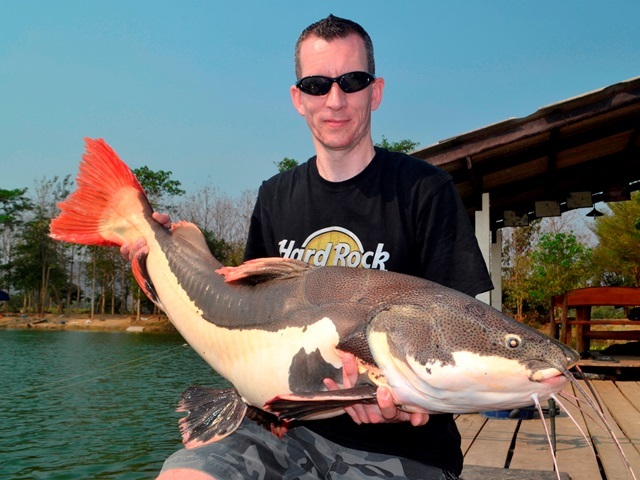 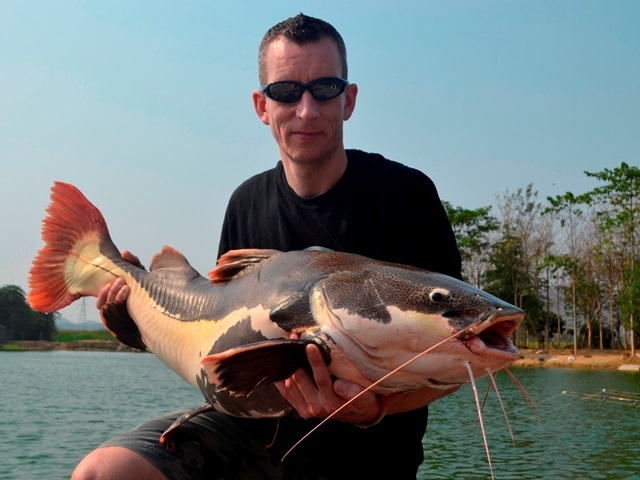 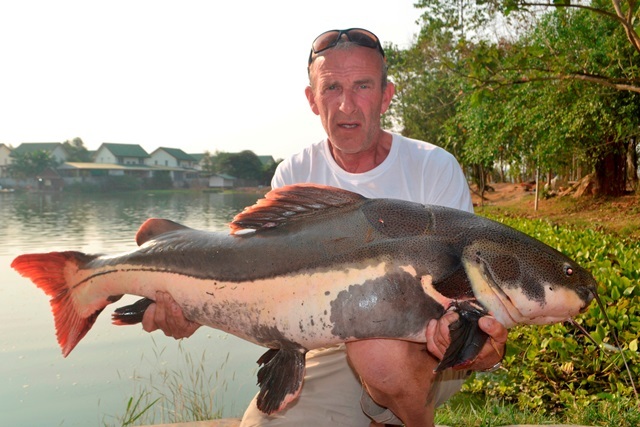 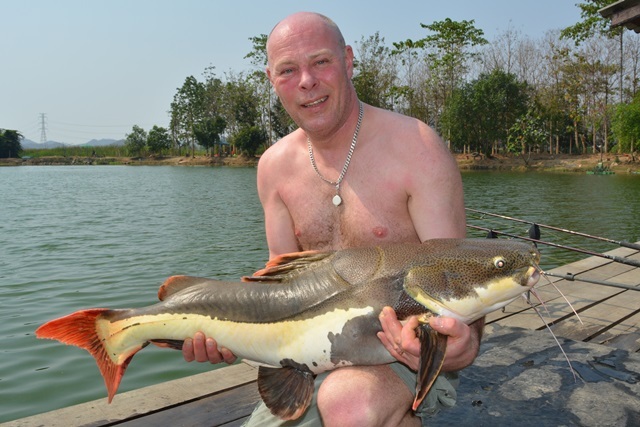 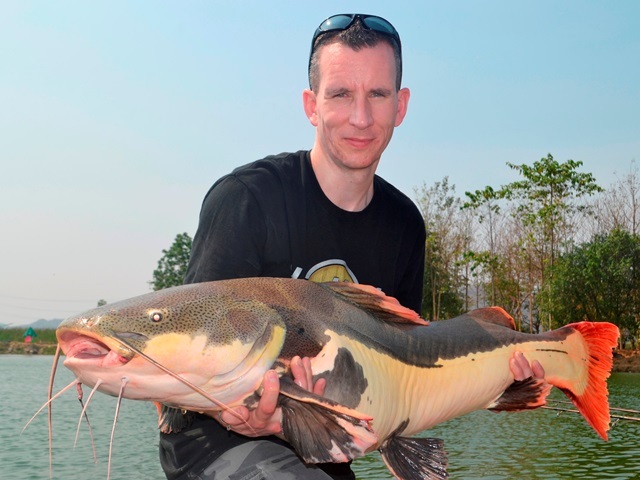 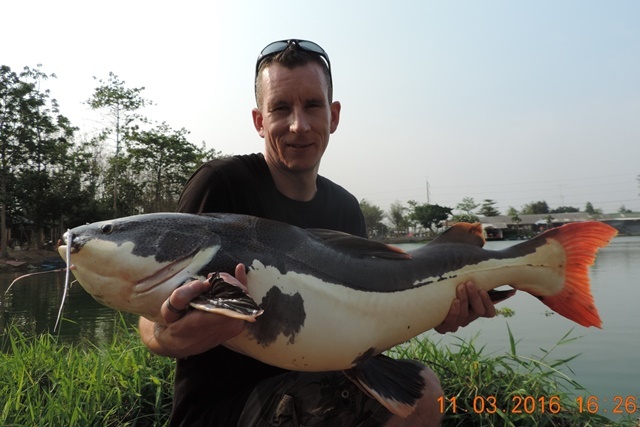 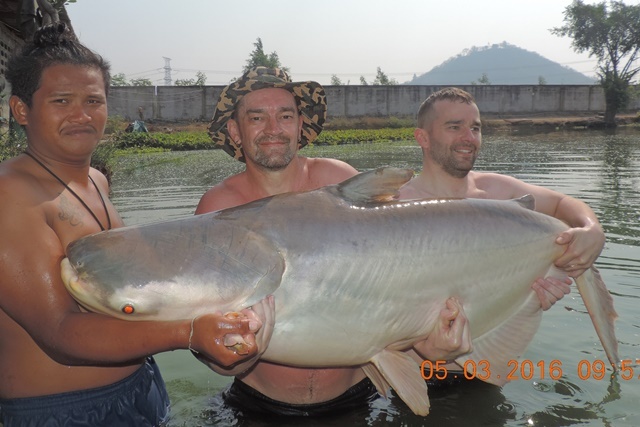 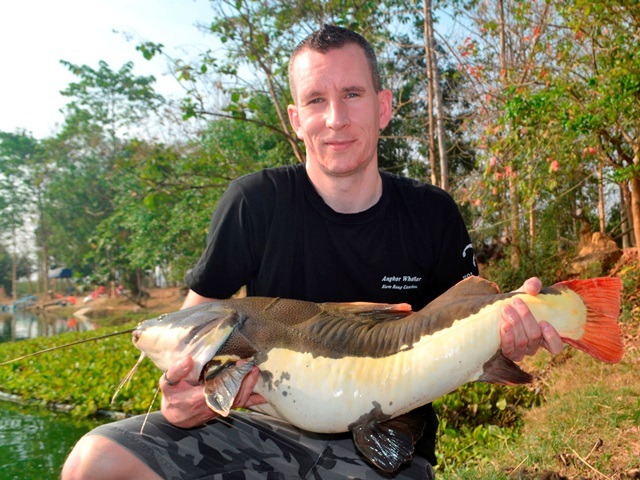 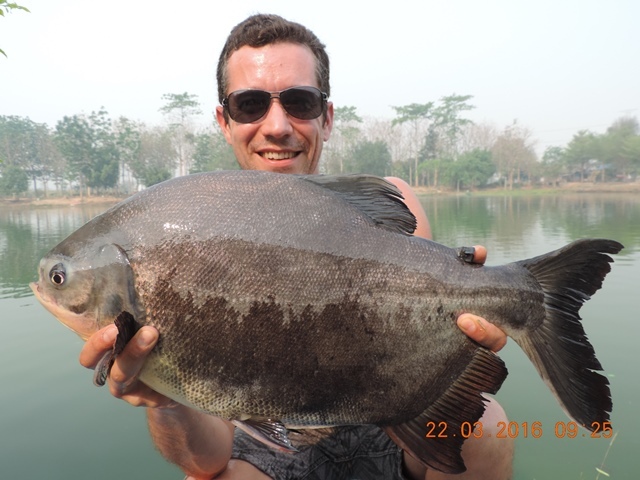 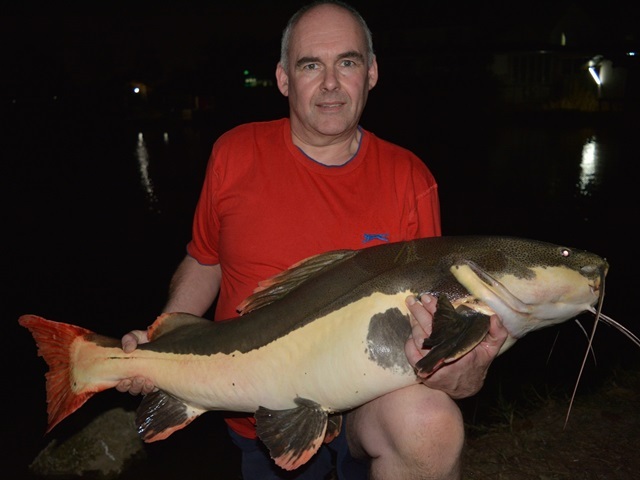 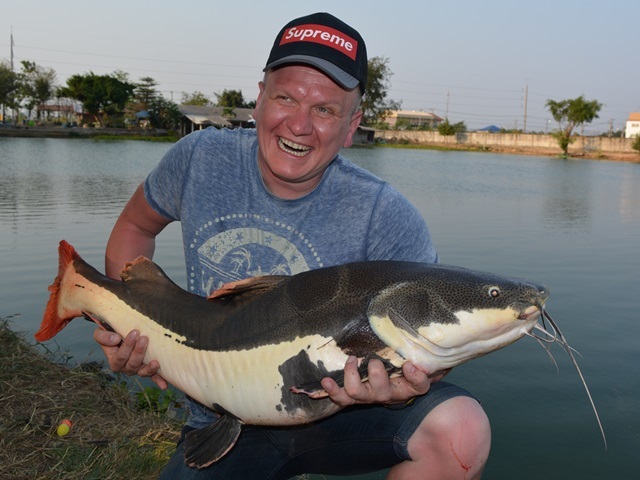 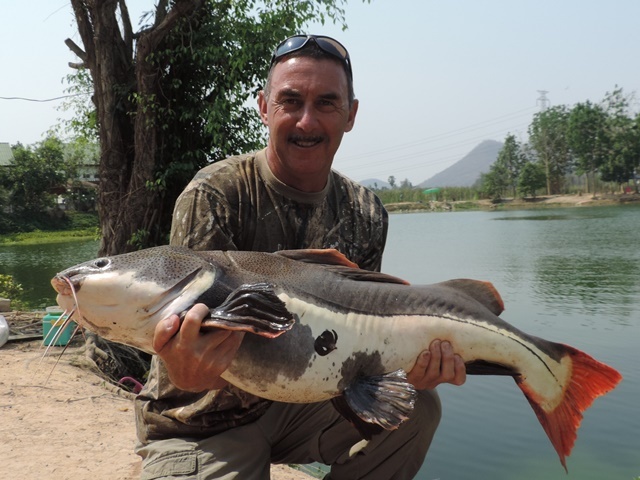 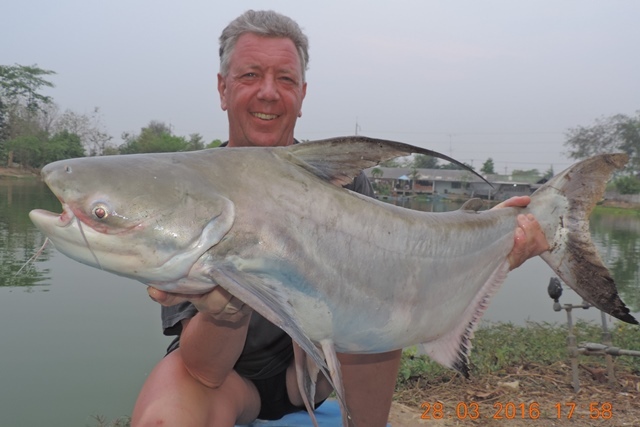 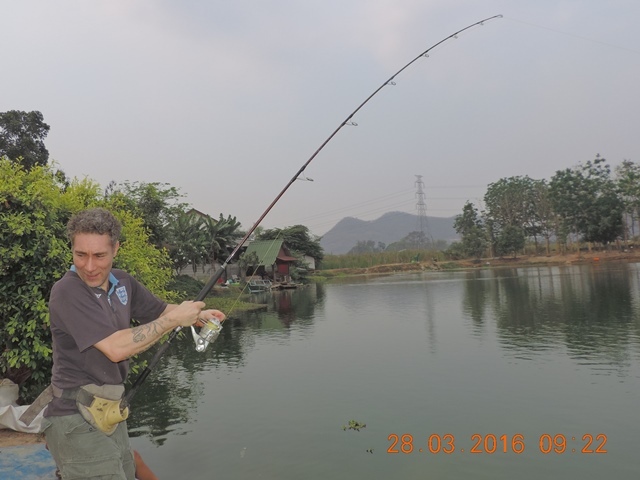 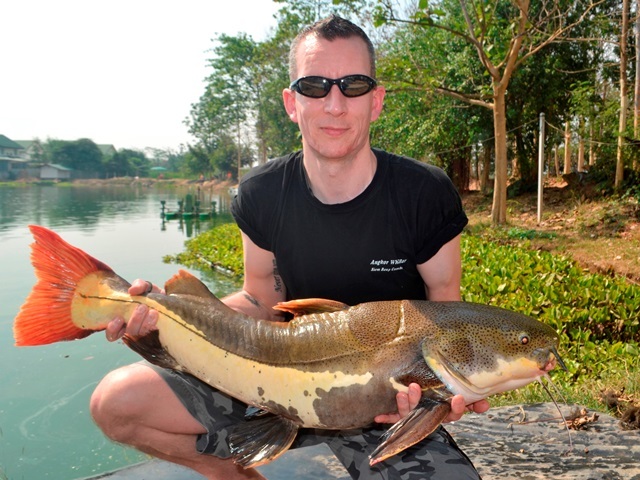 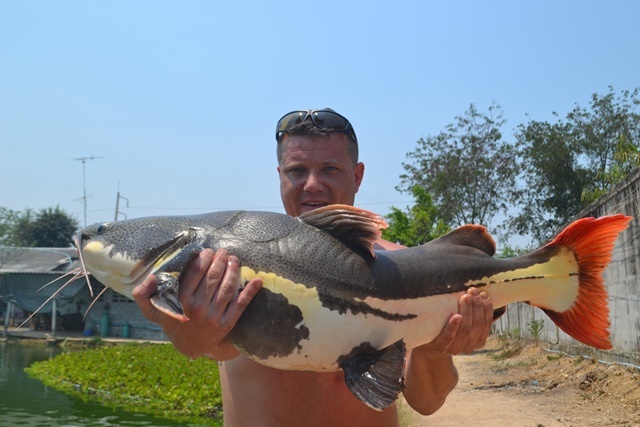 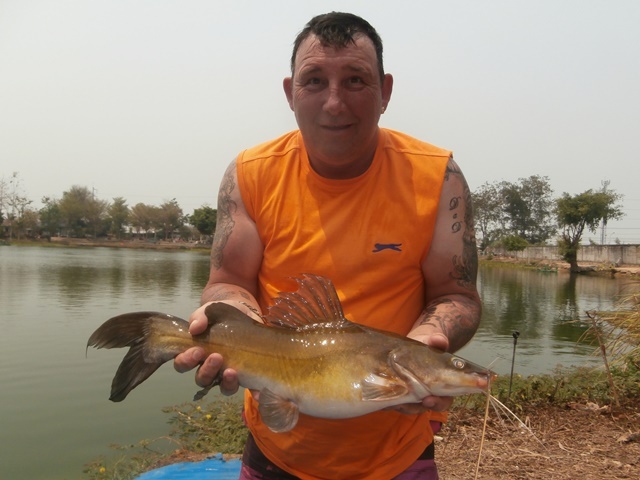 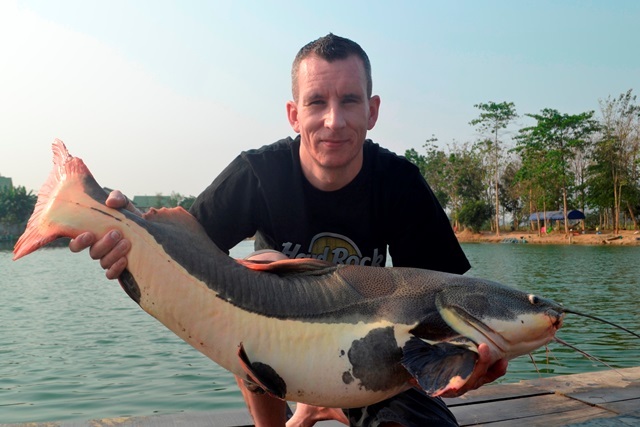 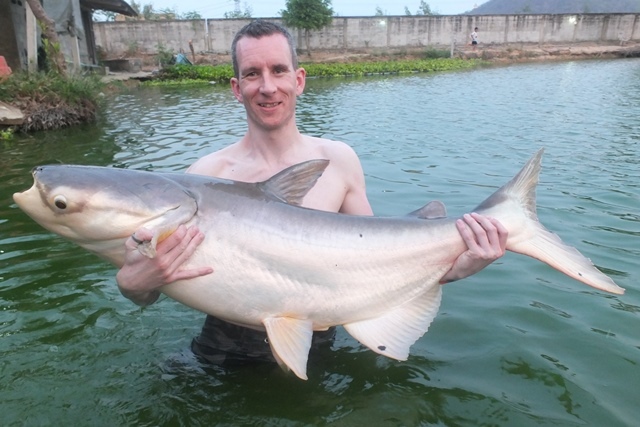 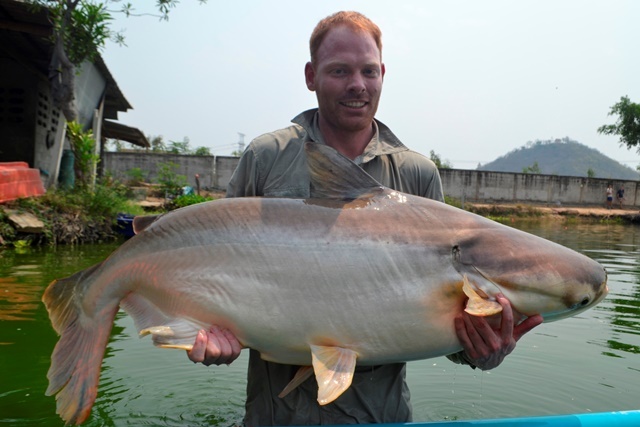 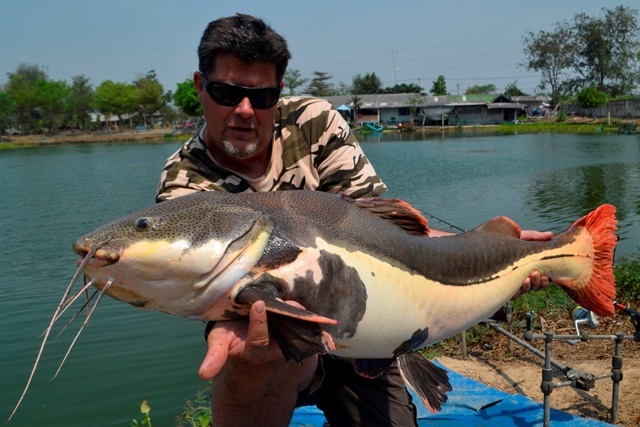 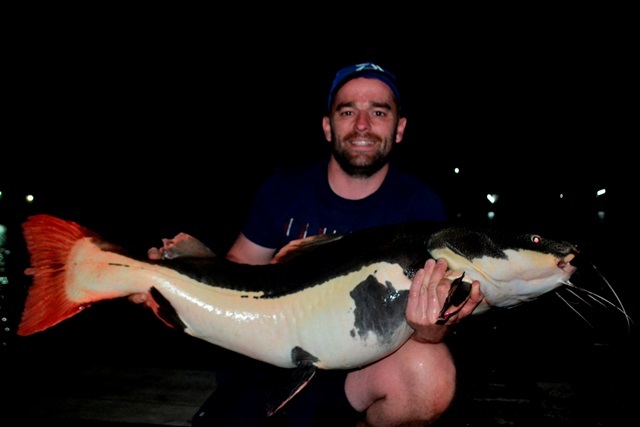 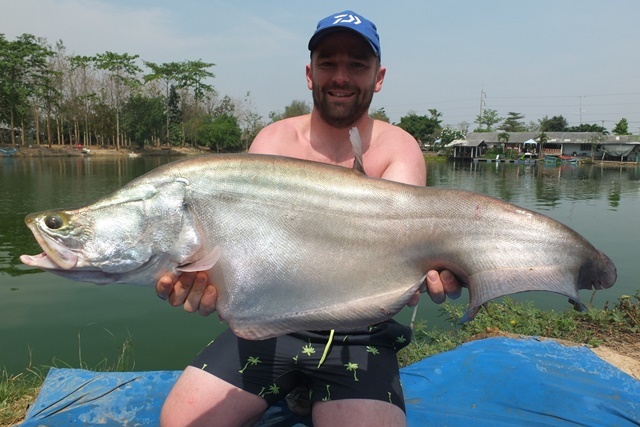 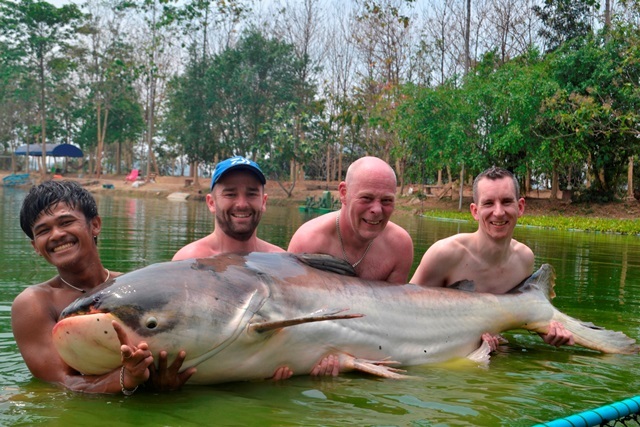 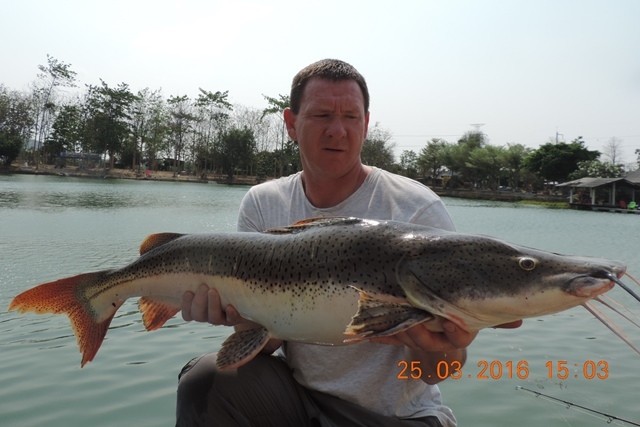 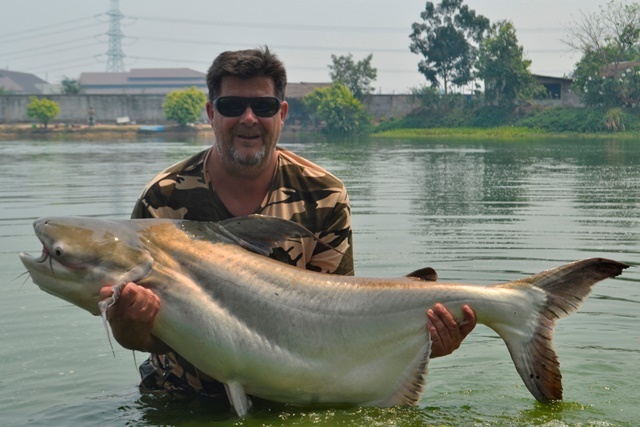 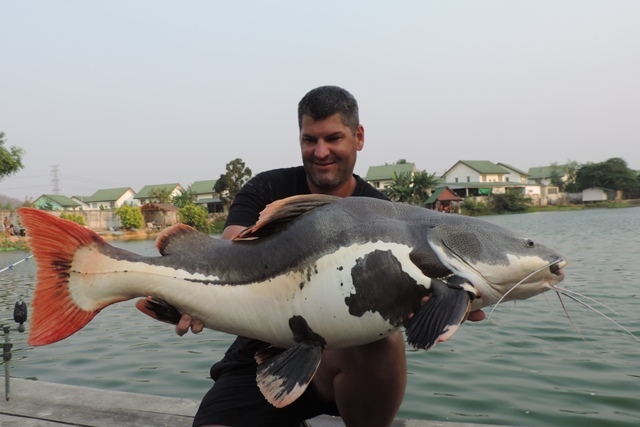 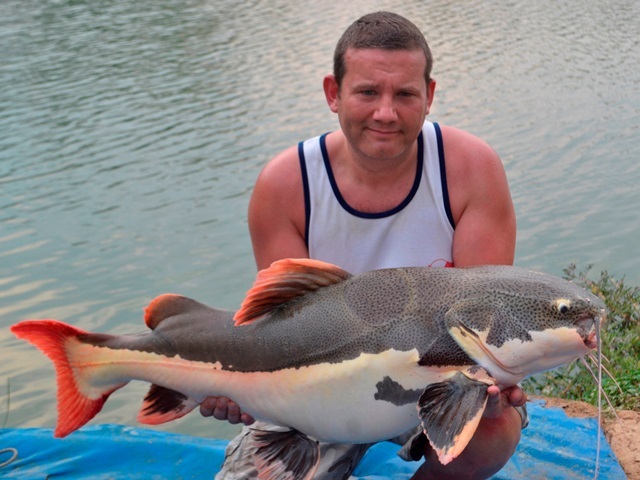 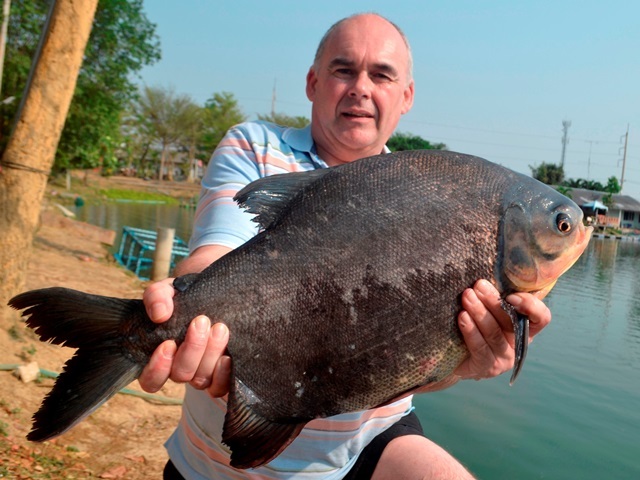 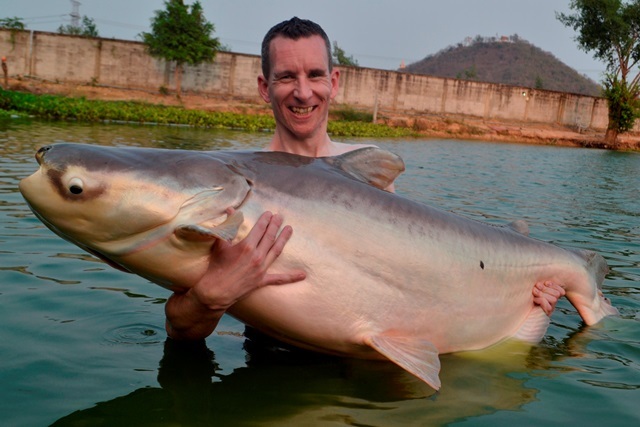 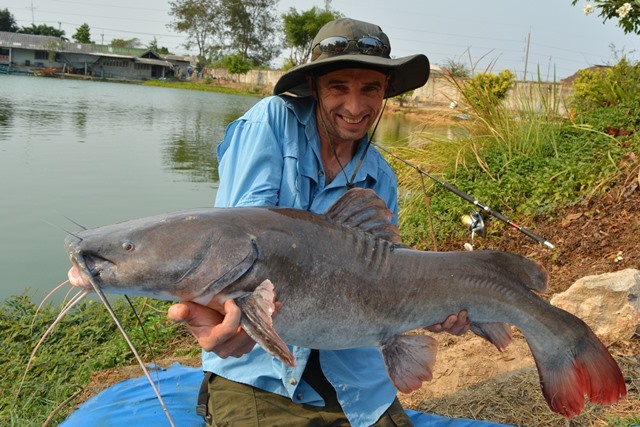 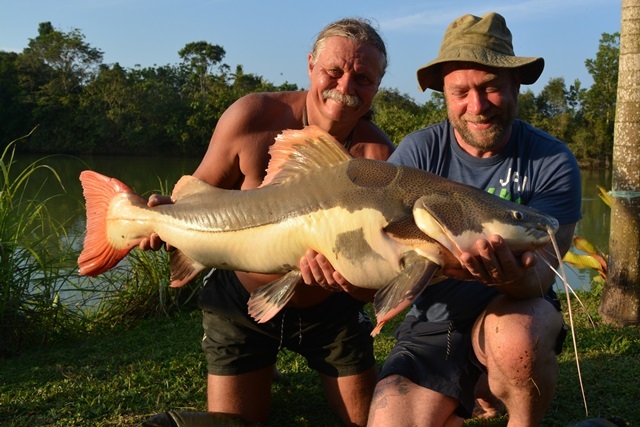 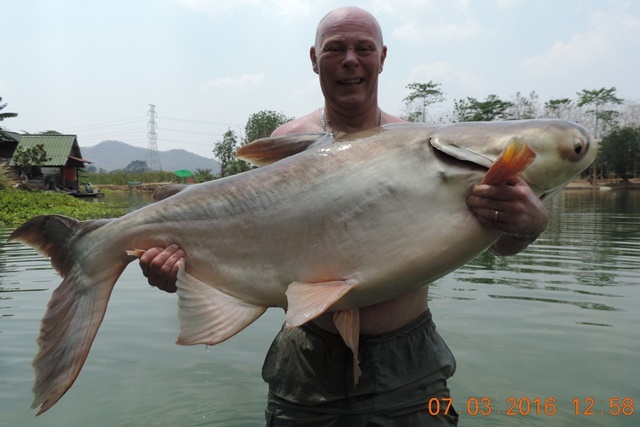 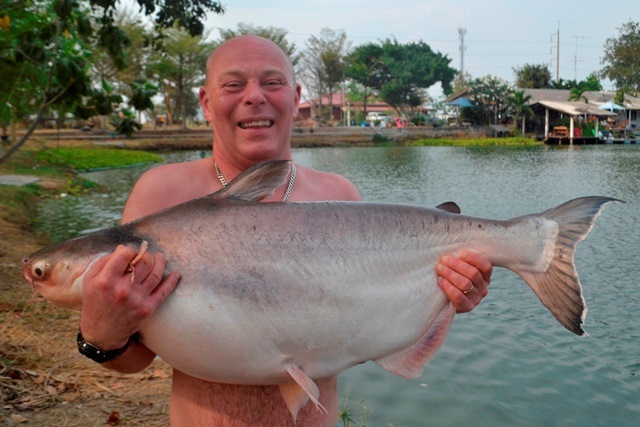 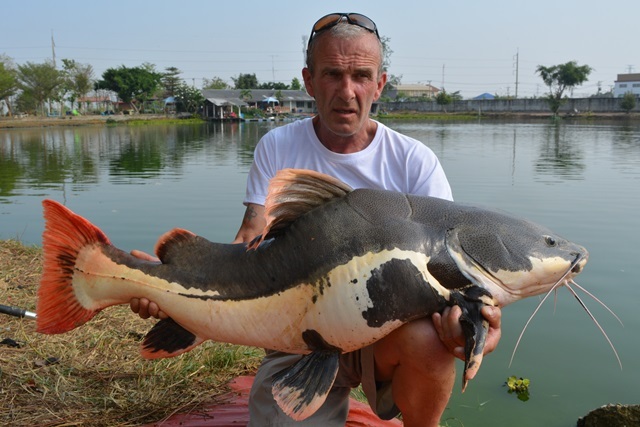 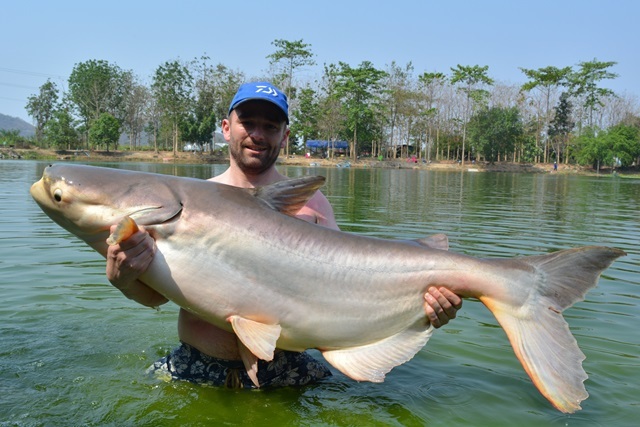 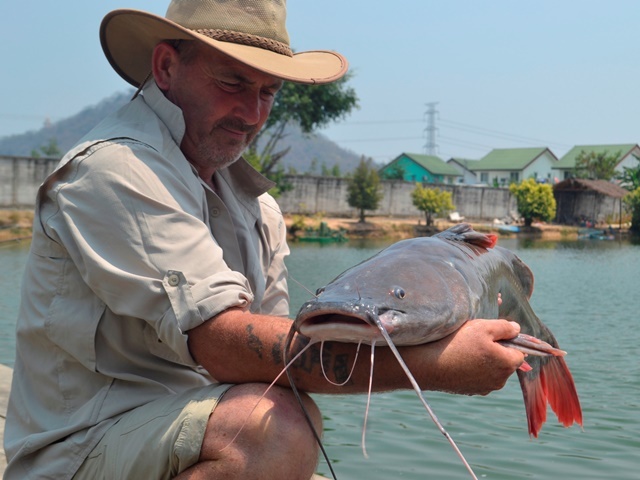 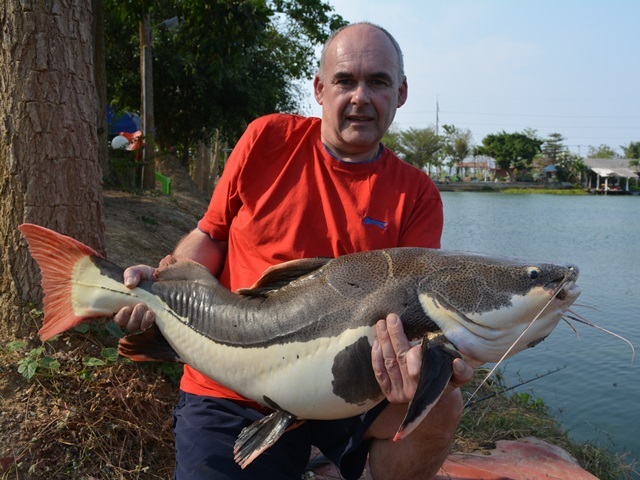 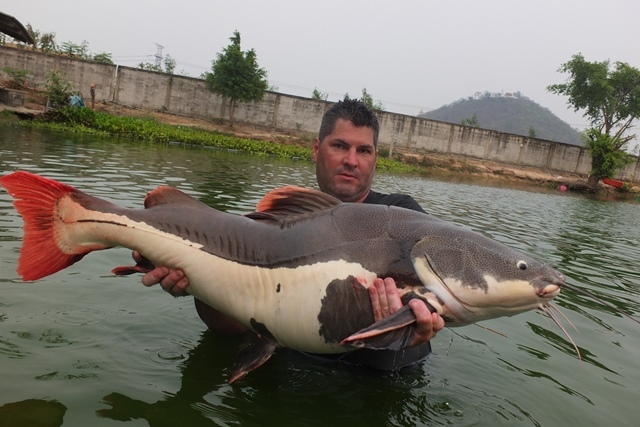 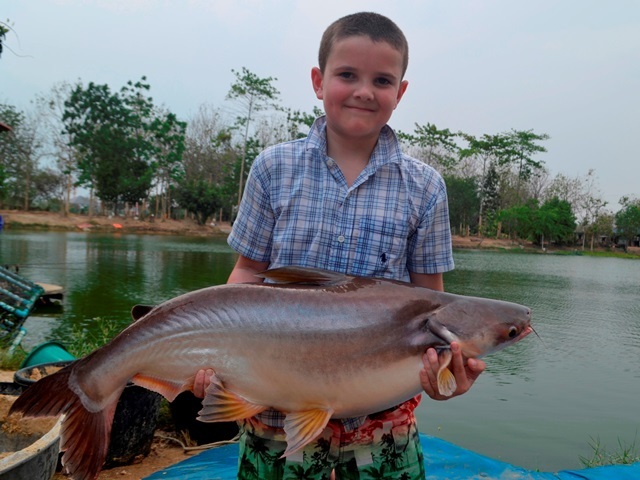 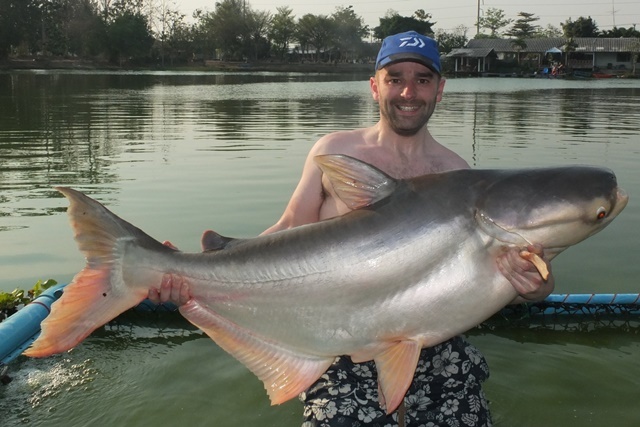 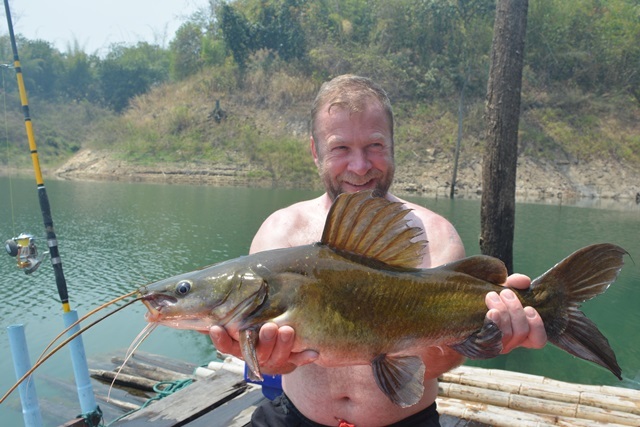 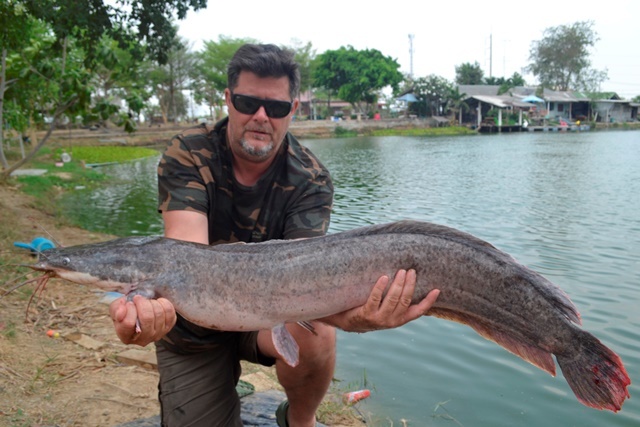 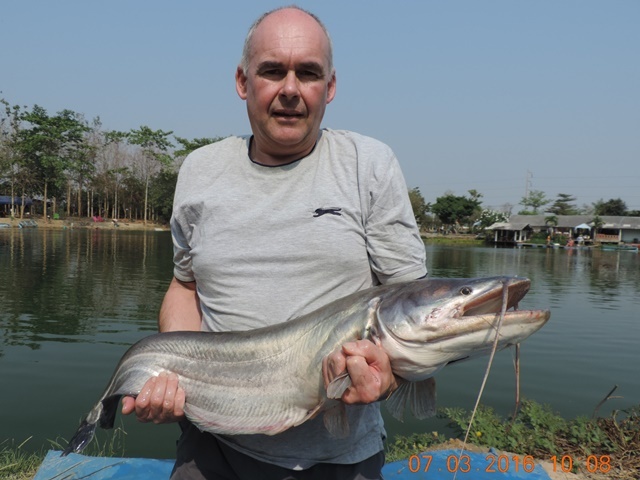 Danny Chappell (aka Mr Bean) was back and as easily over excited as ever and was well chuffed with his catches that also saw him gain membership of the ever expanding Palm Tree Lagoon 300lb Catfish Clun with a monster Mekong that took over two hours to land. 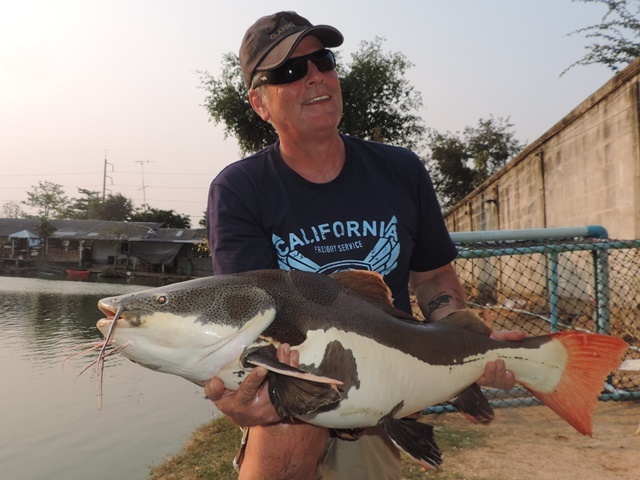 He also caught an awesome Asian redtail as well as big-Y catfish, crystal eyed catfish, black shark minnow, catfish shark, striped catfish and numerous Amazon redtails. 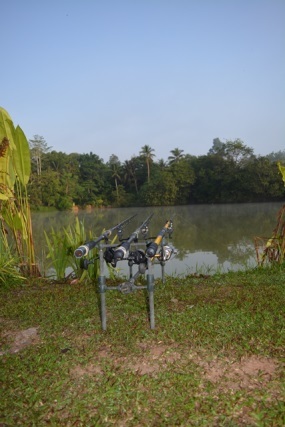 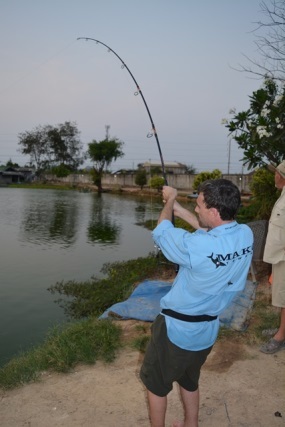 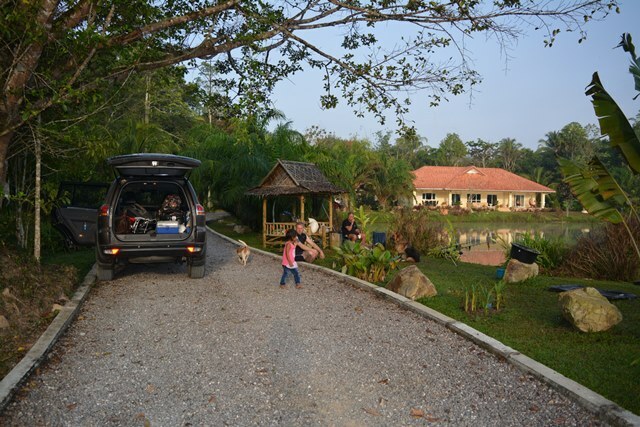 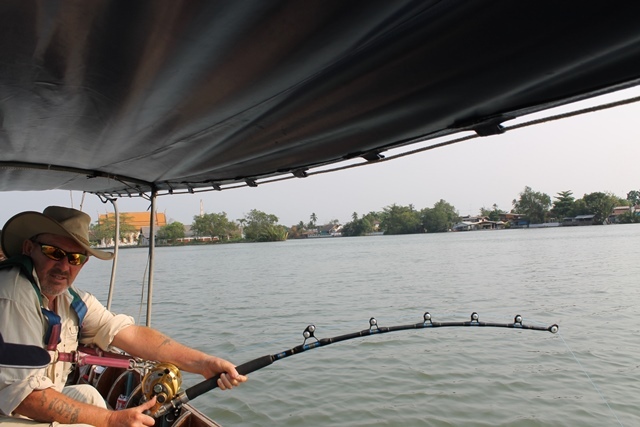 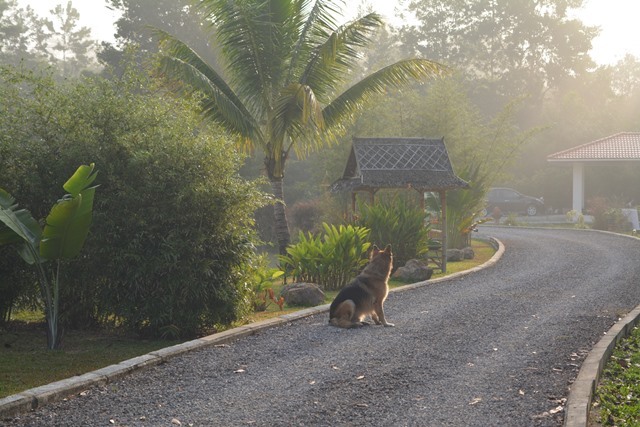 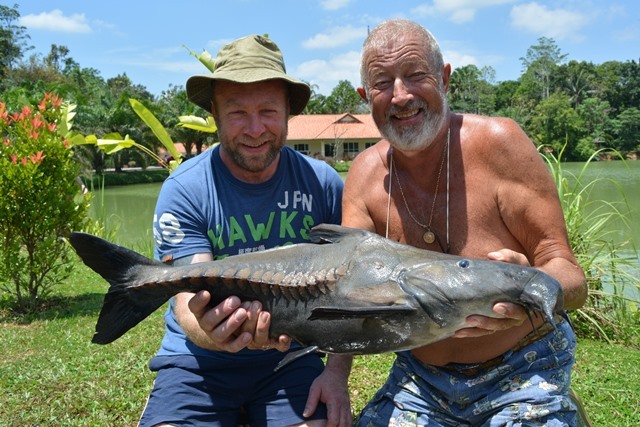 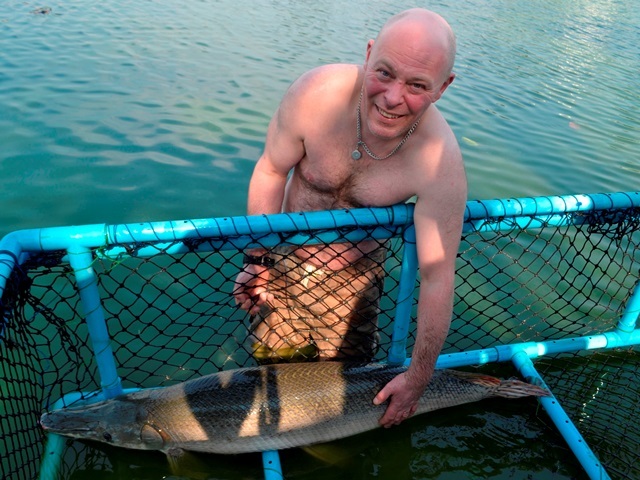 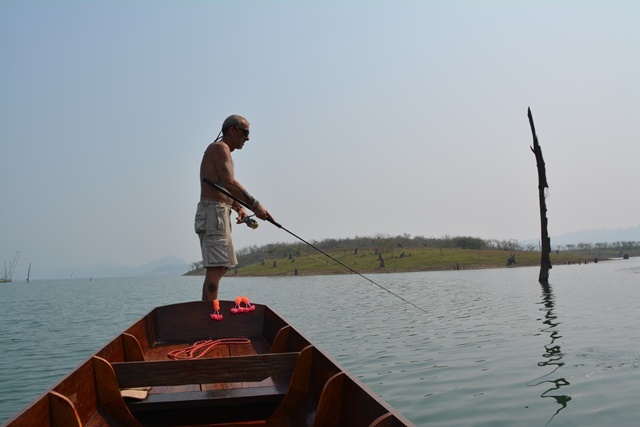 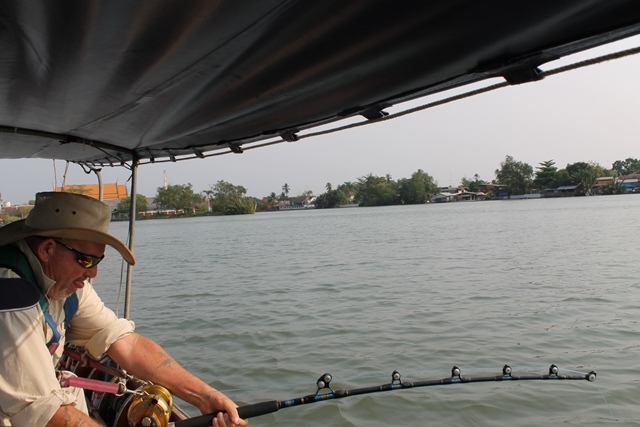 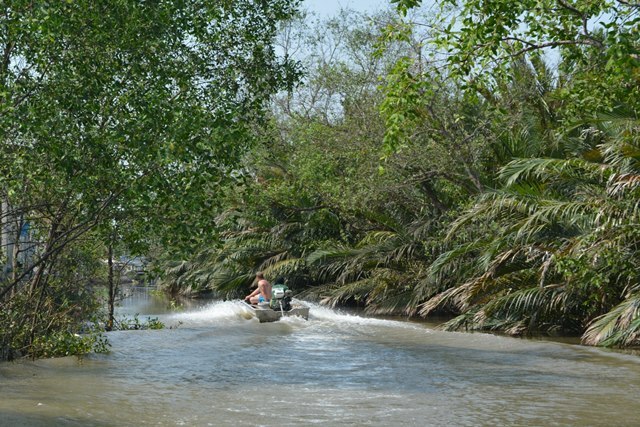 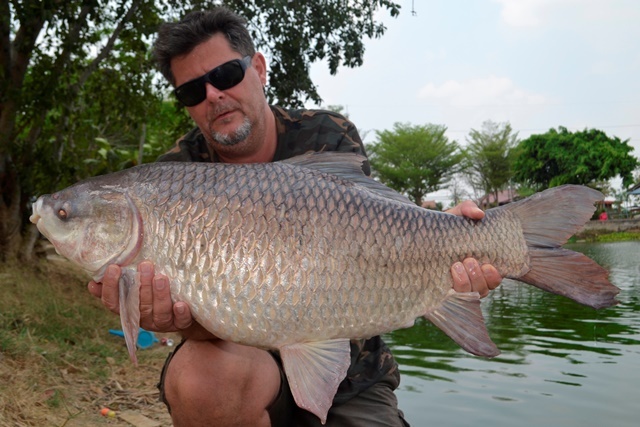 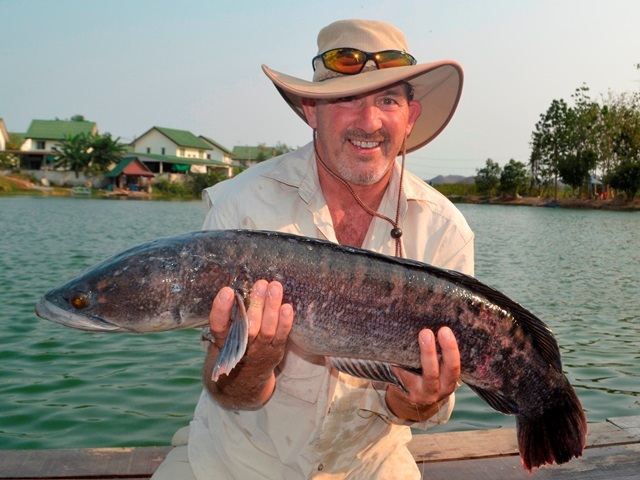 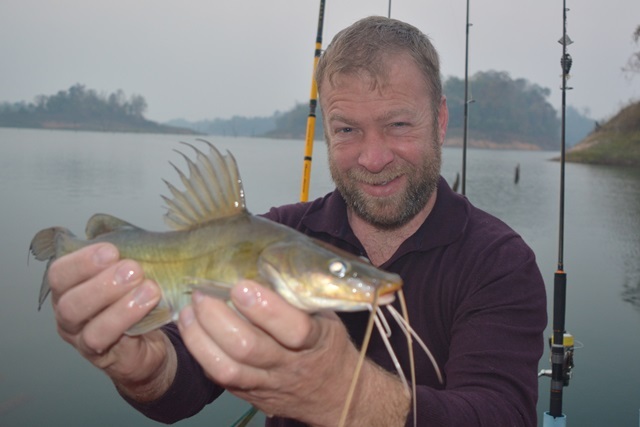 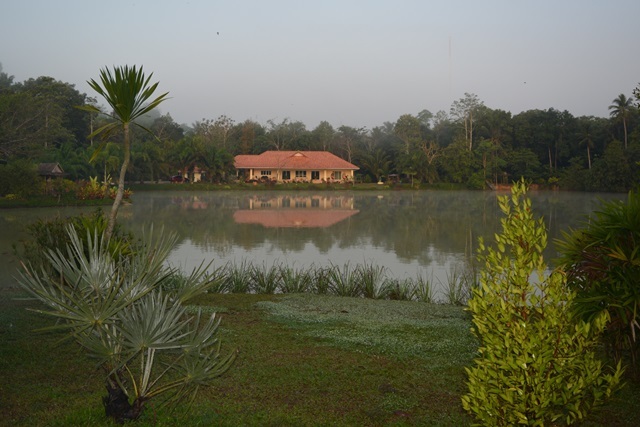 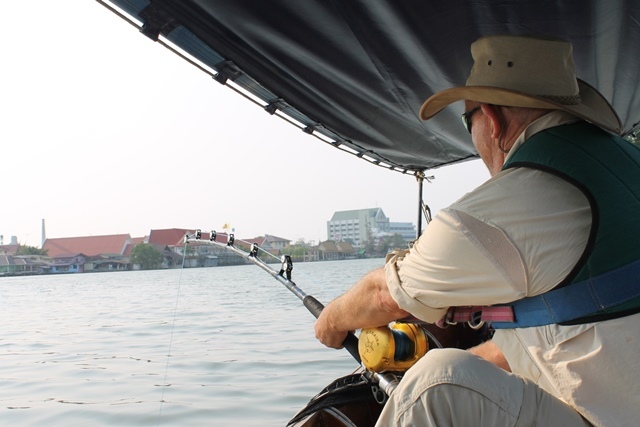 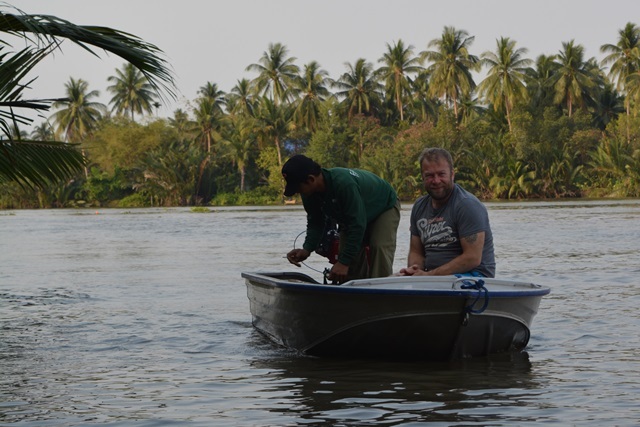 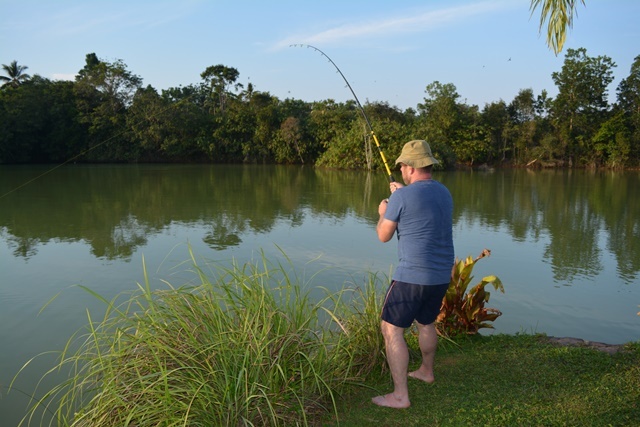 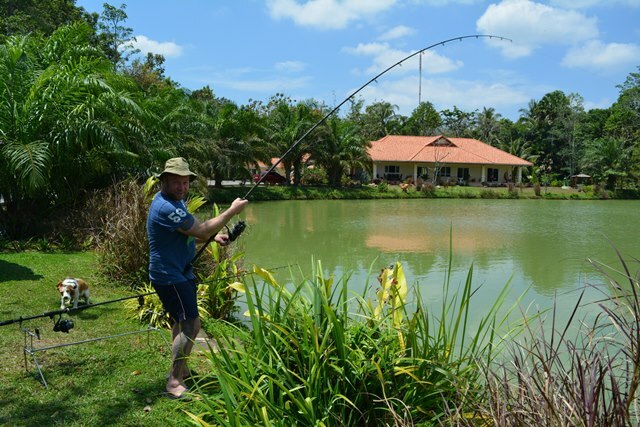 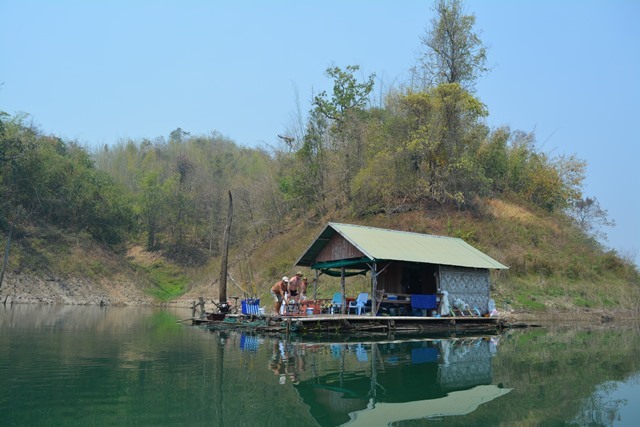 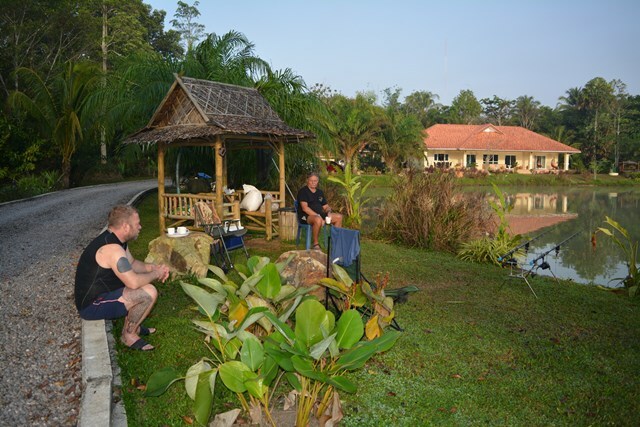 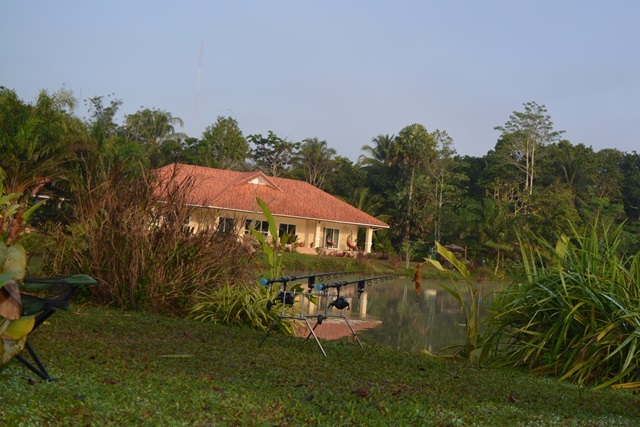 Neil Hunt visited John Wilson's private lake Bung Sawan during the month ably guided by John, Tim and Su. 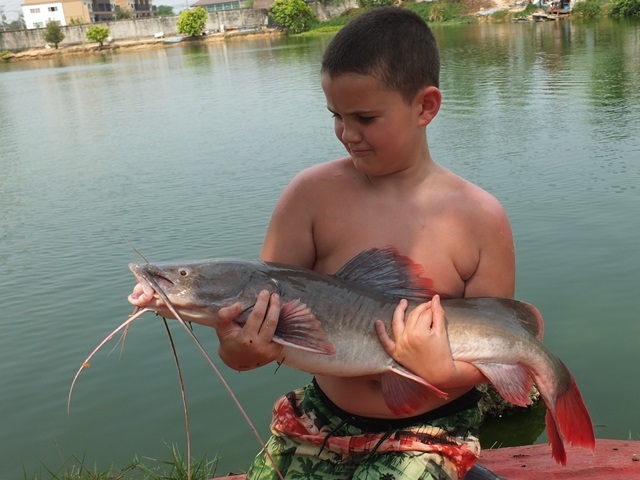 He caught a number of great catches that included ripsaw catfish, Siamese carp, Amazon redtails, java barb and alligator gar. 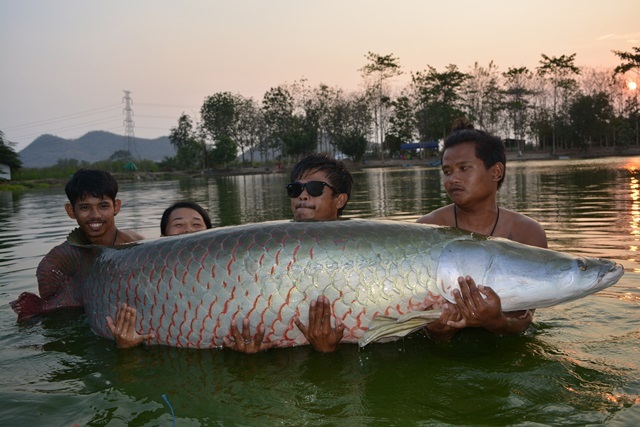 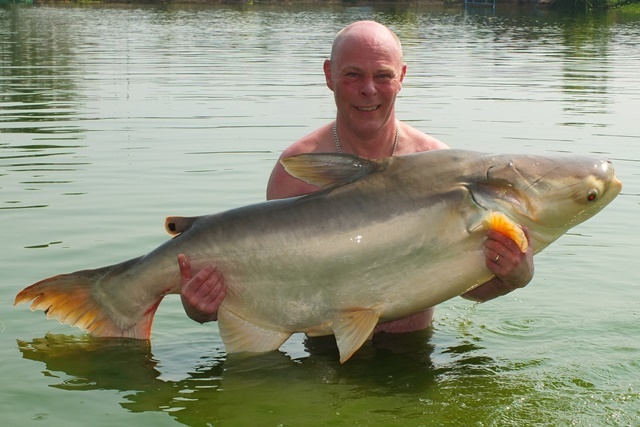 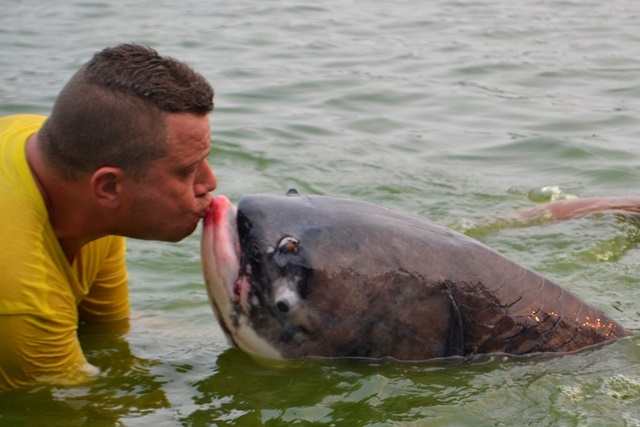 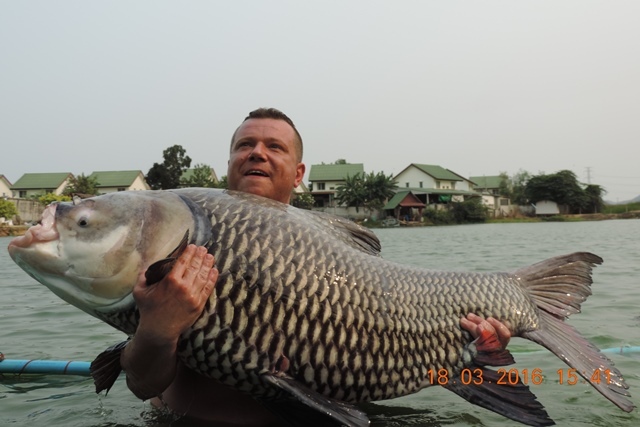 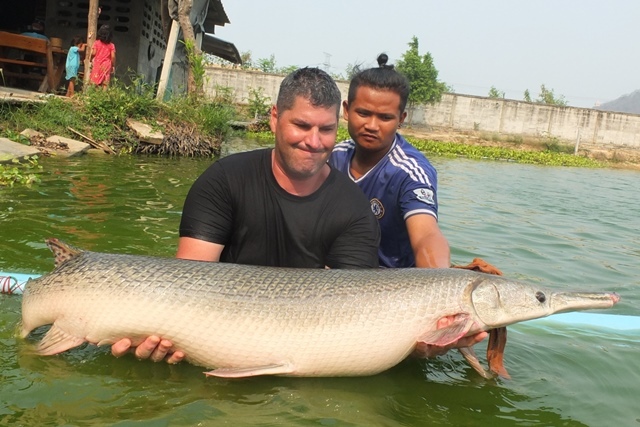 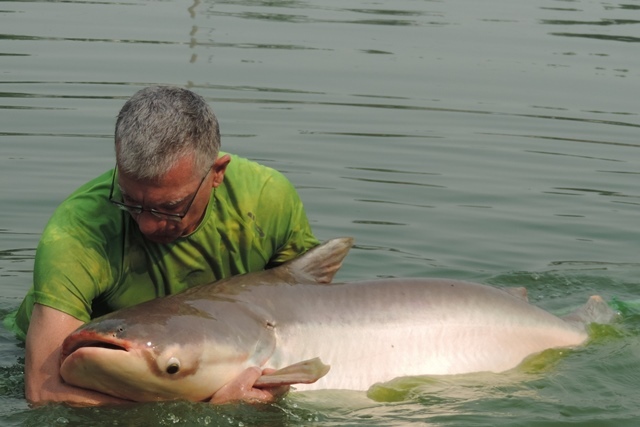 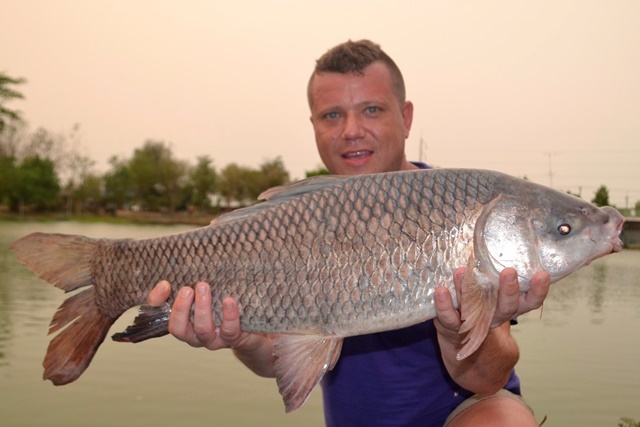 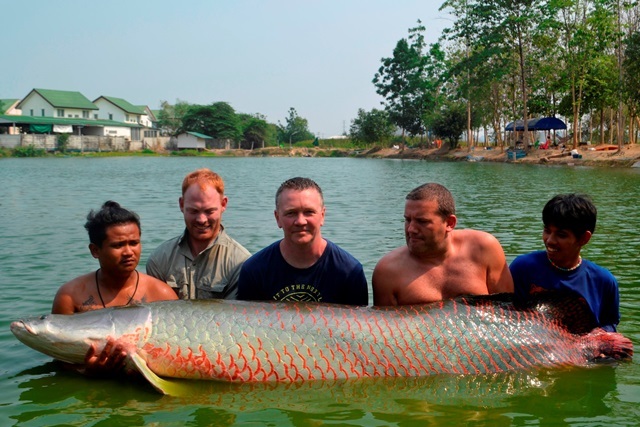 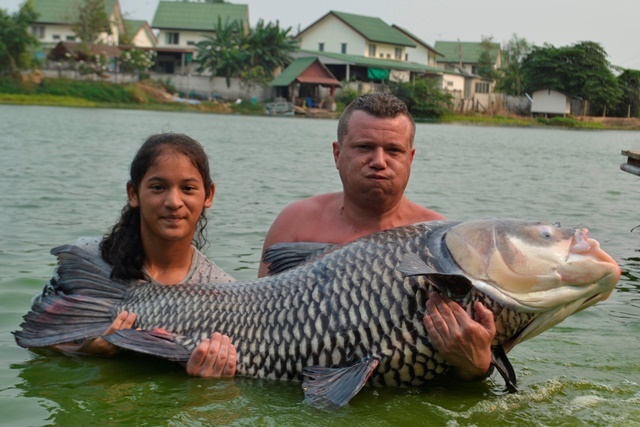 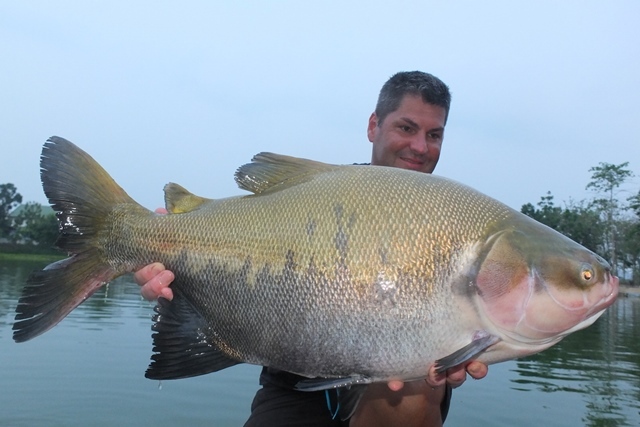 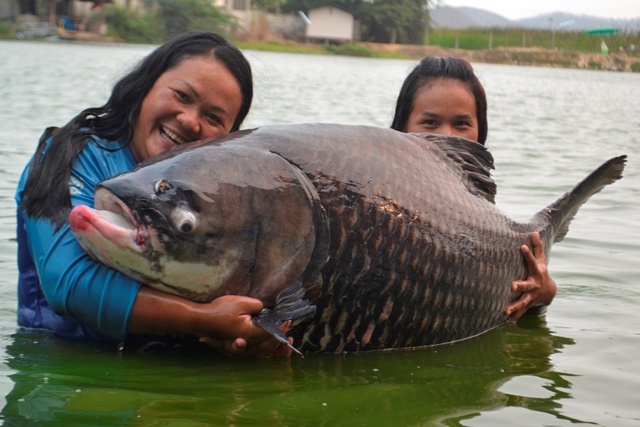 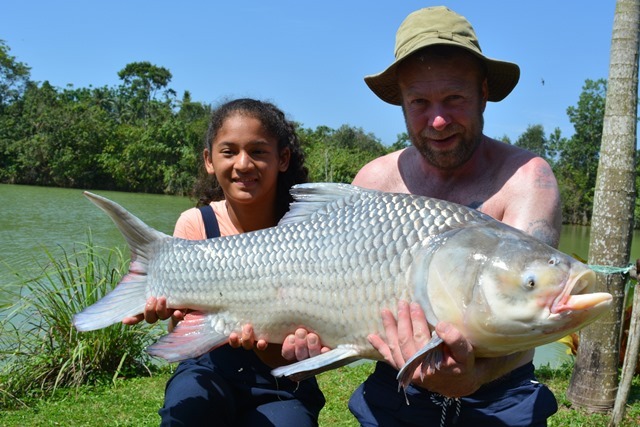 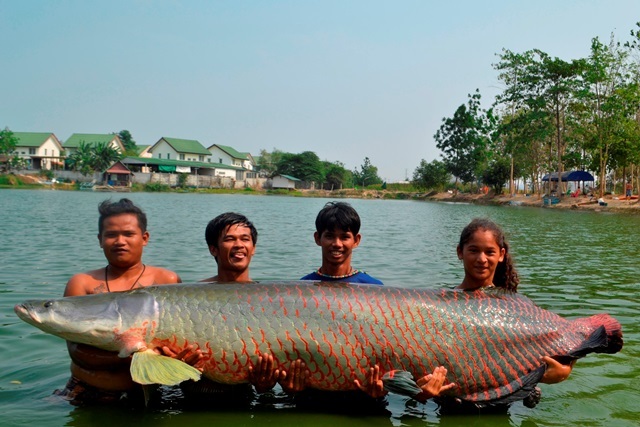 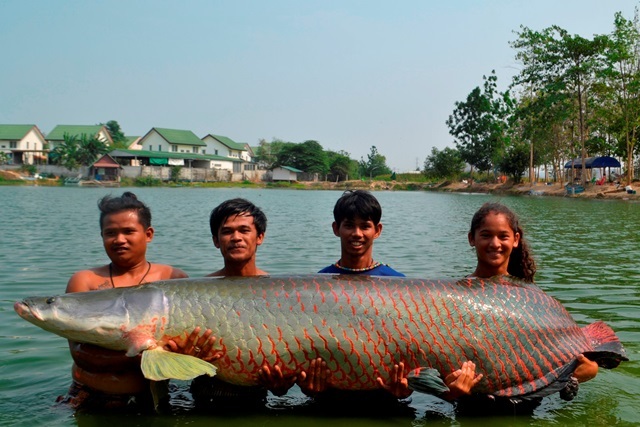 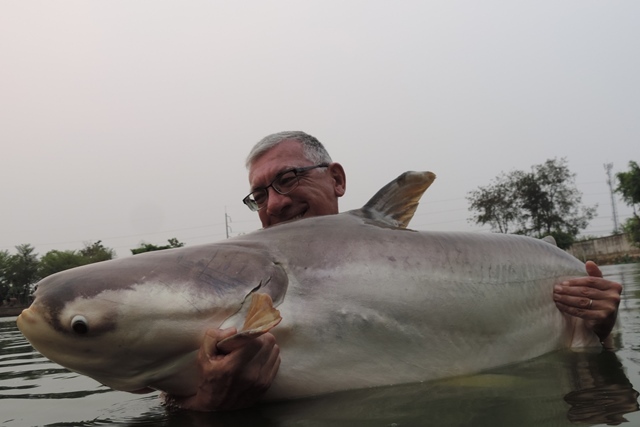 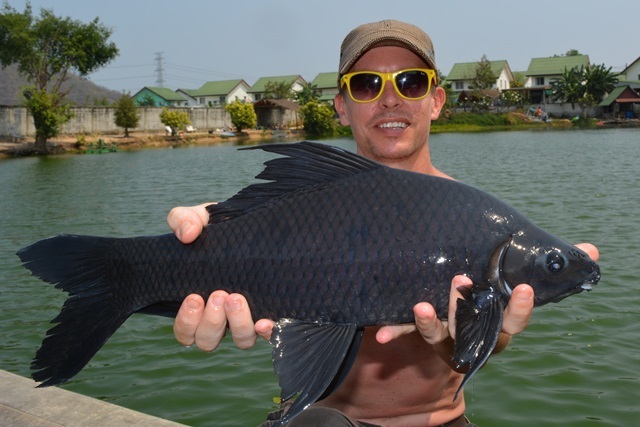 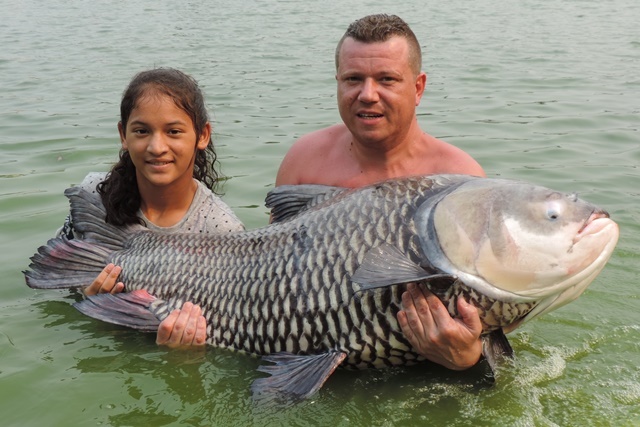 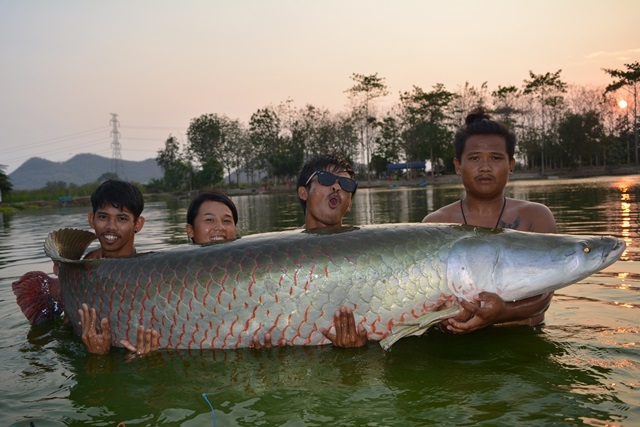 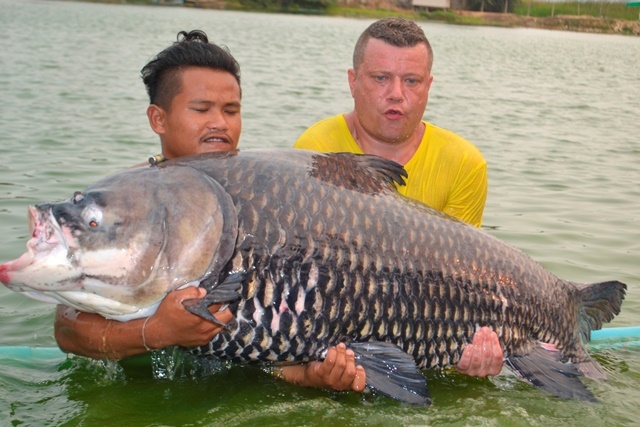 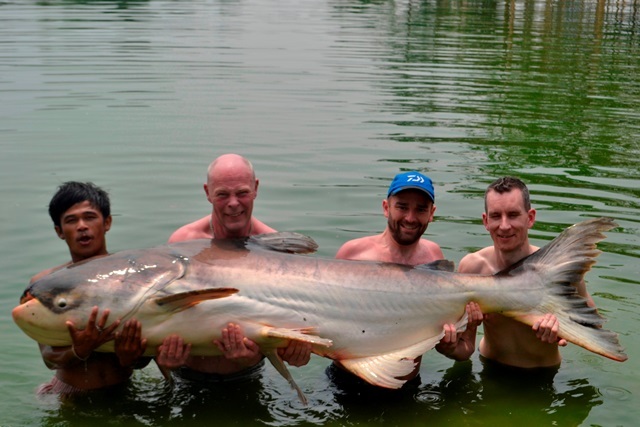 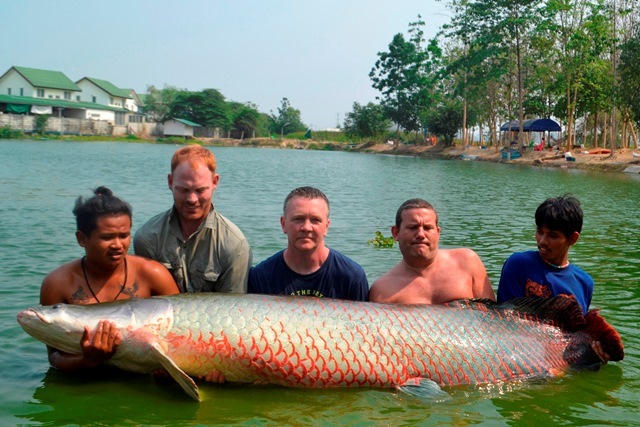 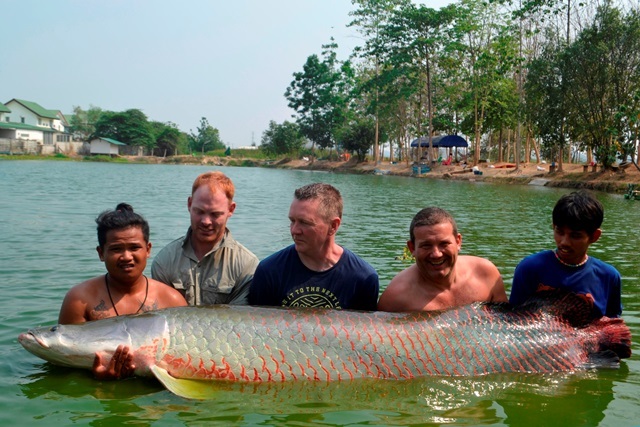 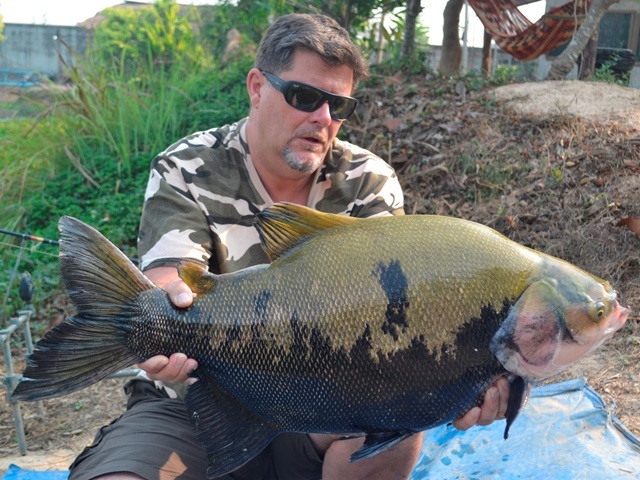 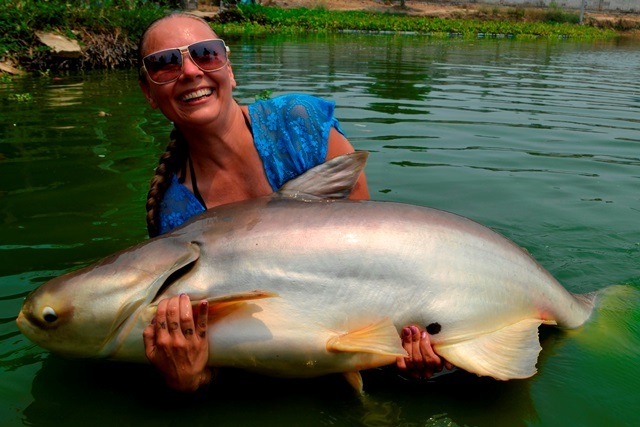 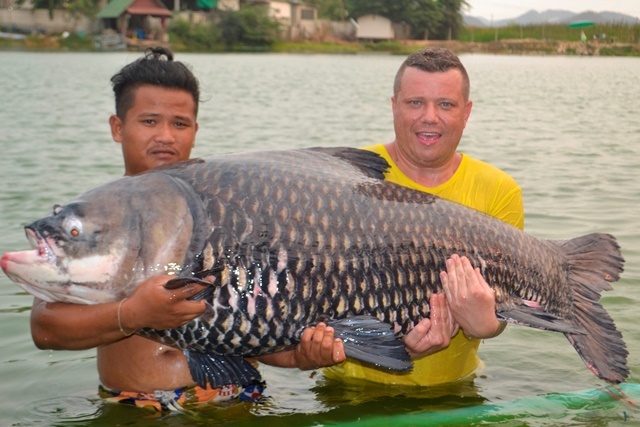 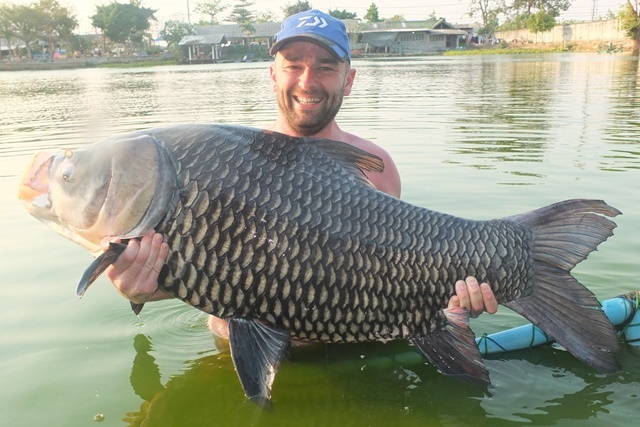 Dutch angler Pieter Beelan also made his first visit to Palm Tree during the month catching one of the Palm Tree BIG girls in the form of a 460lb+ arapaima as well as Siamese carp and Mekong catfish. 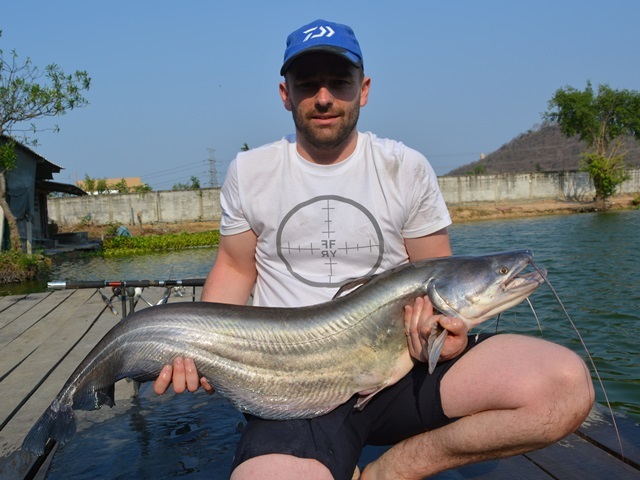 Steven Morris collected his first Palm Tree Lagoon BIG Fish Club t-shirt on his very first day battling for over two and a half hours to land a monstrous 300lb+ Mekong catfish. 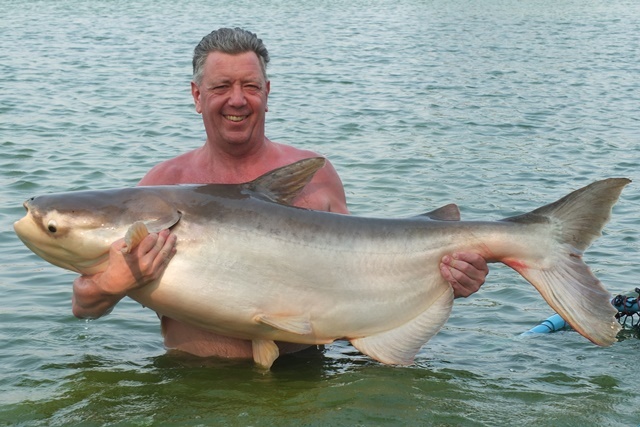 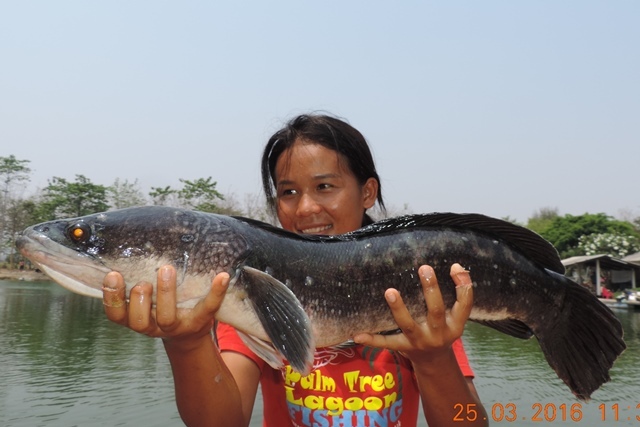 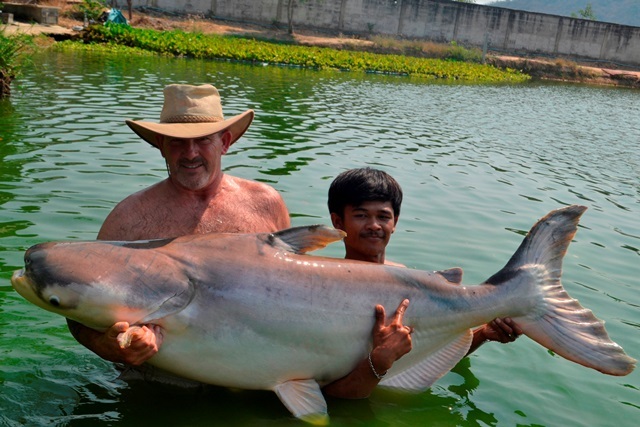 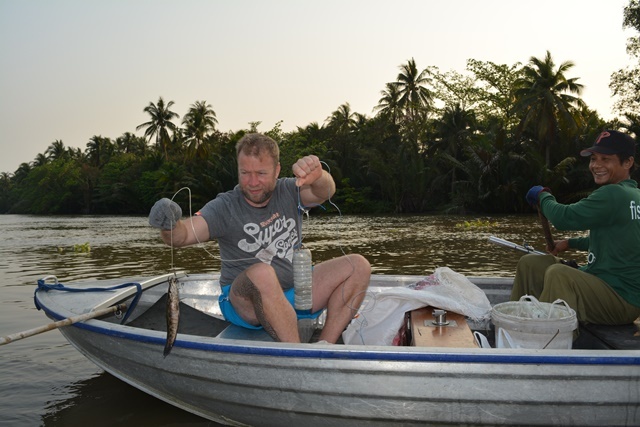 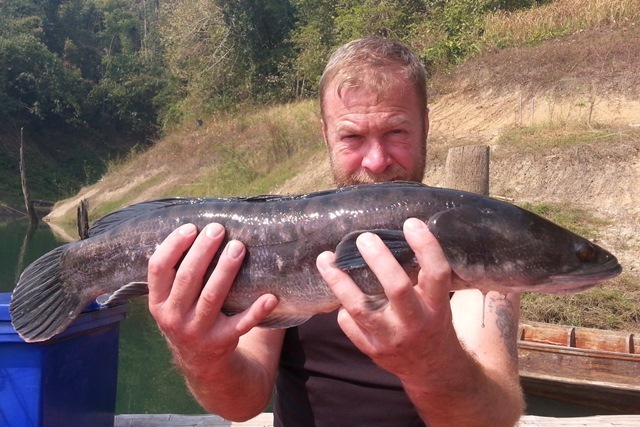 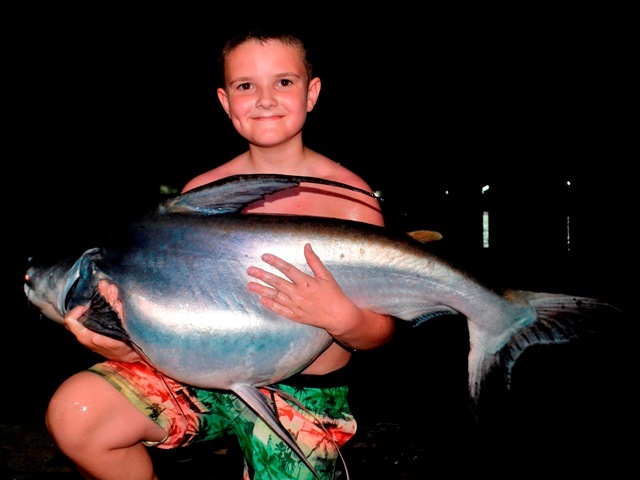 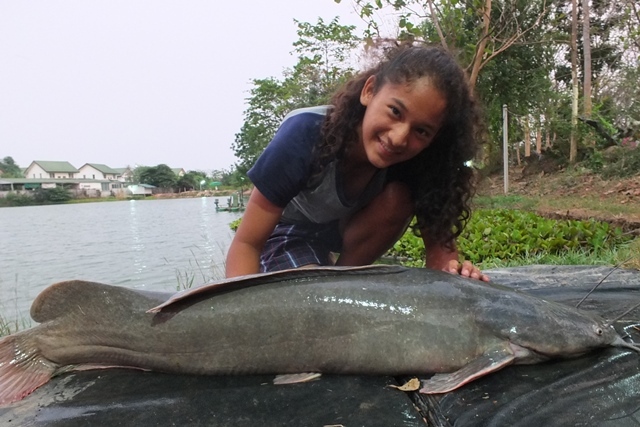 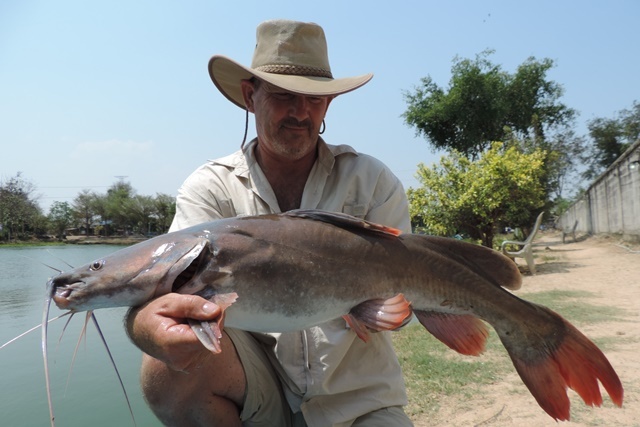 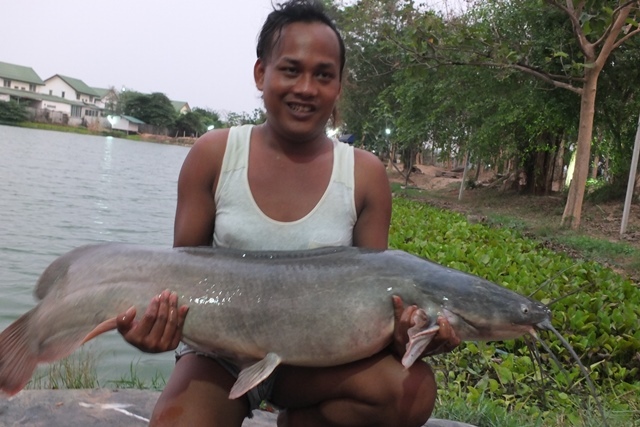 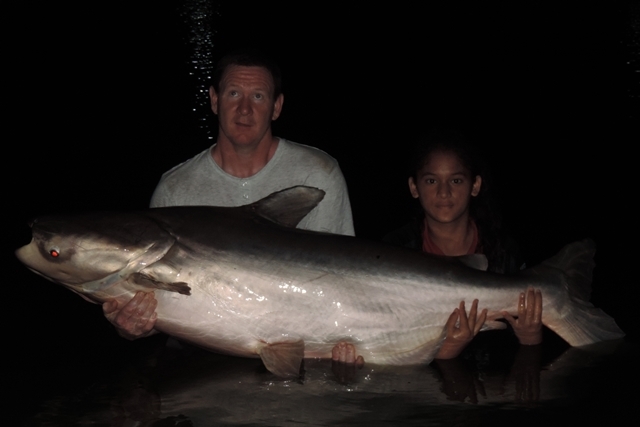 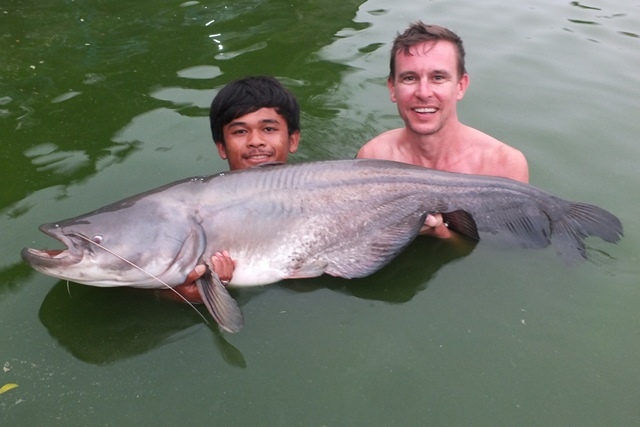 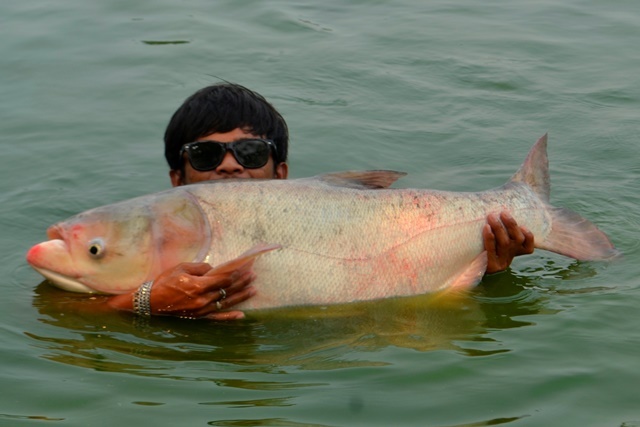 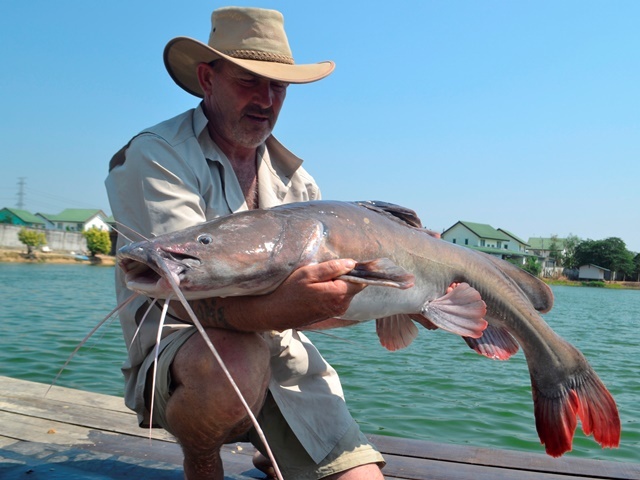 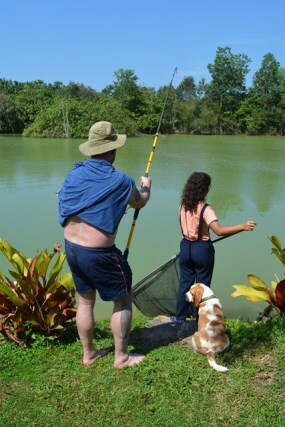 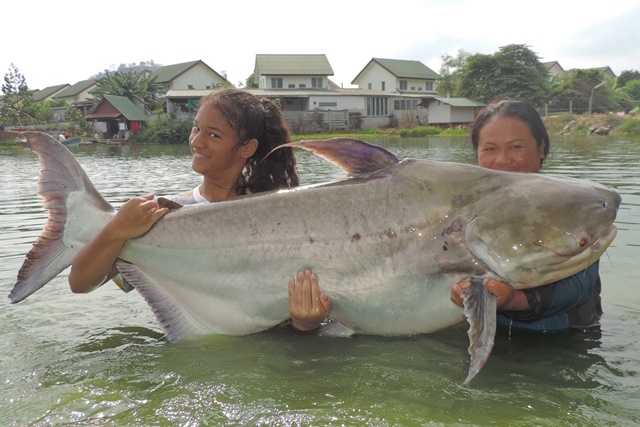 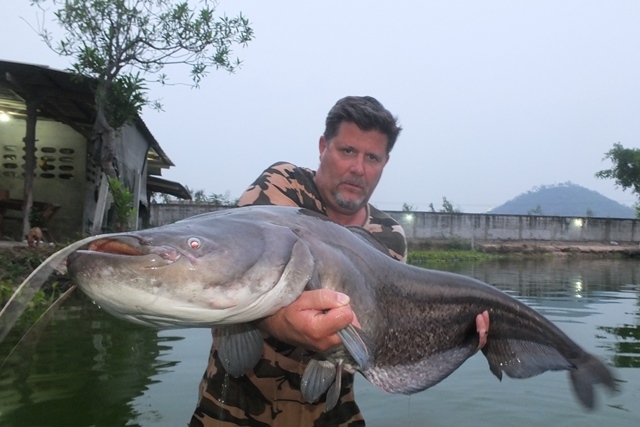 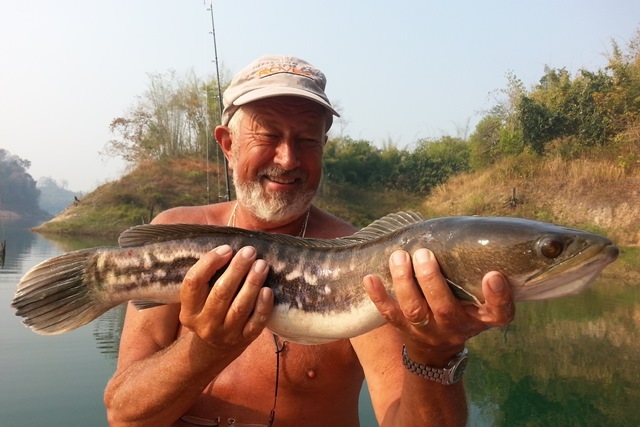 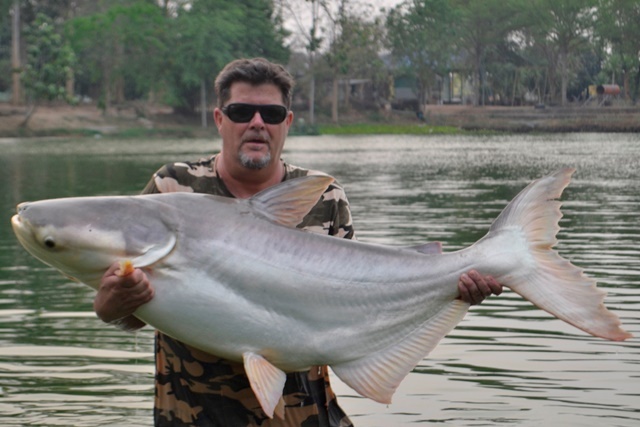 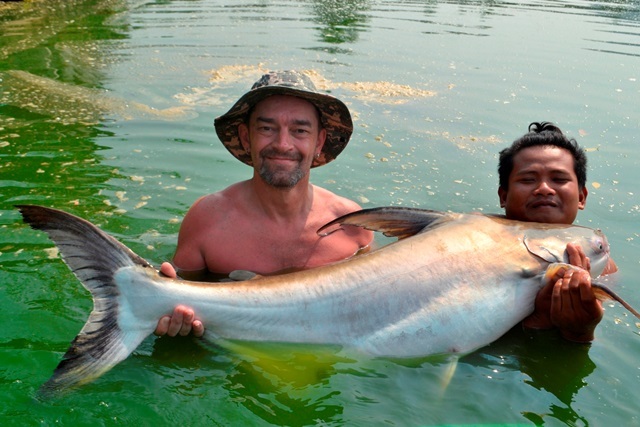 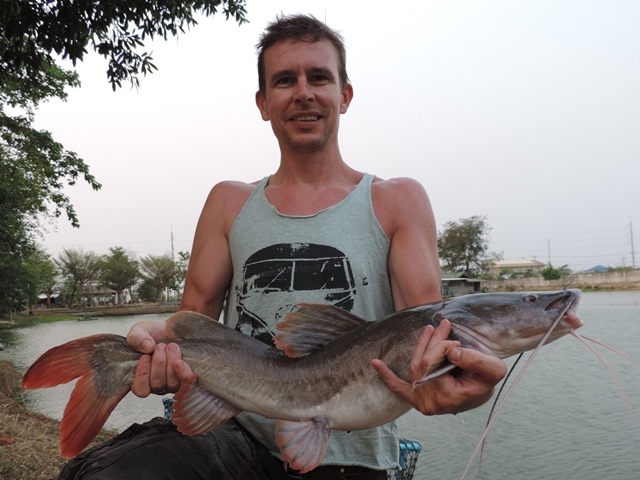 In addition to this he also caught a rare vundu catfish as well as big-Y catfish, and both Amazon and Thai redtails. 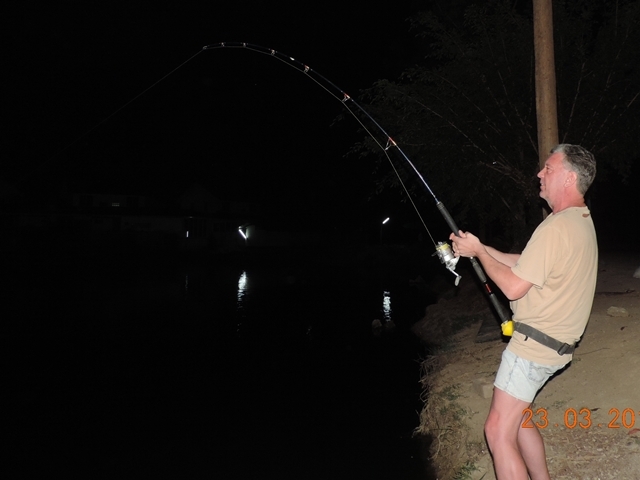 Baz Wright was also back albeit with a sore back that was not making playing the Palm Tree monsters any easier. 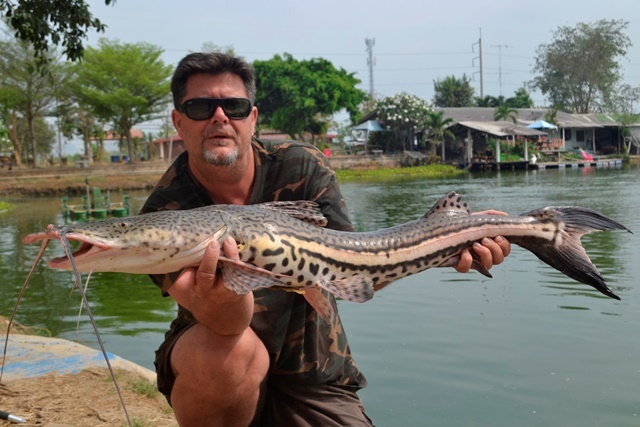 But he was not going to be beaten and caught a number of great fish that included pb Mekong catfish and chao phraya catfish as well as clown featherback, leopard catfish, big-Y catfish, tiger catfish, catfish shark, wallago attu, alligator gar, striped catfish, and both Asian and Amazon redtails. 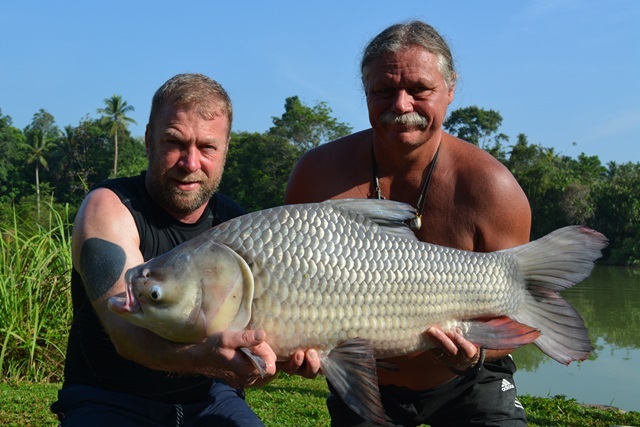 This year Thomas Hargesheimer joined his fellow German anglers Michael and Oliver for his first visit. 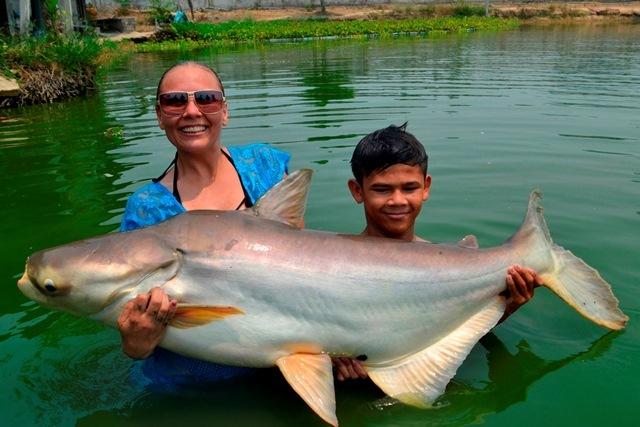 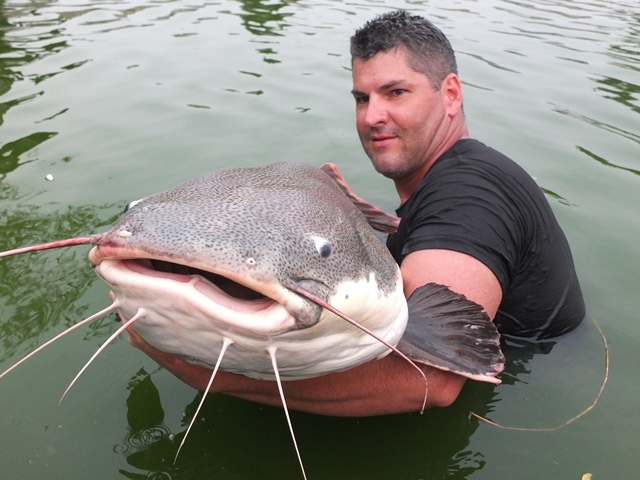 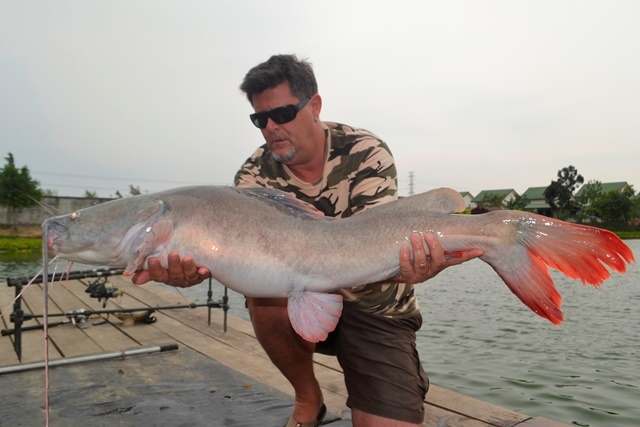 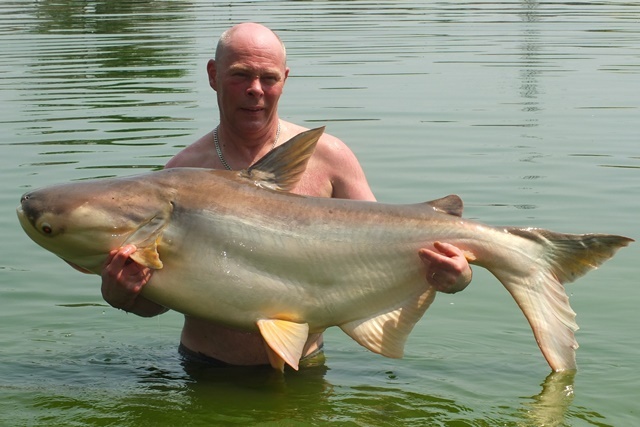 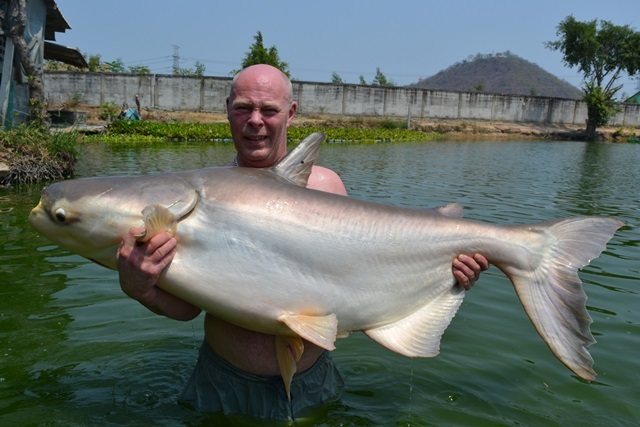 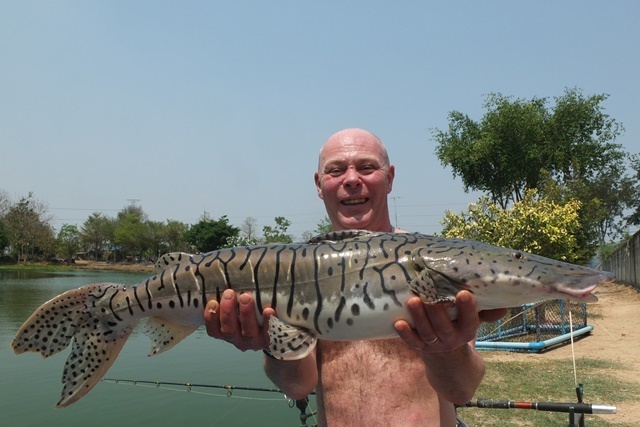 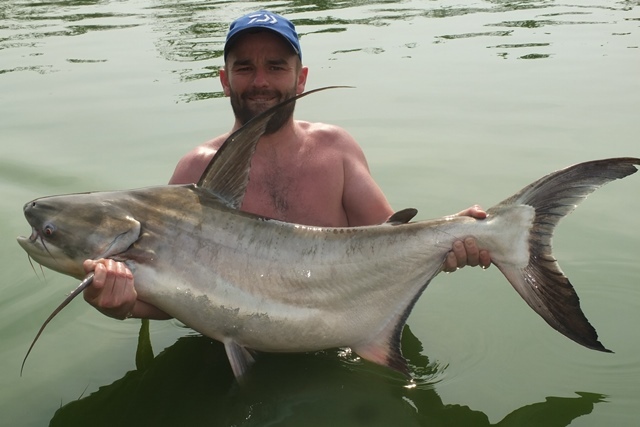 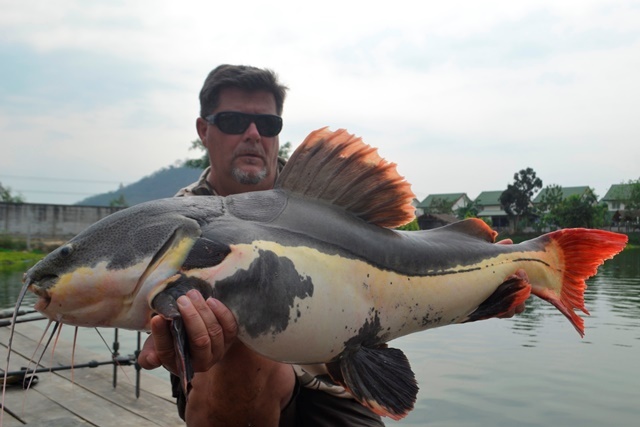 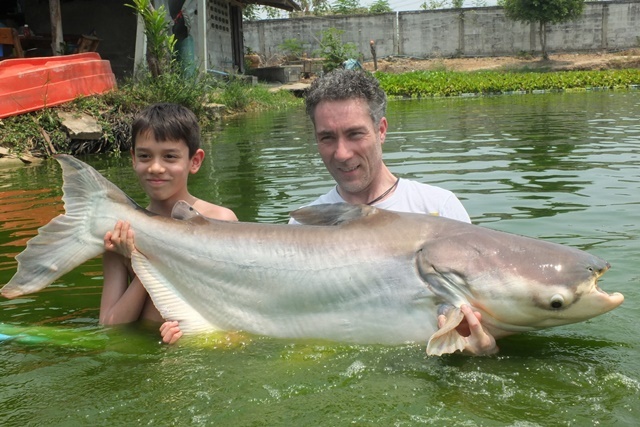 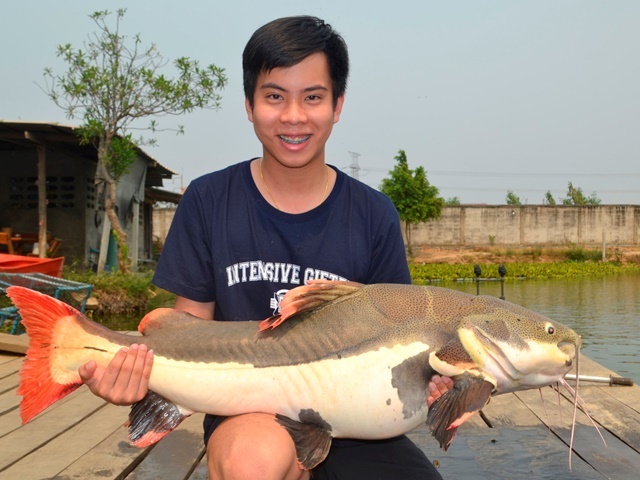 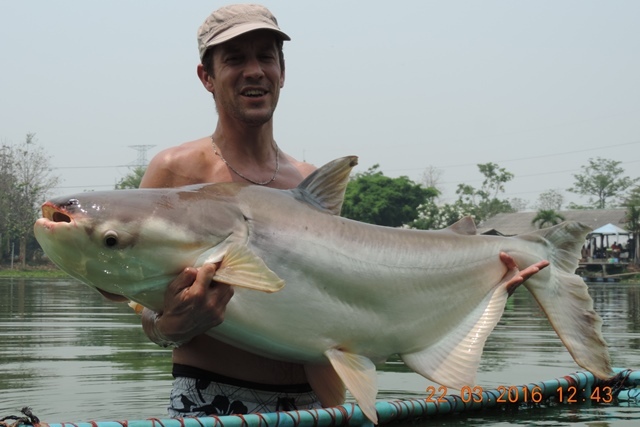 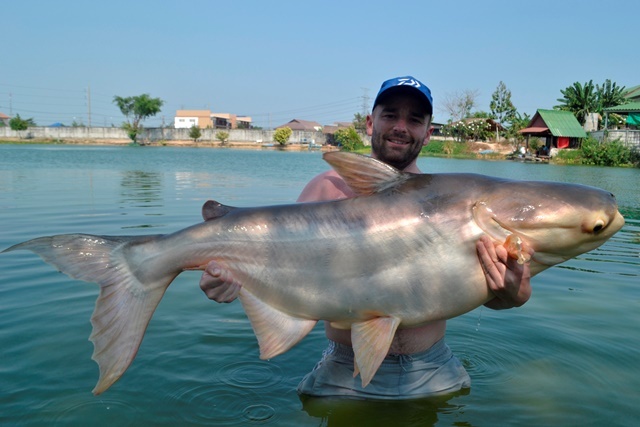 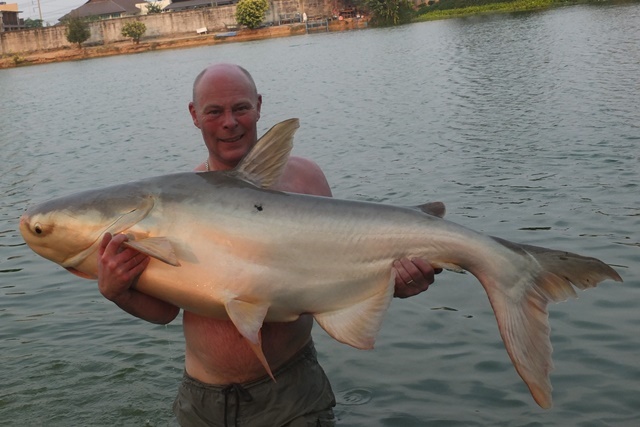 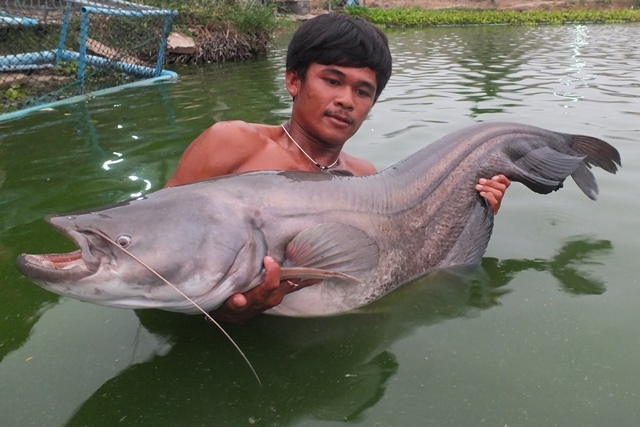 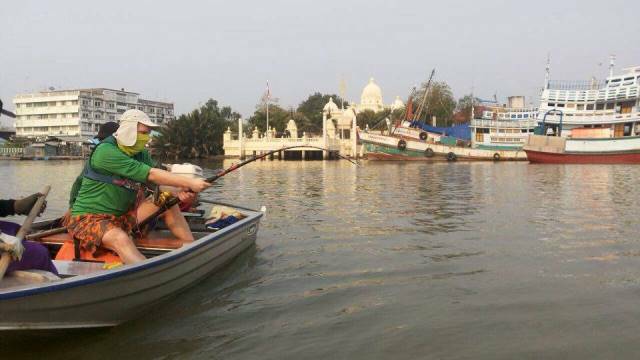 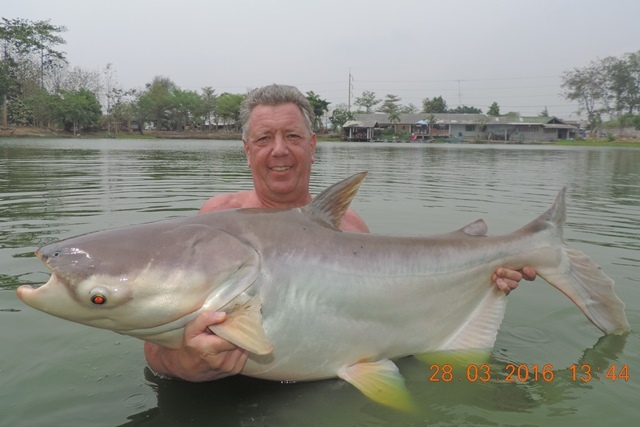 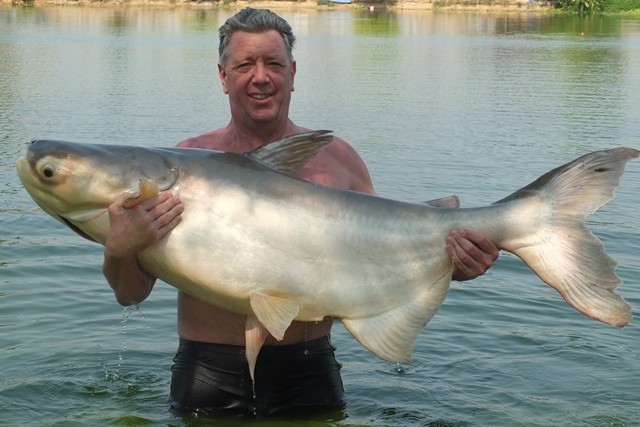 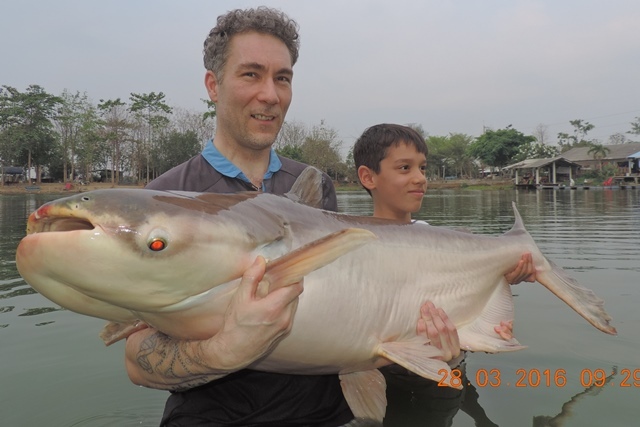 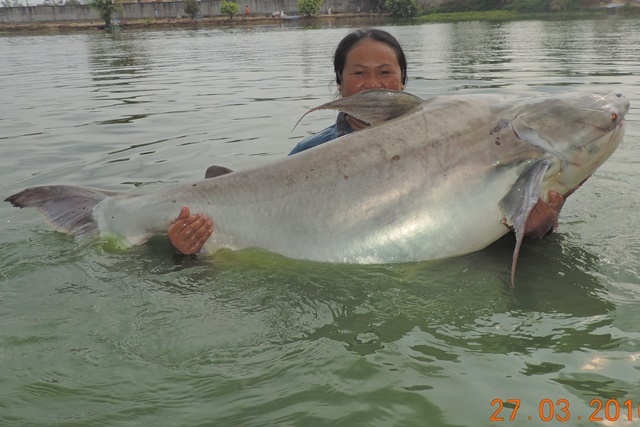 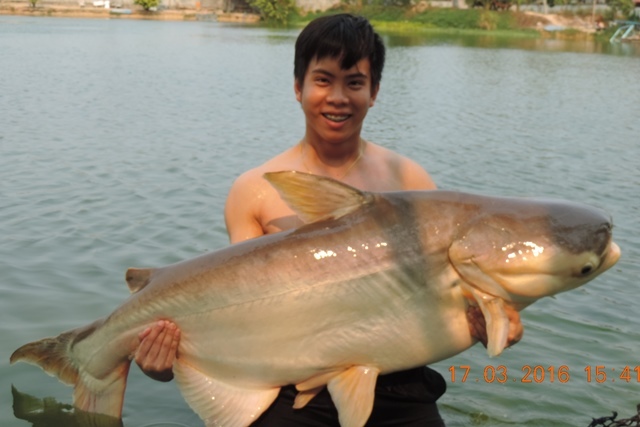 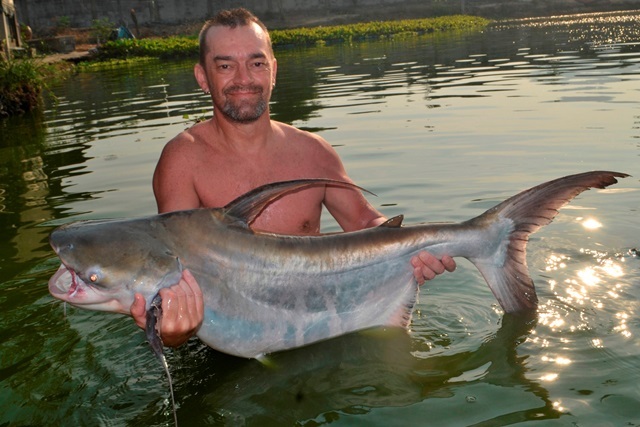 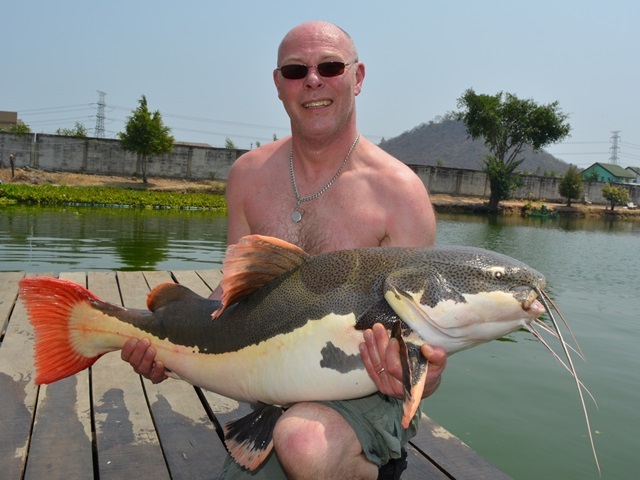 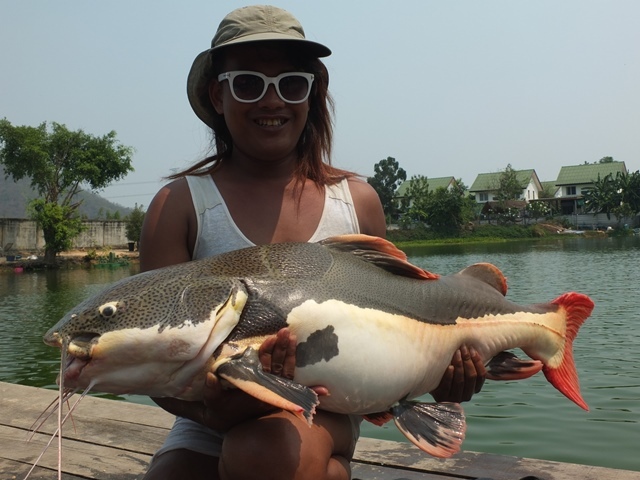 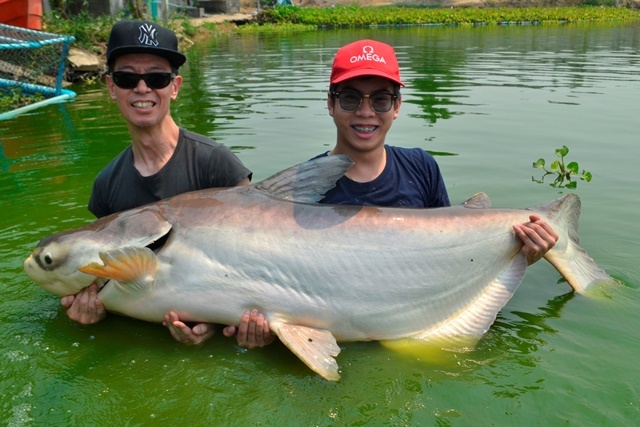 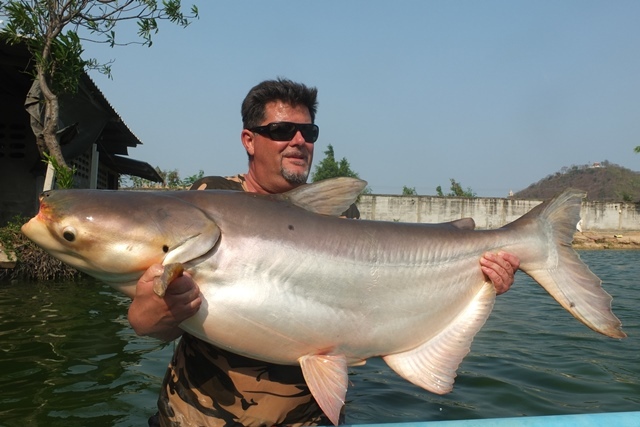 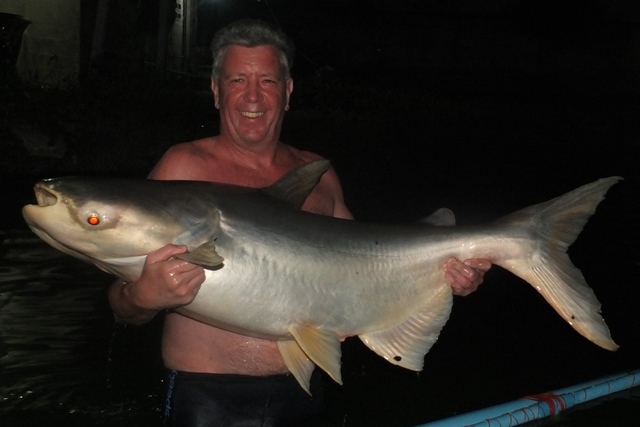 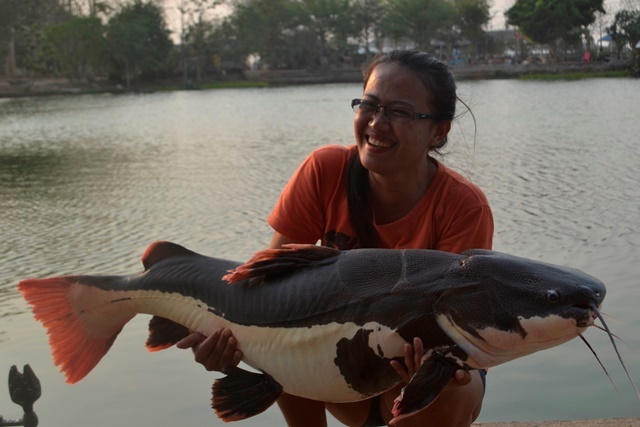 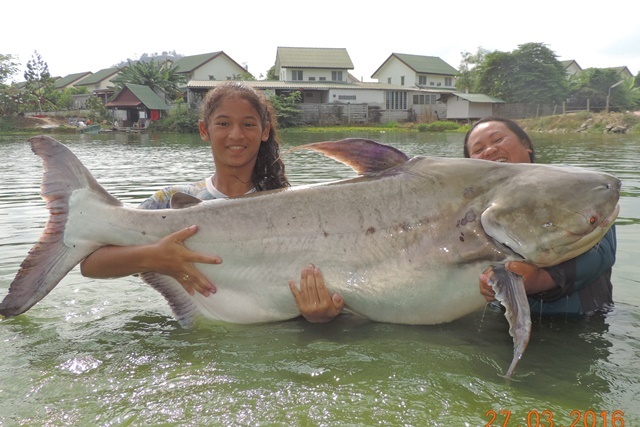 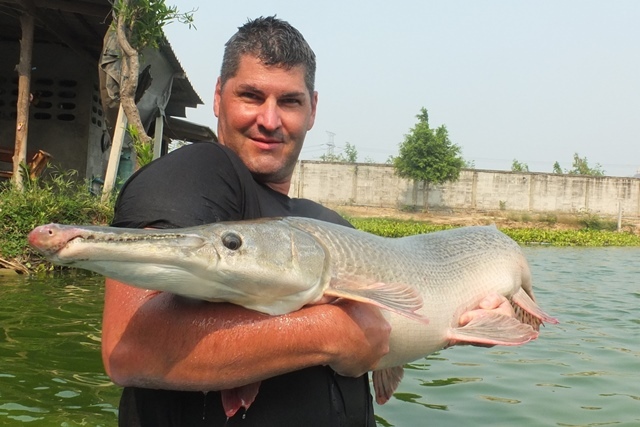 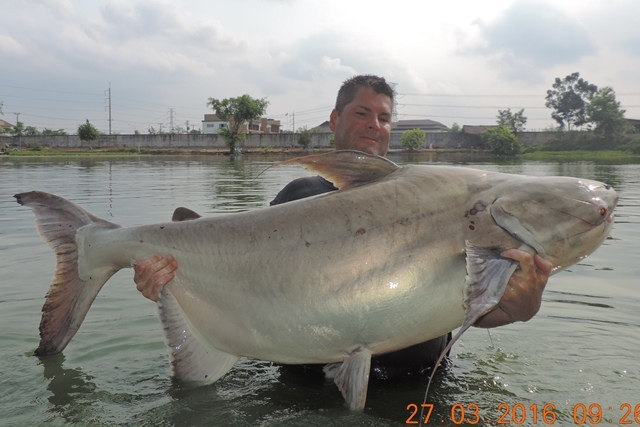 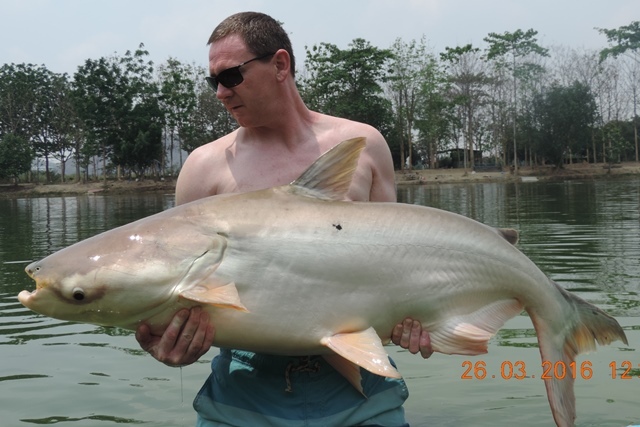 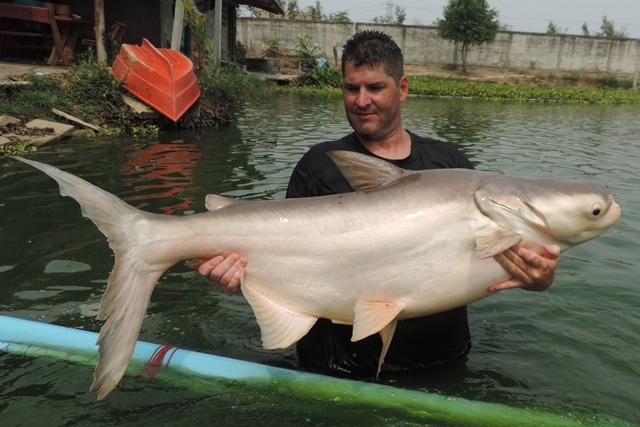 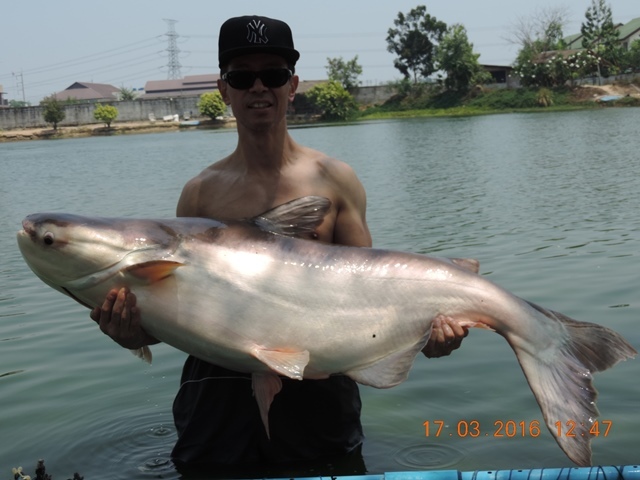 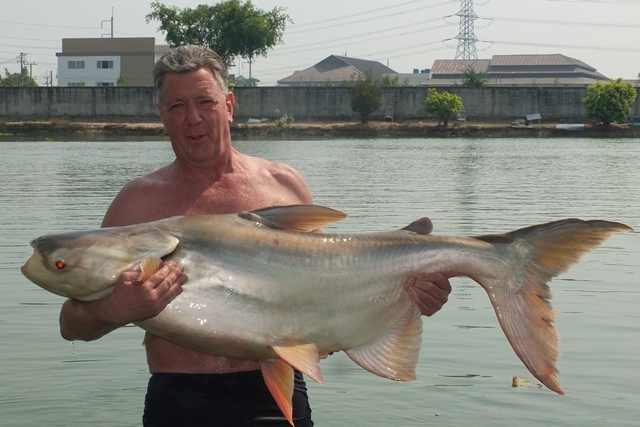 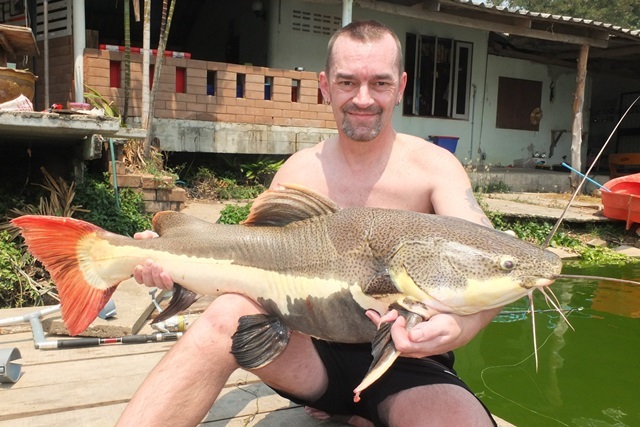 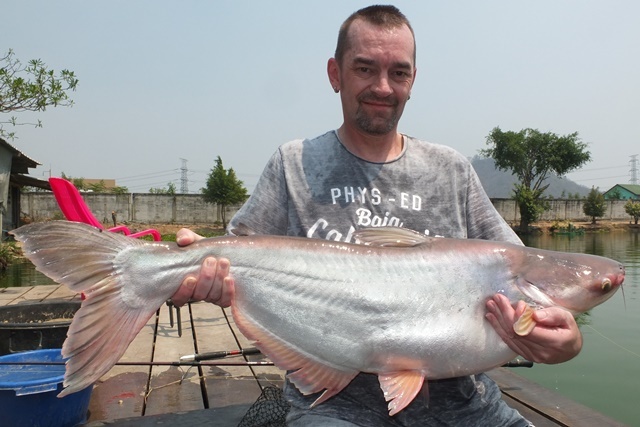 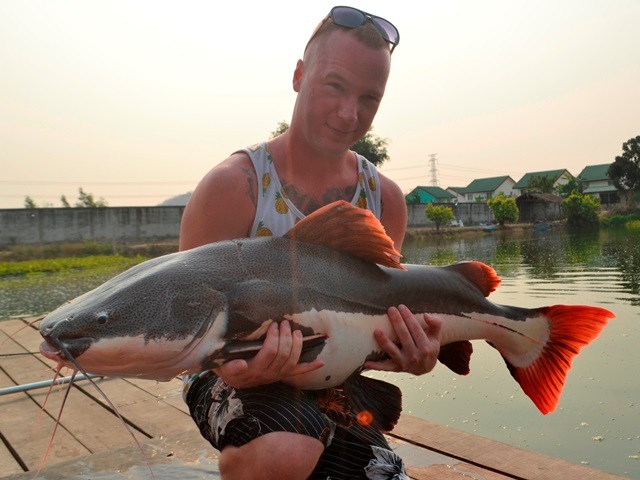 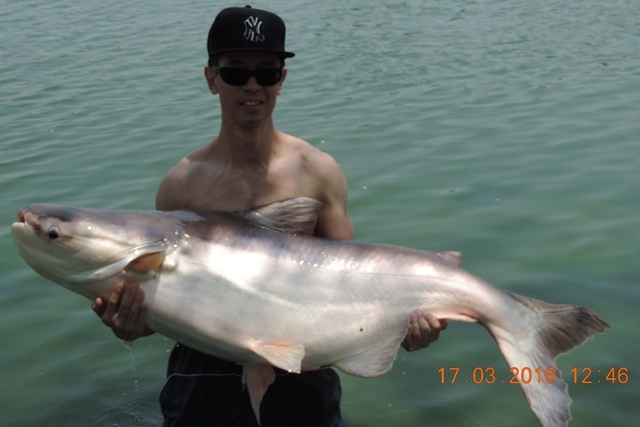 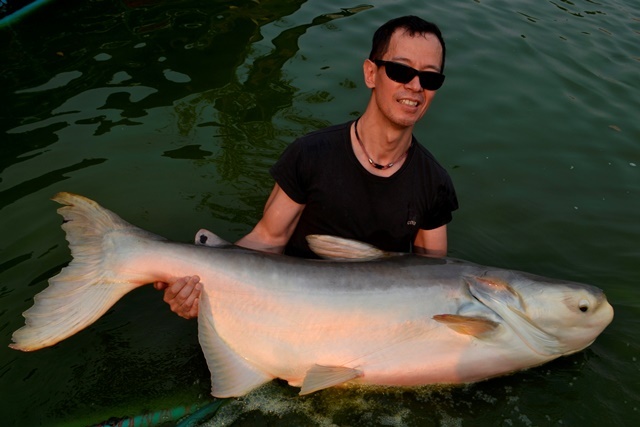 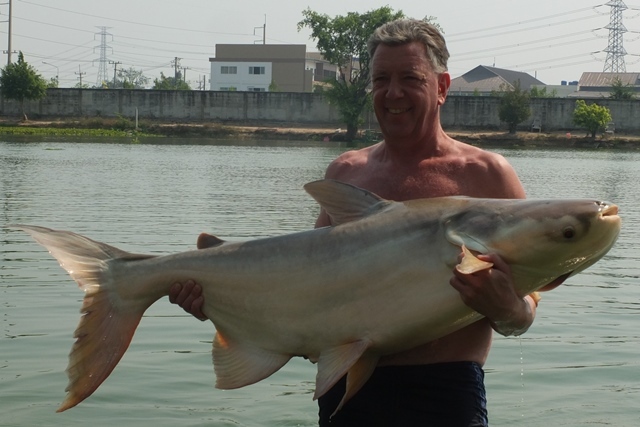 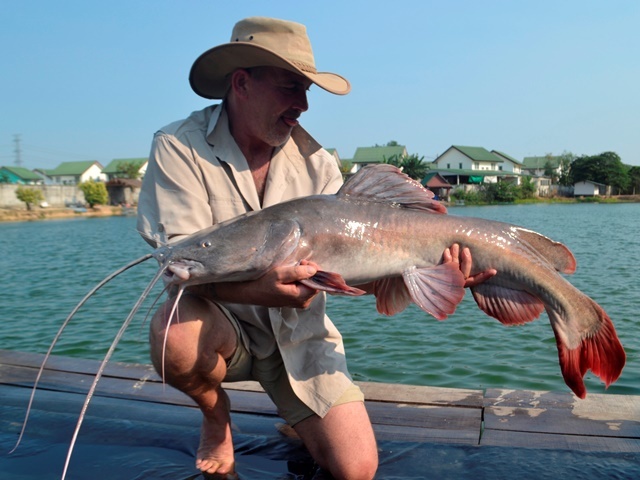 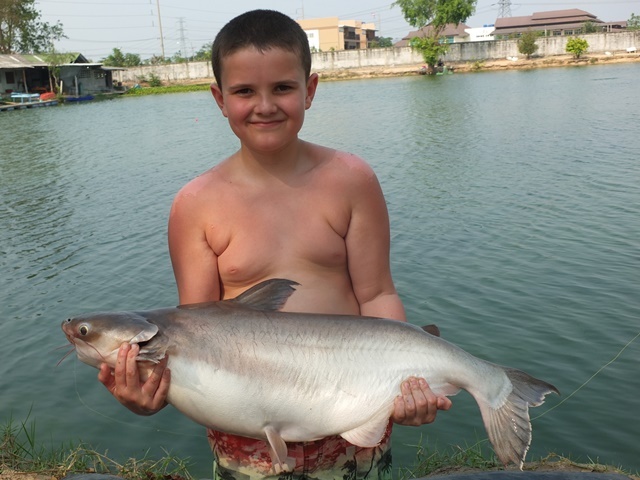 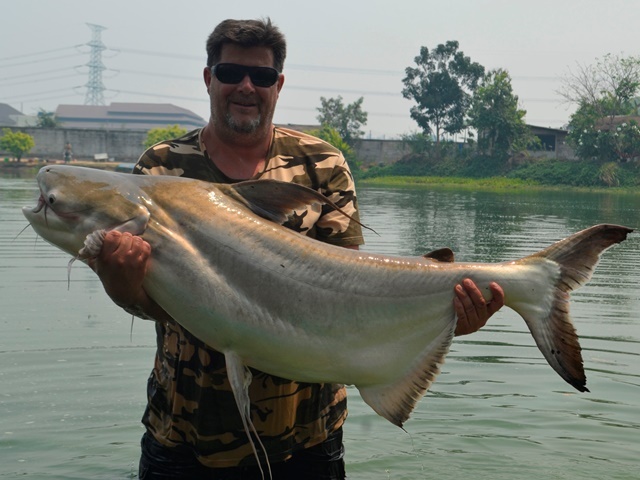 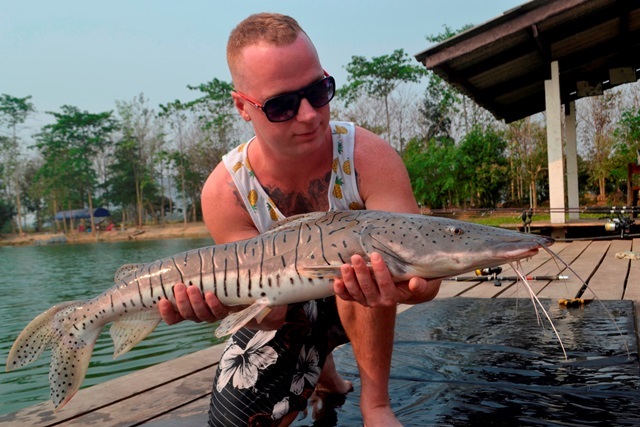 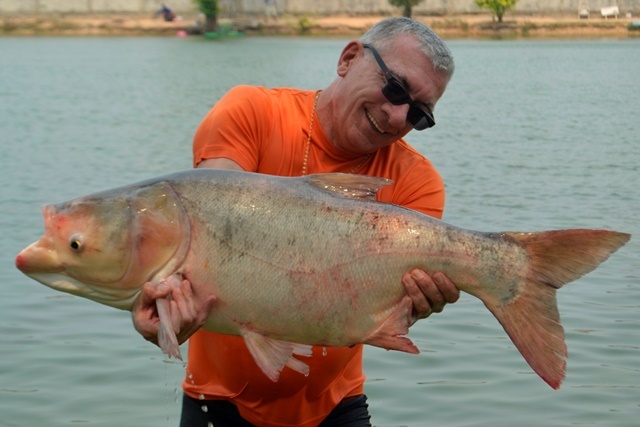 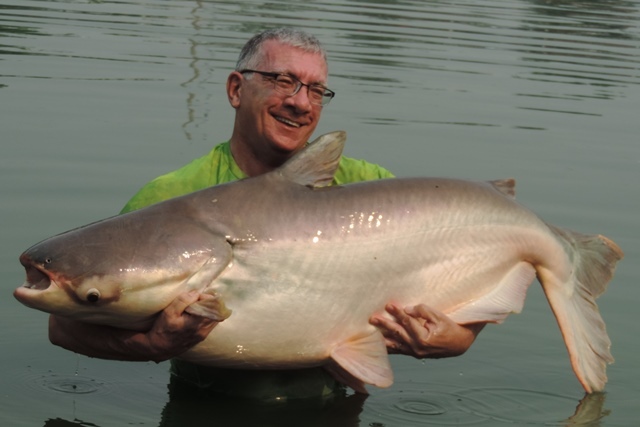 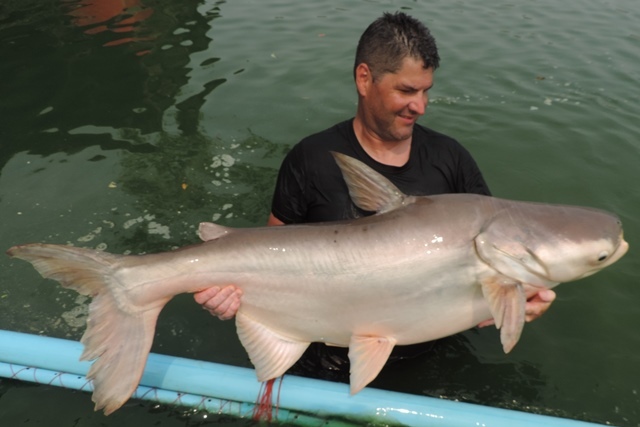 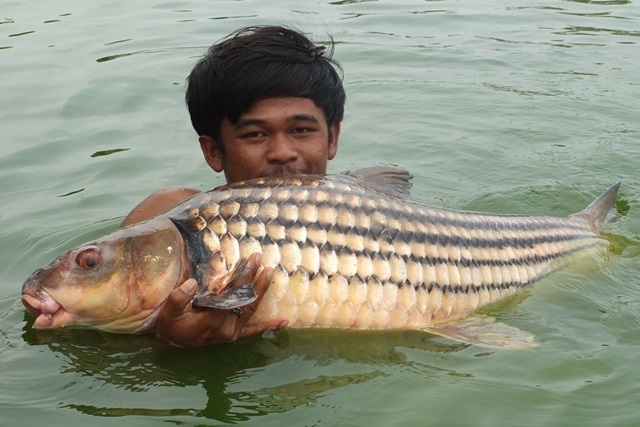 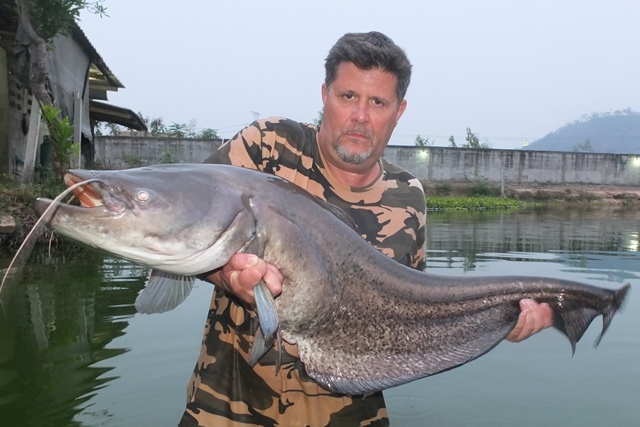 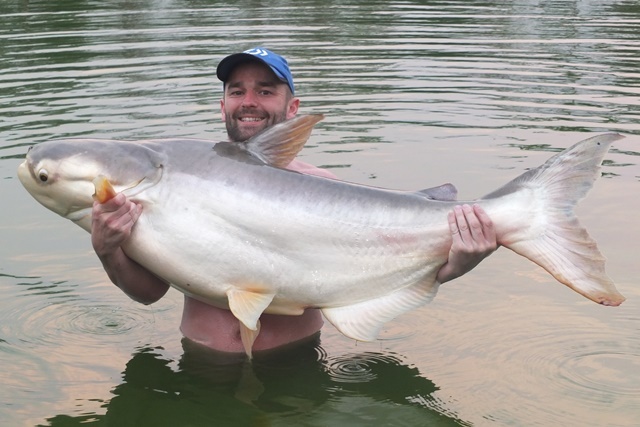 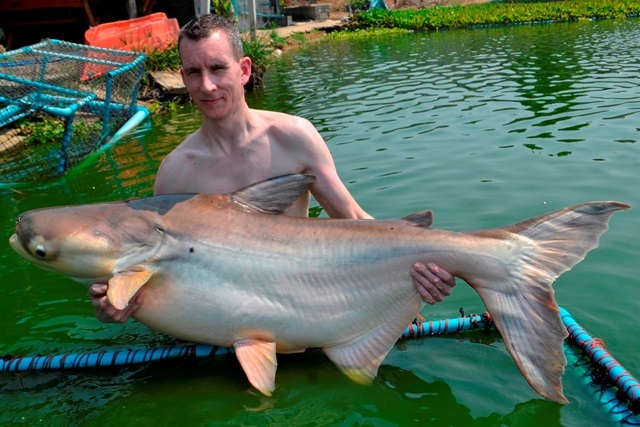 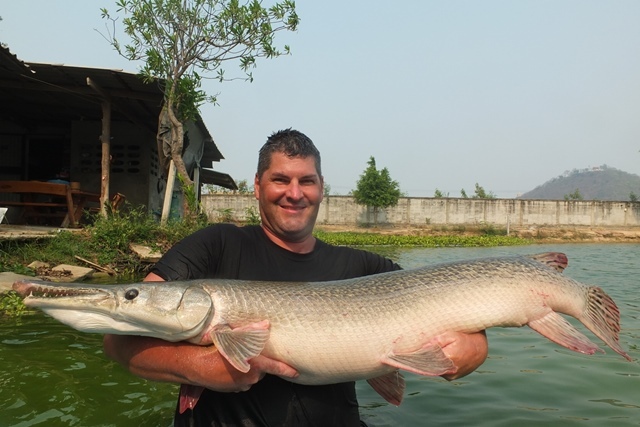 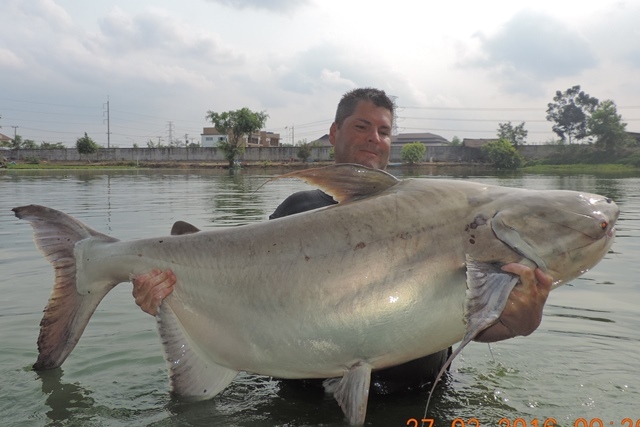 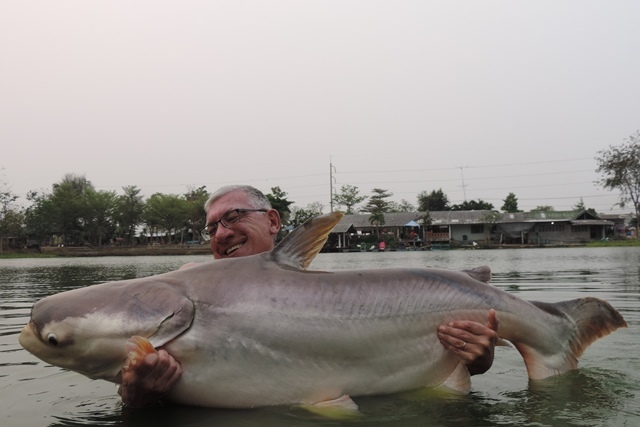 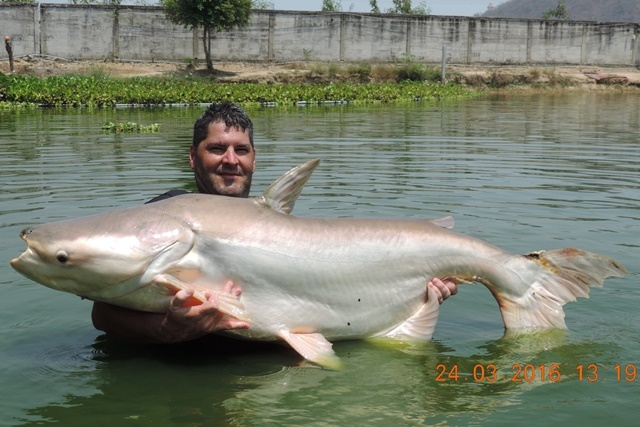 He successfully caught a number of great fish that included a stunning albino chao phraya catfish, Mekong catfish, stingray, big-Y catfish, striped catfish, chao phraya catfish, and both Amazon and Thai redtails. 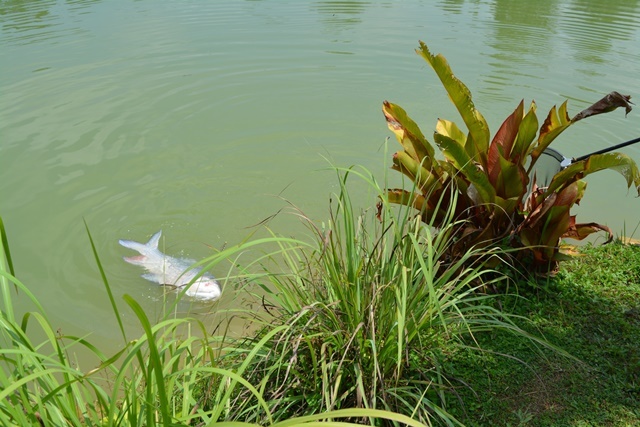 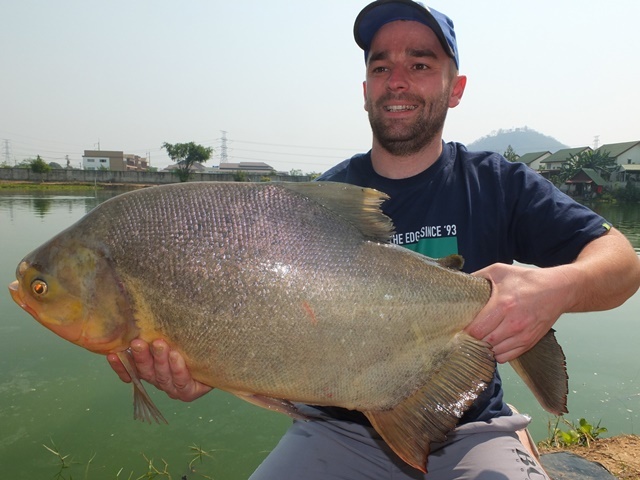 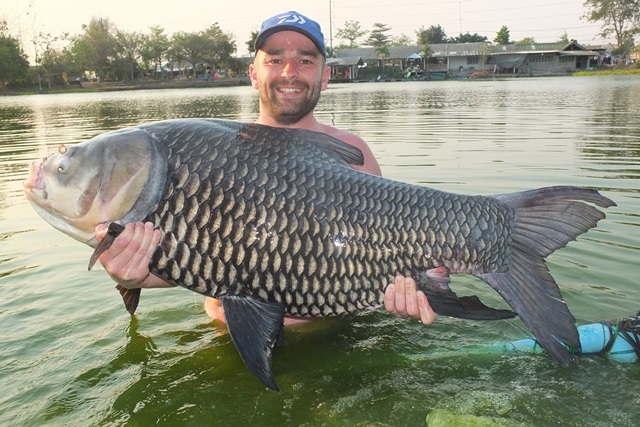 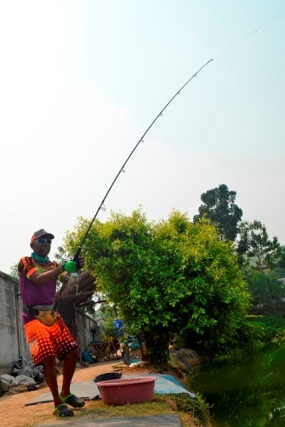 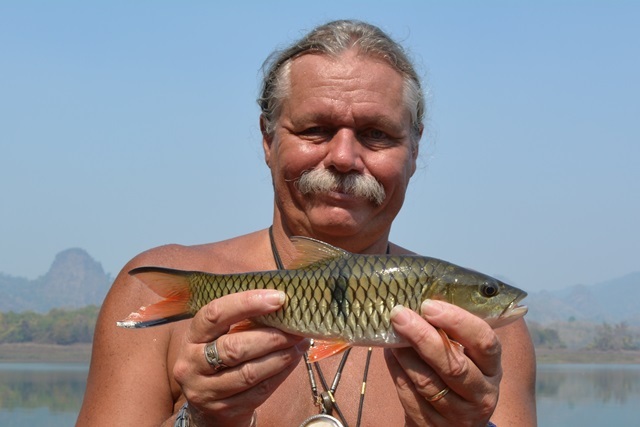 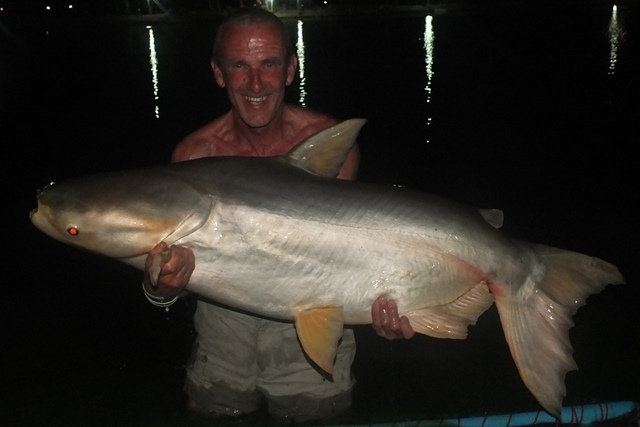 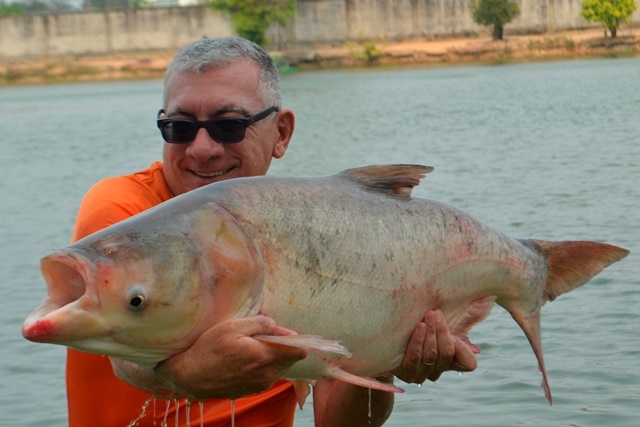 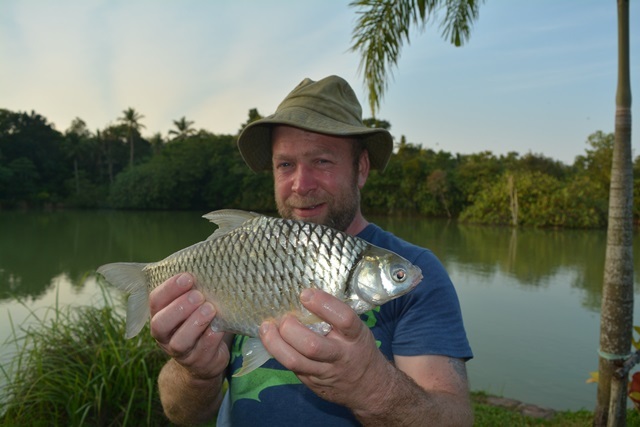 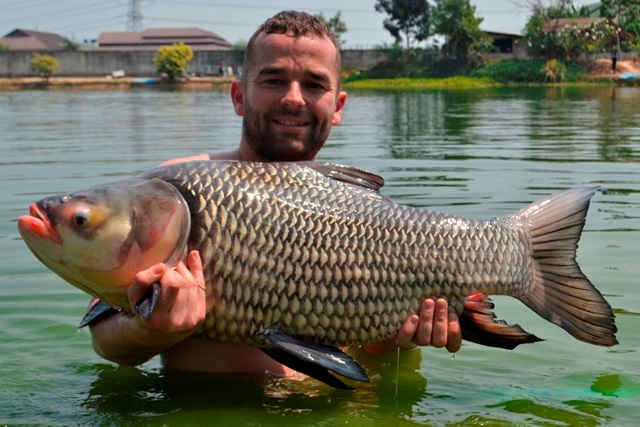 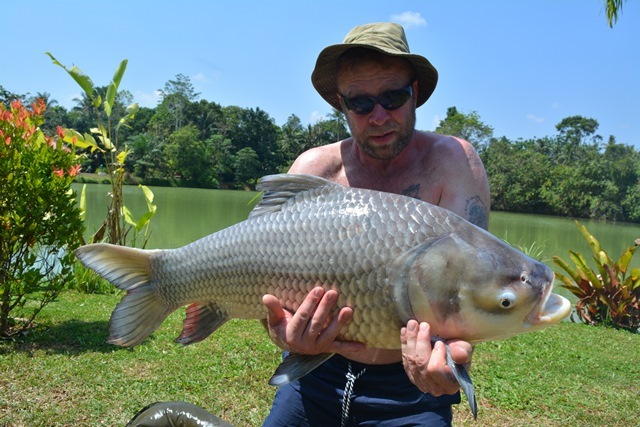 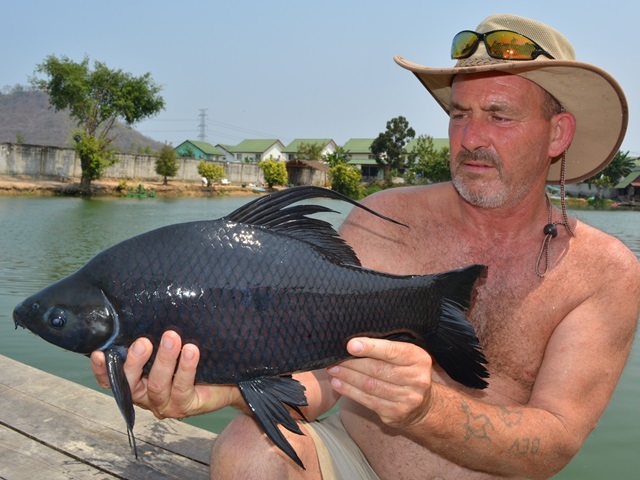 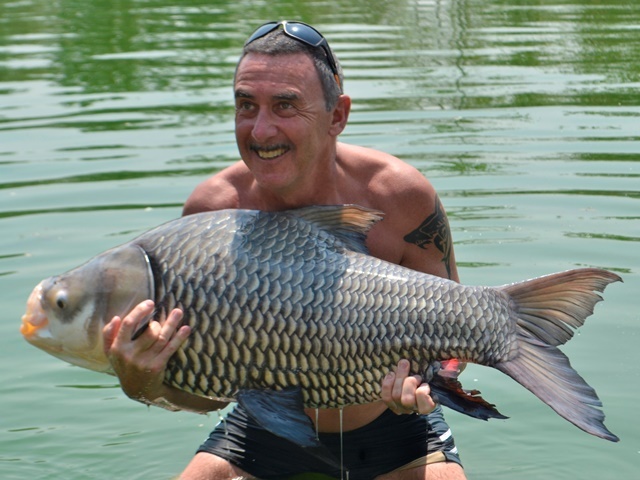 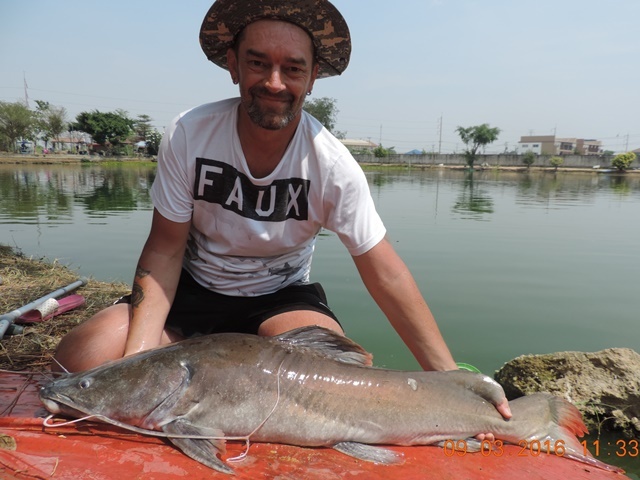 French angler Didier Snoop was back catching some of the rarer Palm Tree inhabitants like Chinese bighead carp, vundu catfish and wallago leeri. 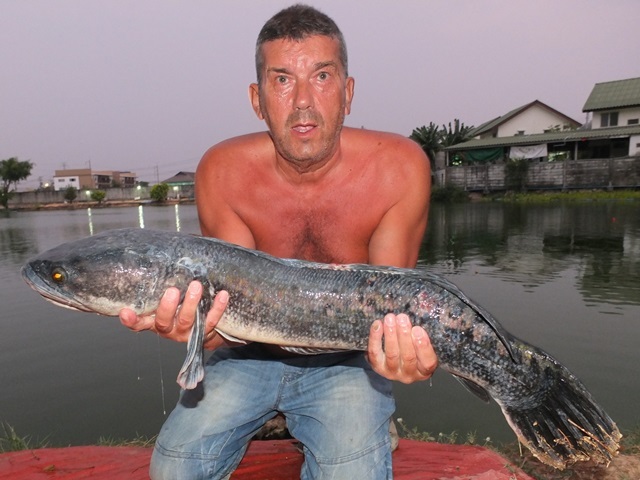 He also caught Mekong catfish and Amazon redtail. 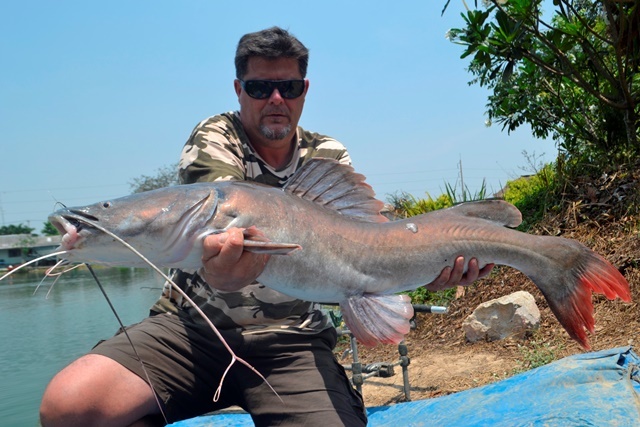 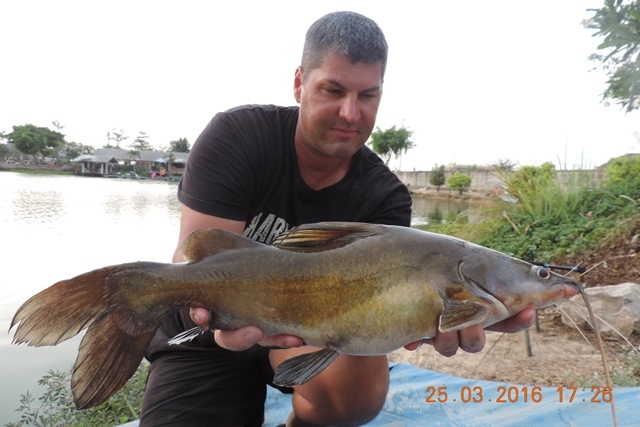 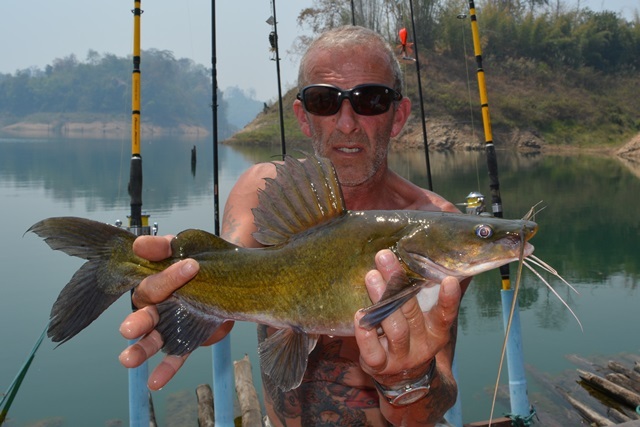 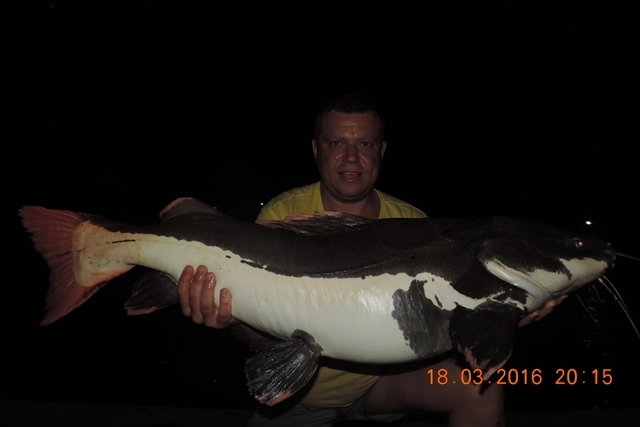 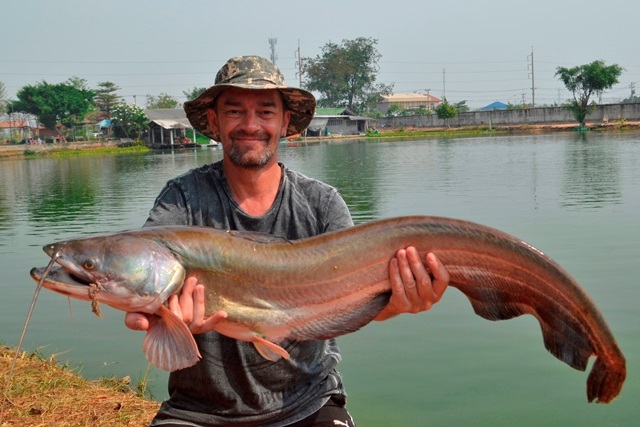 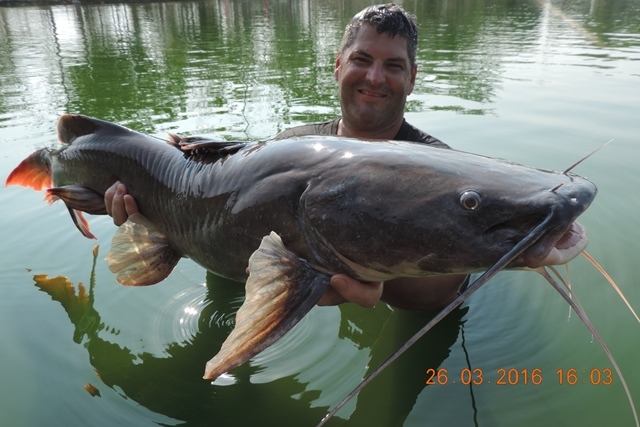 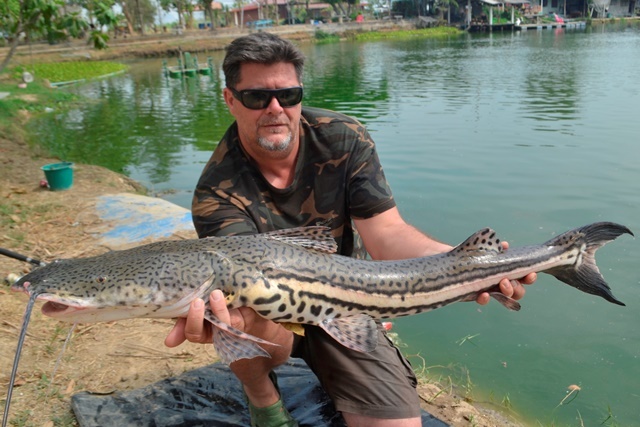 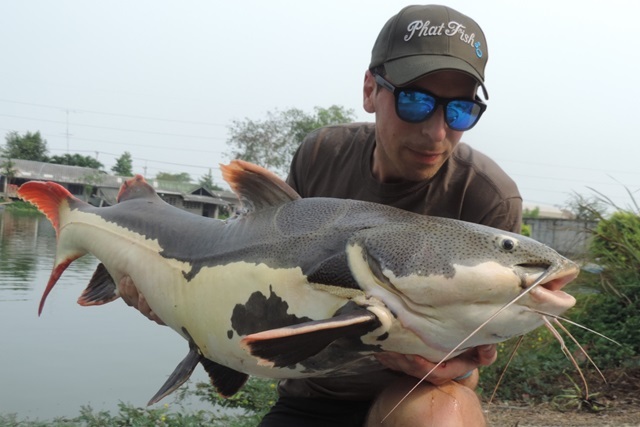 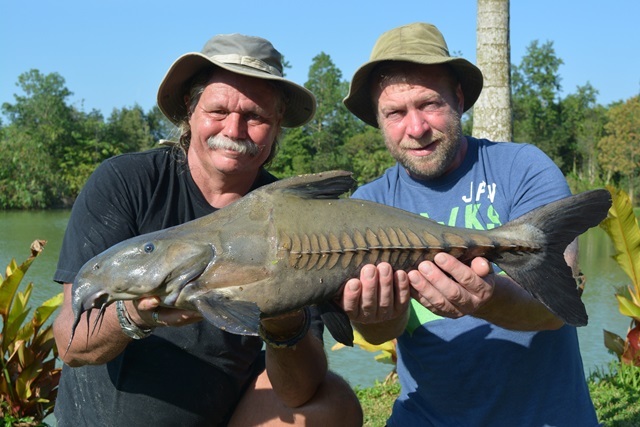 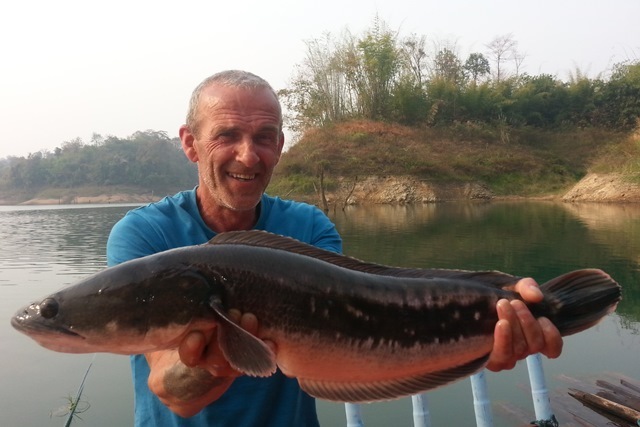 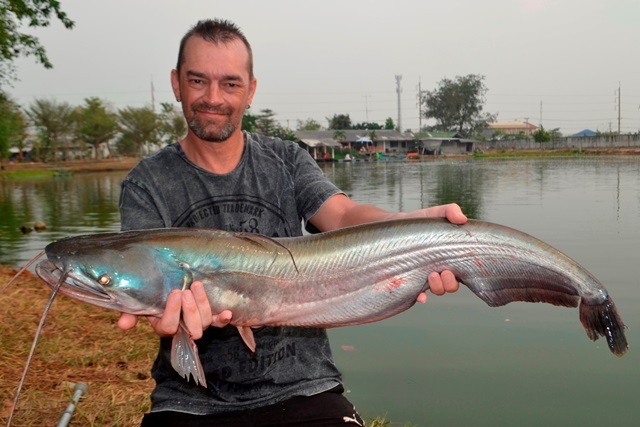 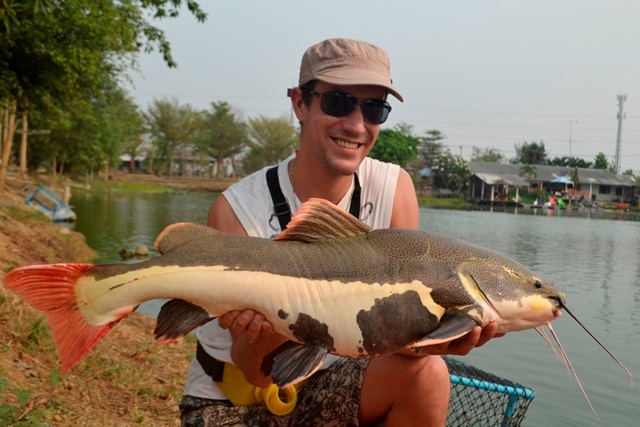 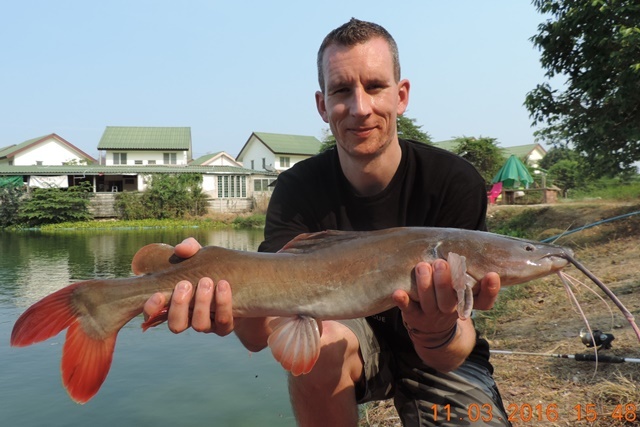 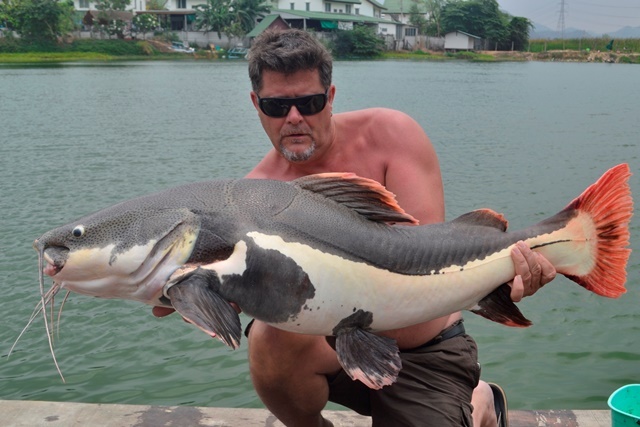 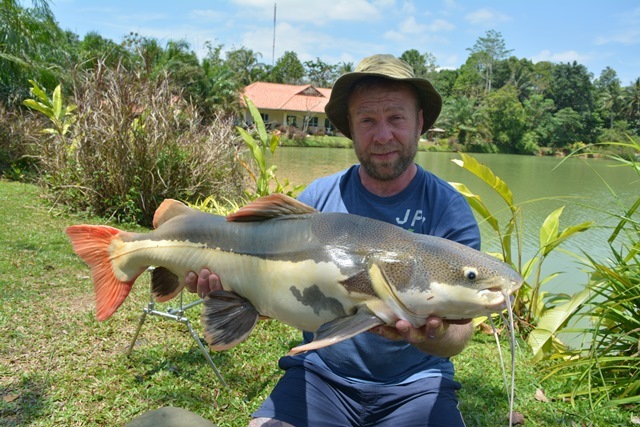 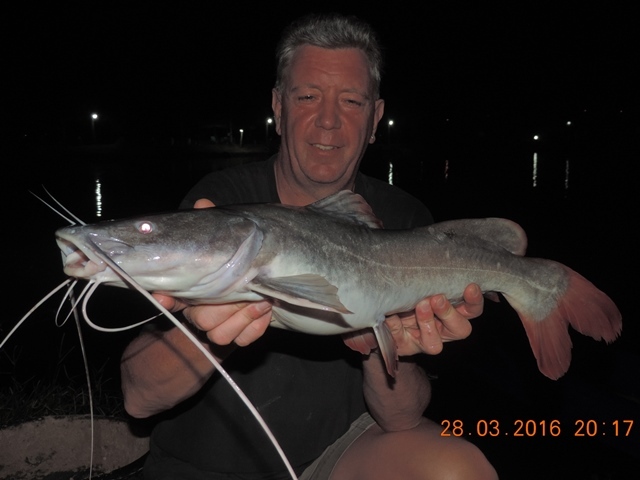 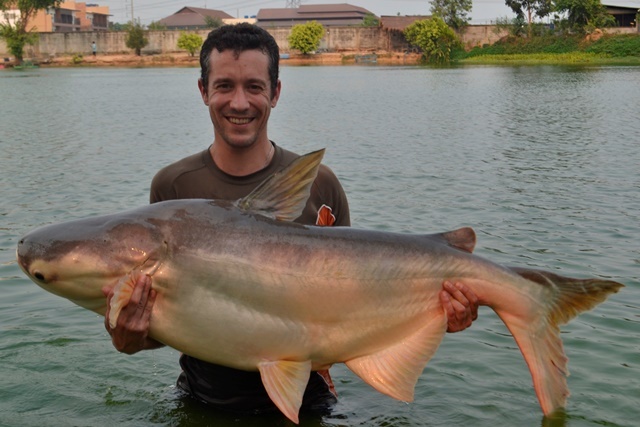 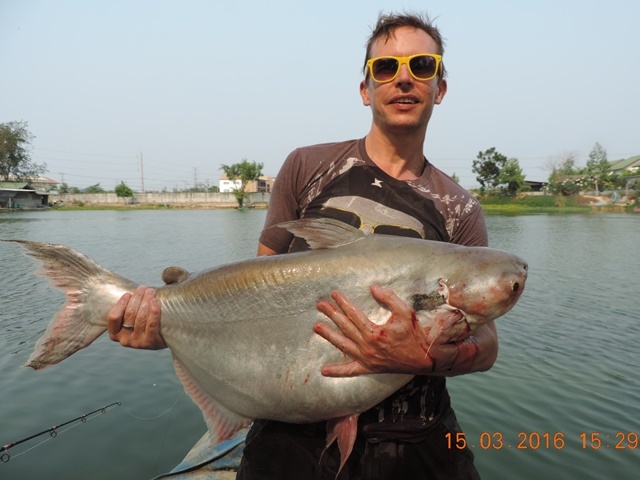 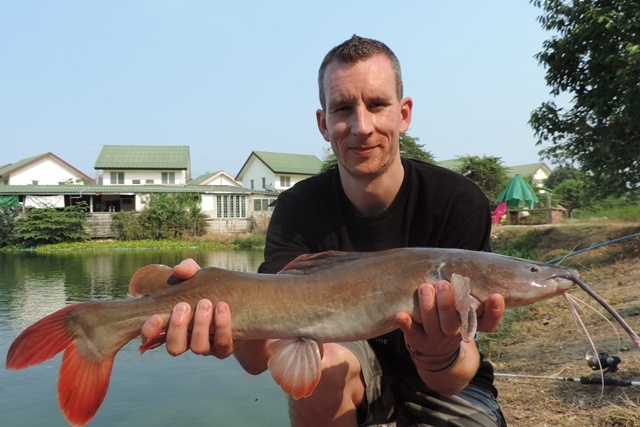 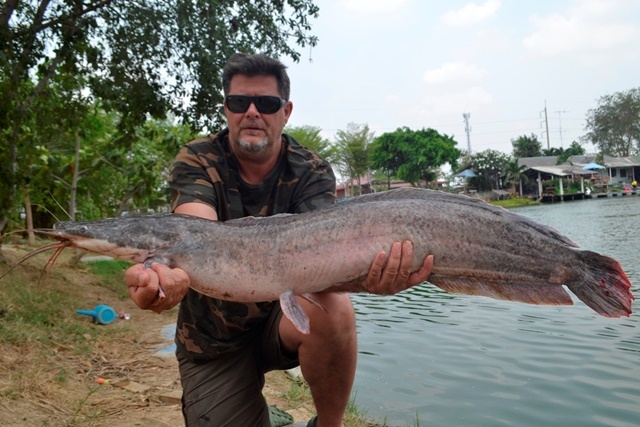 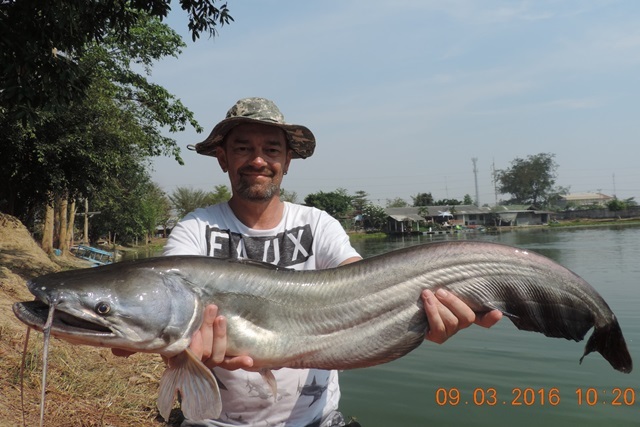 Another happy customer who made his first visit to Palm Tree during the month was French angler Josselin Sellier catching some hard fighting Mekong catfish as well as parapatinga, big-Y catfish, striped catfish and Amazon redtails. 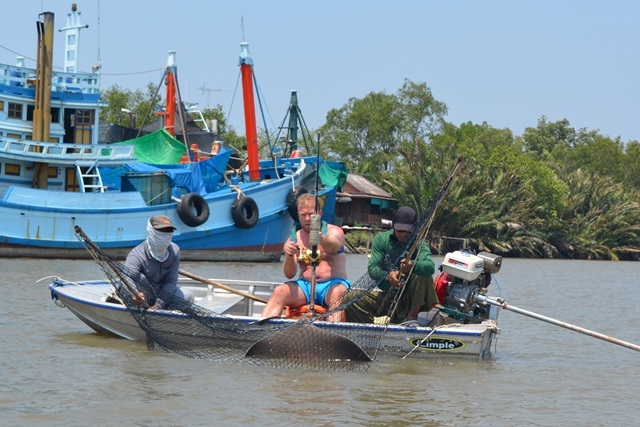 Martin Dunkling was more than happy with his catches not only extending his stay but also vowing to be back soon. 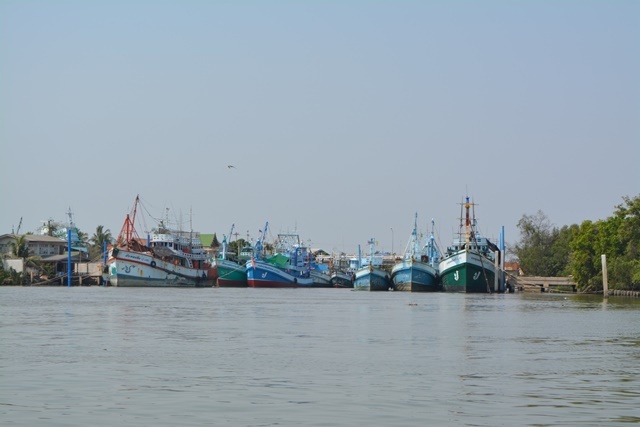 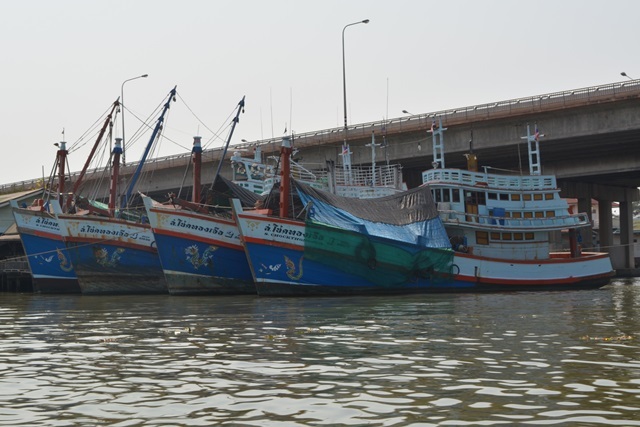 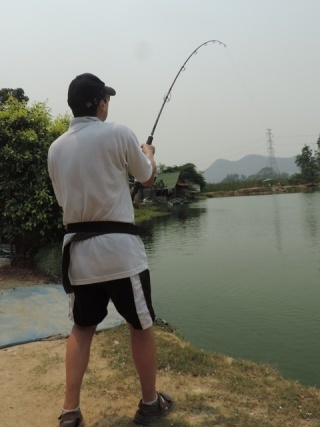 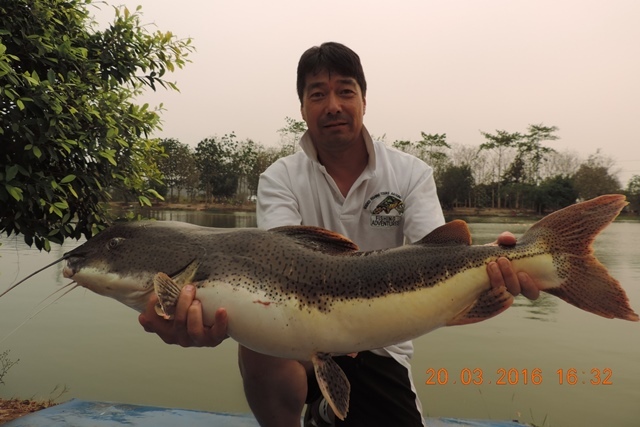 He caught a number of great fish like Mekong catfish, tiger catfish, black shark minnow, black ear catfish, mrigal, striped catfish, catfish shark as well as both Thai and Amazon catfish. 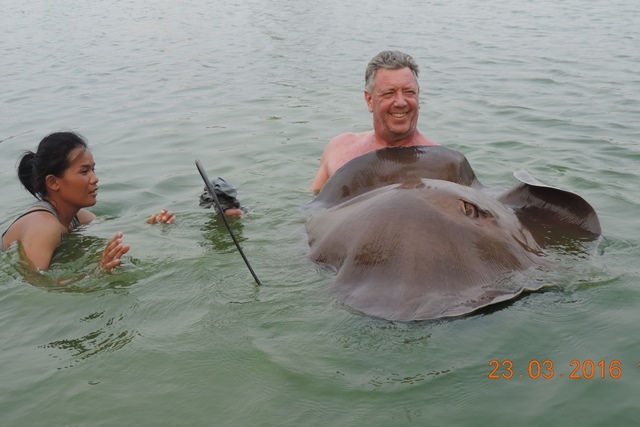 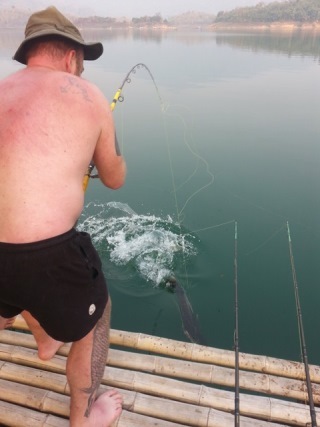 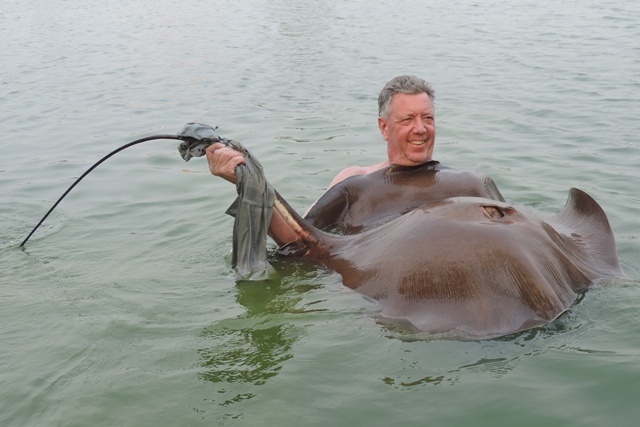 Neil Hunt accompanied Tim for a bit of wild Giant Freshwater Stingray fishing on the Mae Klong River and even though the current was whipping through they did eventually manage to land one. 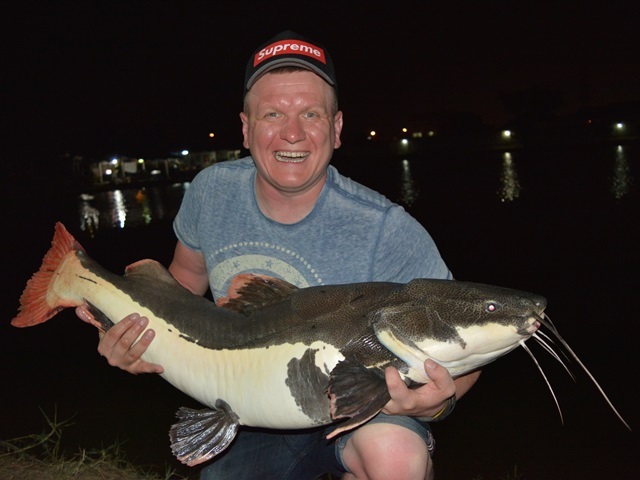 Simmo and his fishing mate Dave made there first visit to Palm Tree during the month with Simmo catching his first ever African walking catfish. 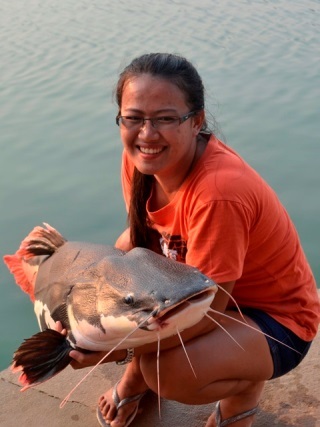 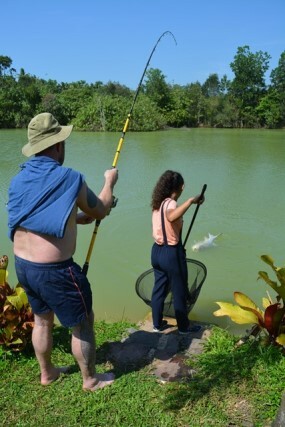 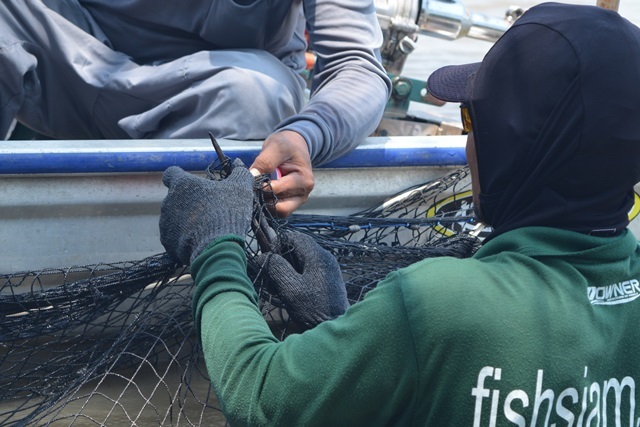 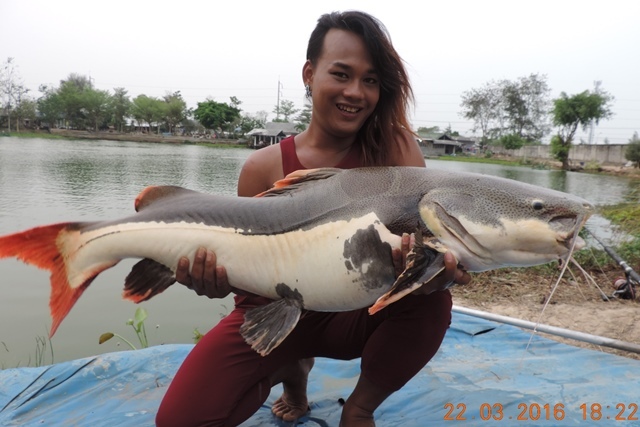 They also caught a number of other great catches that included Mekong catfish, leopard catfish, big-Y, striped catfish as well as both Asian and Amazon redtails. 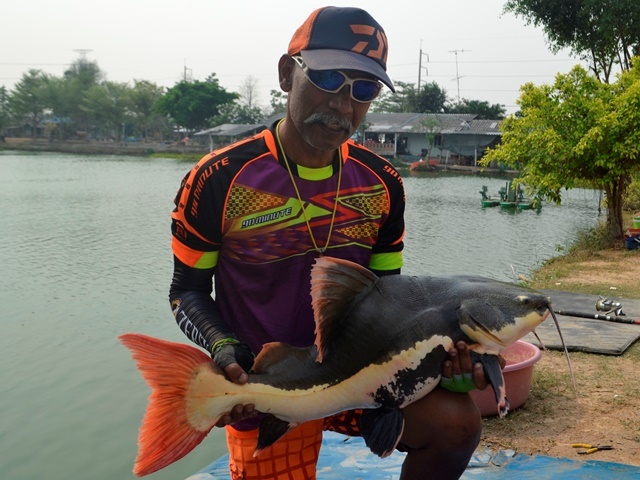 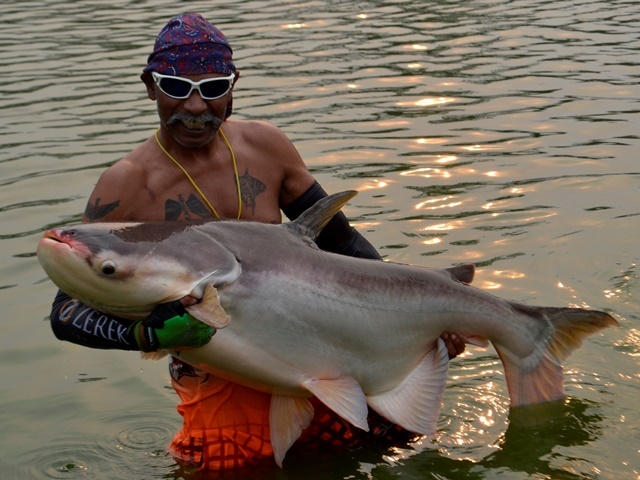 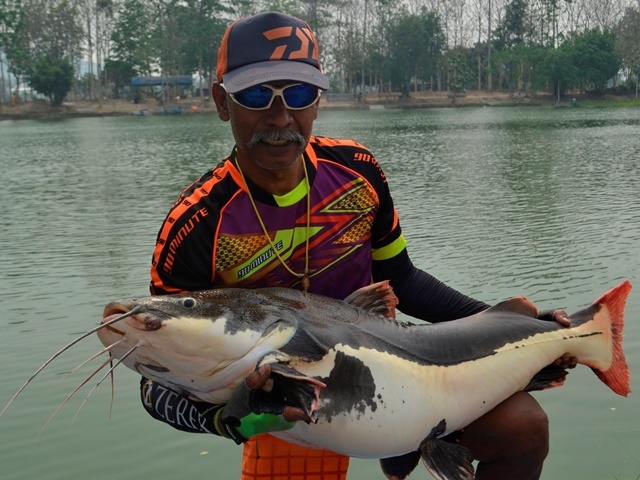 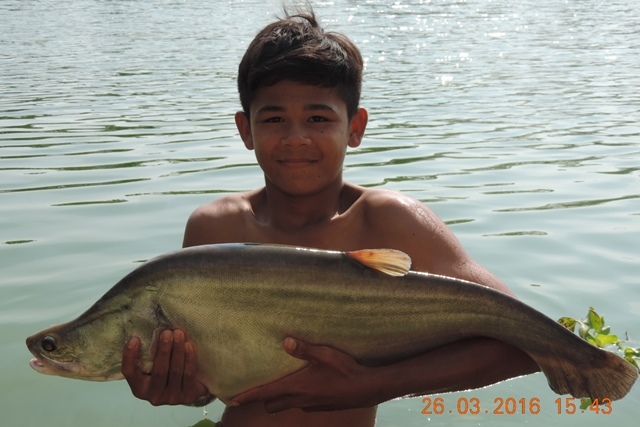 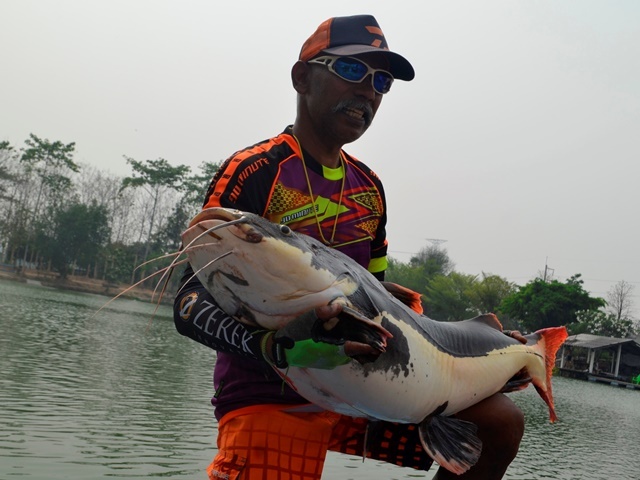 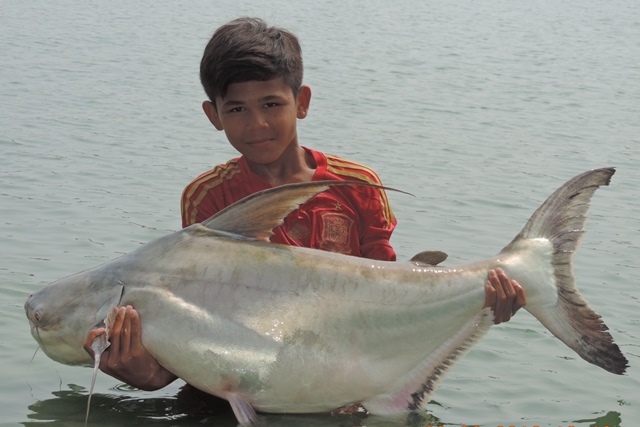 Tap of Bangkok Fishing Guide Service third trip of the month resulted in his customer Revindran Arumugam had a good day successfully catching Mekong catfish, big-Y catfish and a number of Asian redtails. 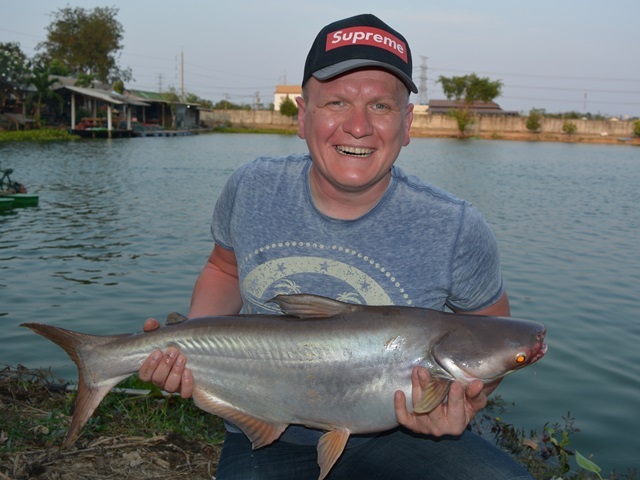 Philip Wright joined his brother Baz Wright and his mates for his first session and caught a number of great catches topped off by a 100lb+ Siamese carp. 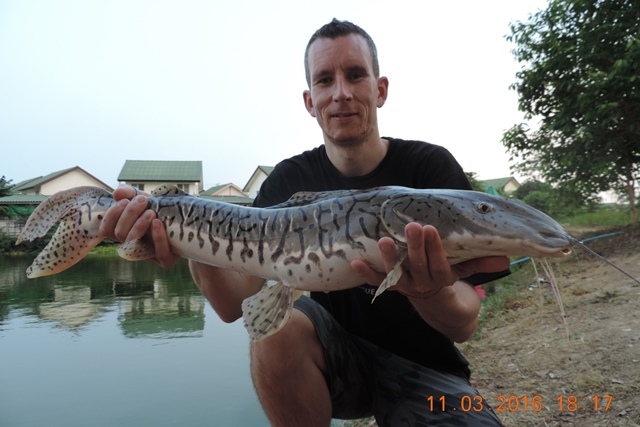 In addition he also caught a huge giant featherback, leopard catfish, crystal eyed catfish, chao phraya, wallago attu, Mekong catfish, big-Y catfish, pacu,striped catfish, catfish shark as well as both Amazon and Thai redtails. 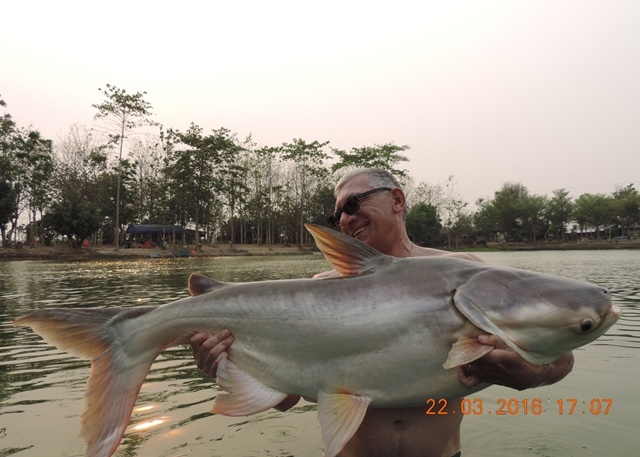 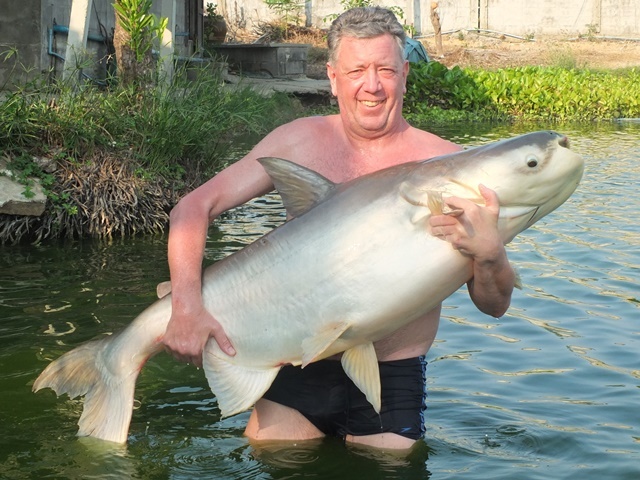 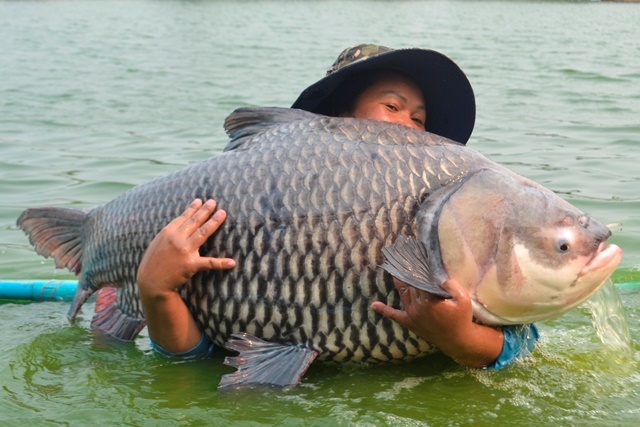 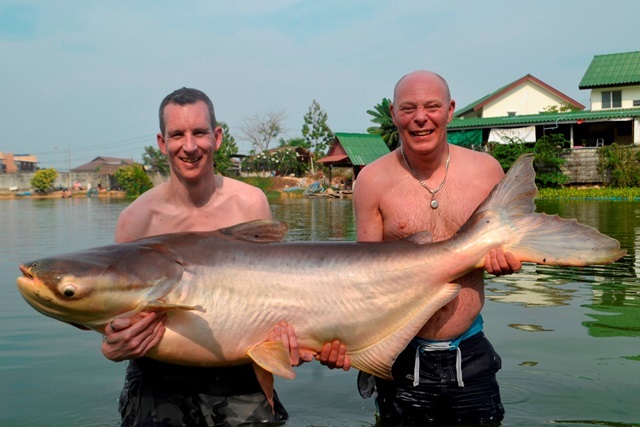 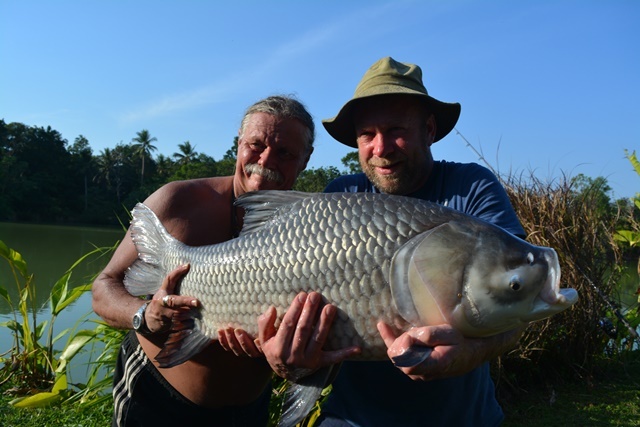 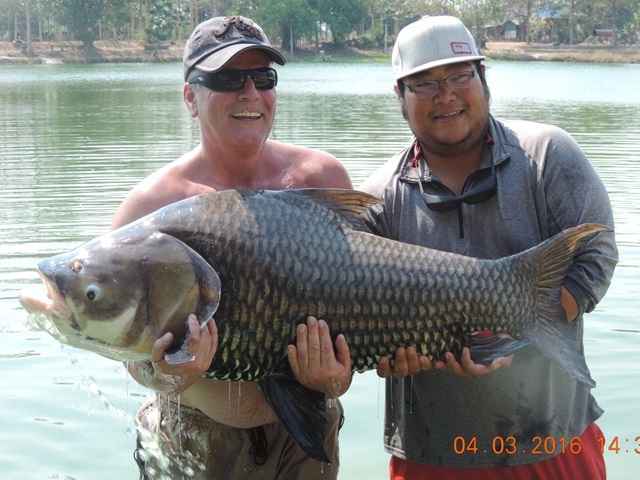 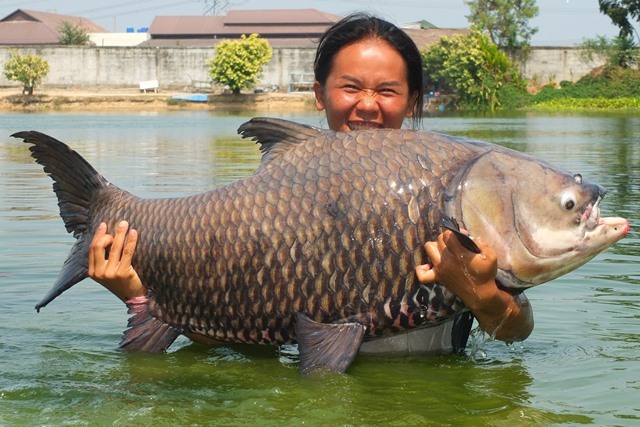 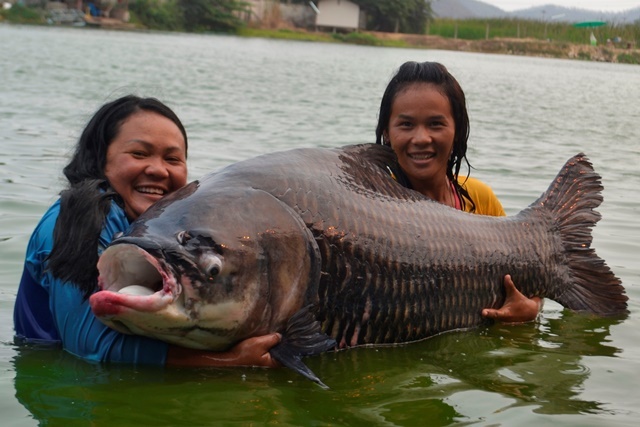 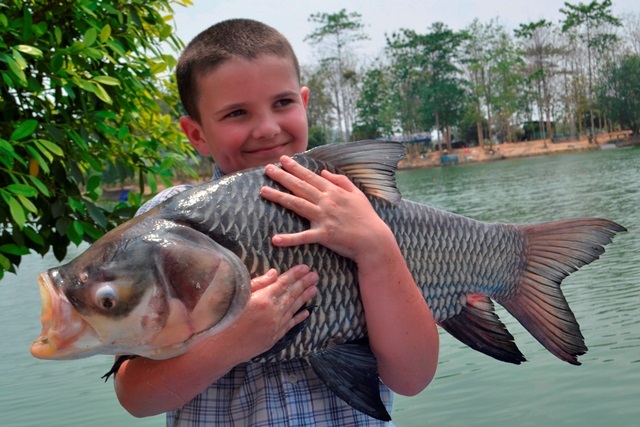 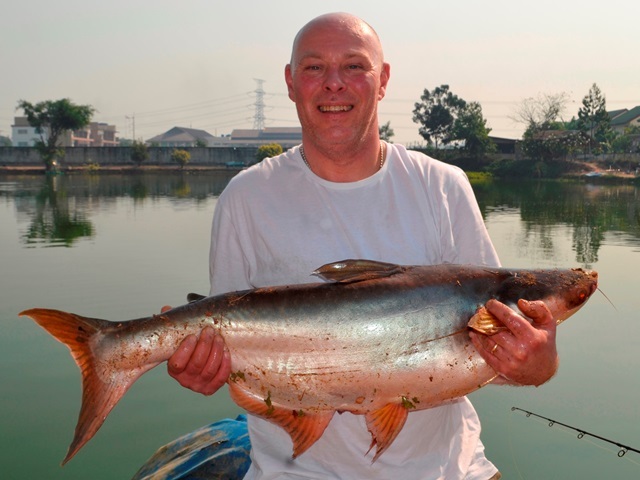 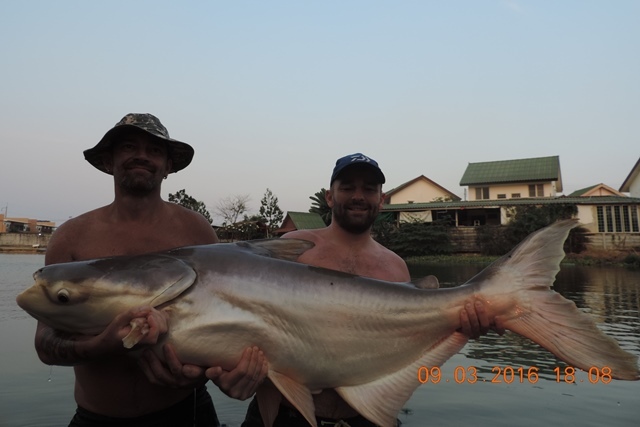 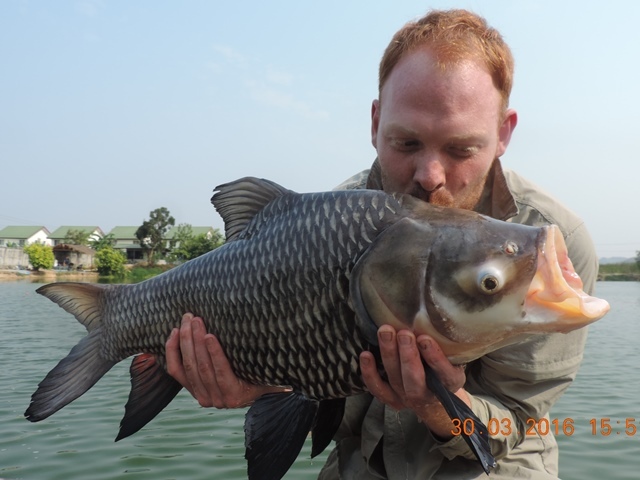 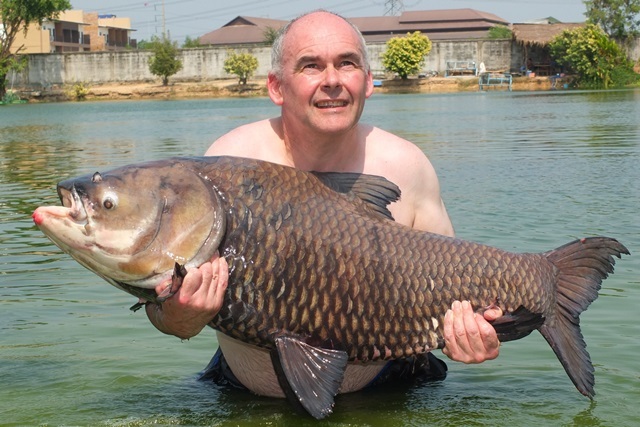 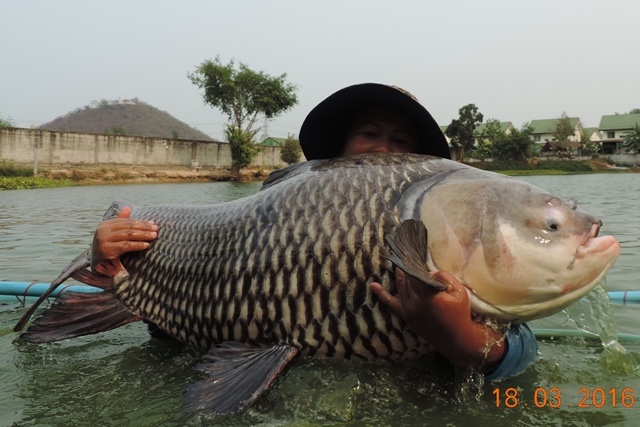 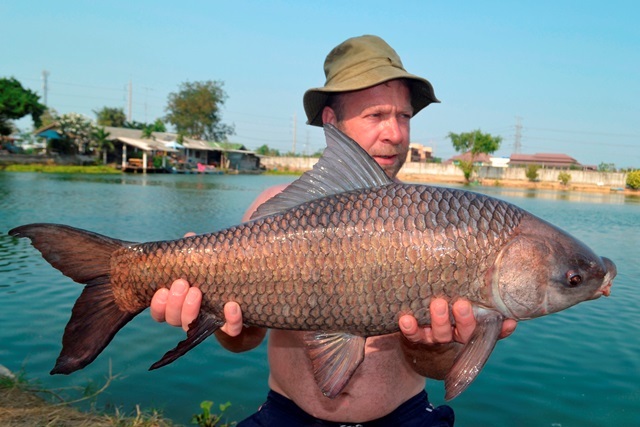 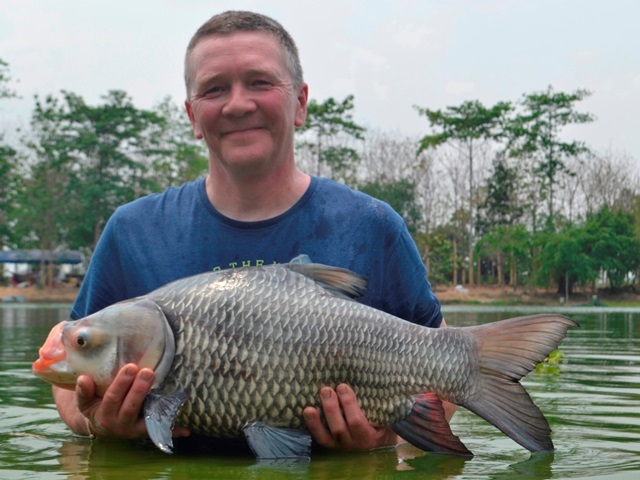 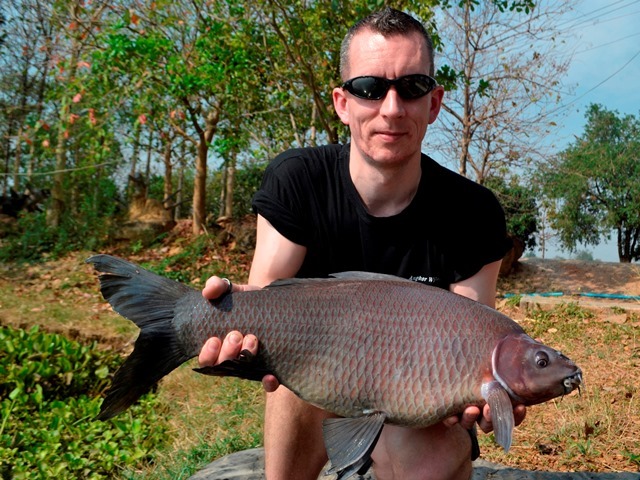 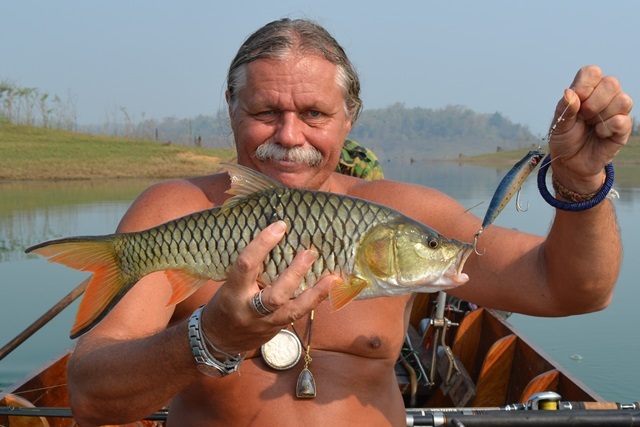 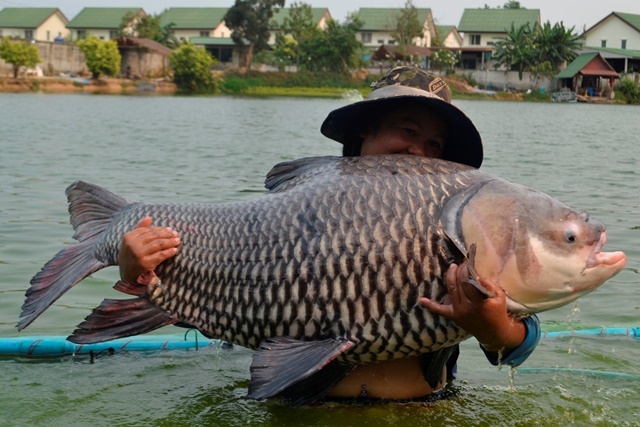 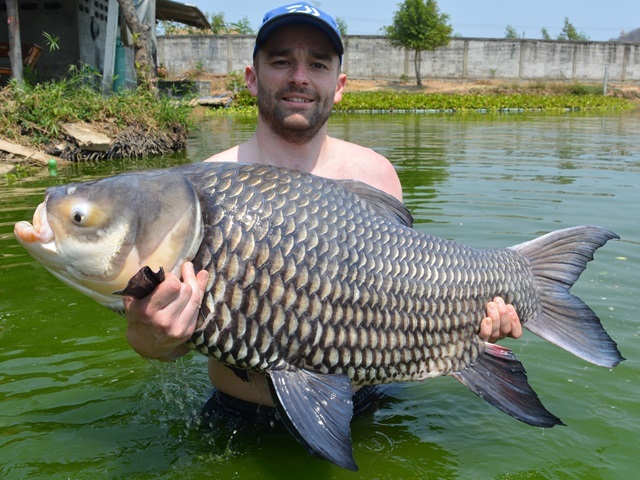 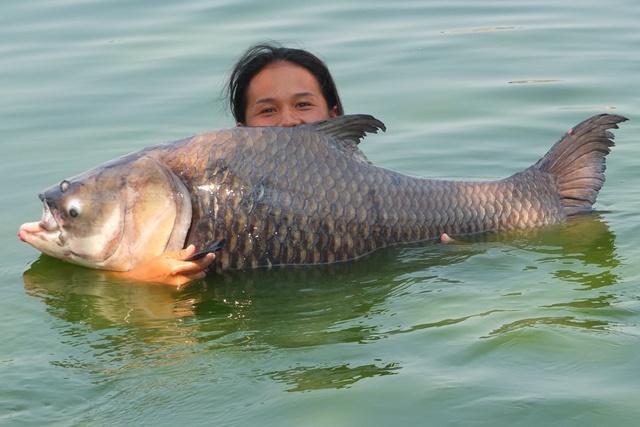 Fish Siam Thailand also sent a couple of clients down during the month who were more than happy with their catches of Siamese carp, tambaqui and Amazon redtails. 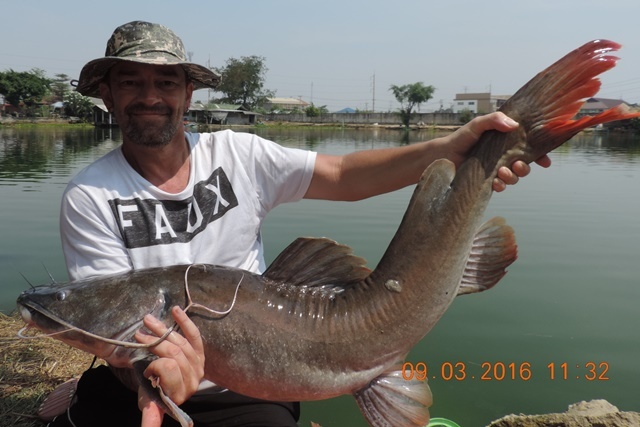 Tap of Bangkok Fishing Guide Service customers for his second visit of the month were all smiles catching Mekong catfish, a very prettily marked barred souubim, and a number of Amazon redtails. 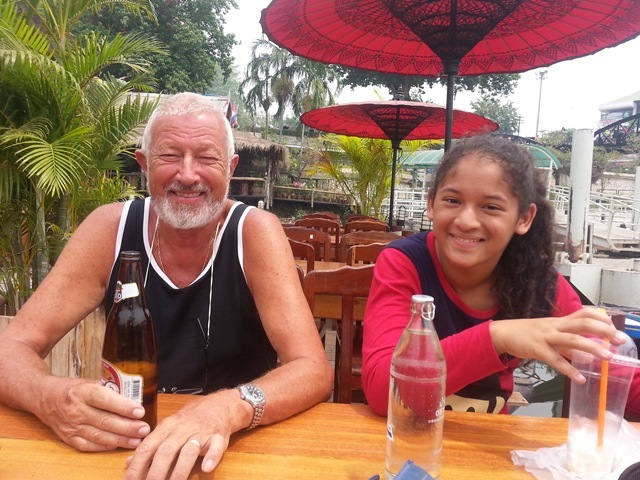 Kelly Reed made his first visit to Palm Tree during the month and brought his family along with him. 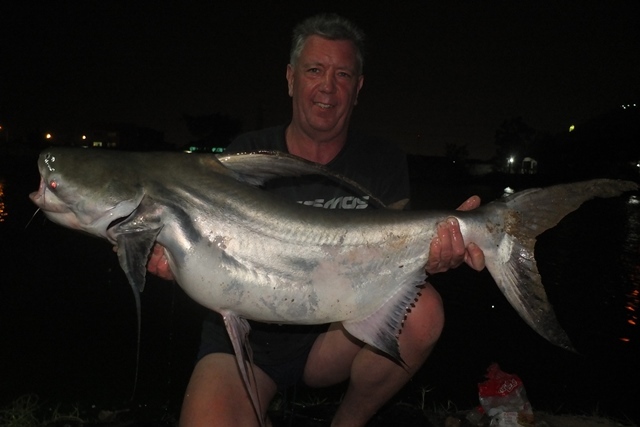 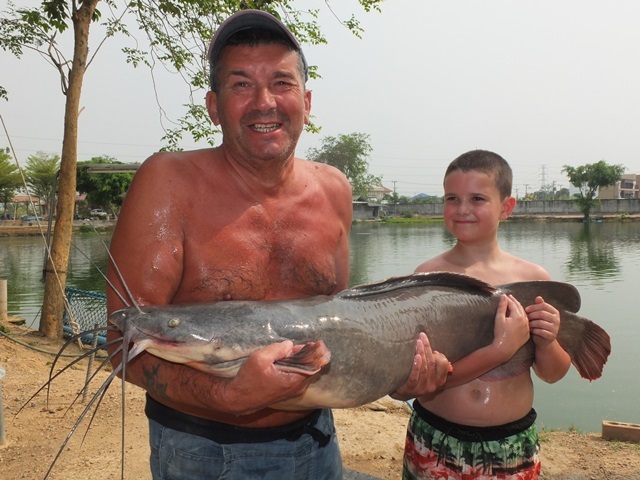 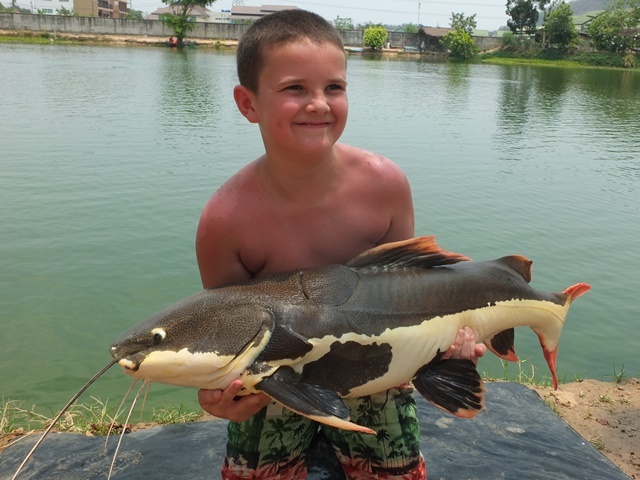 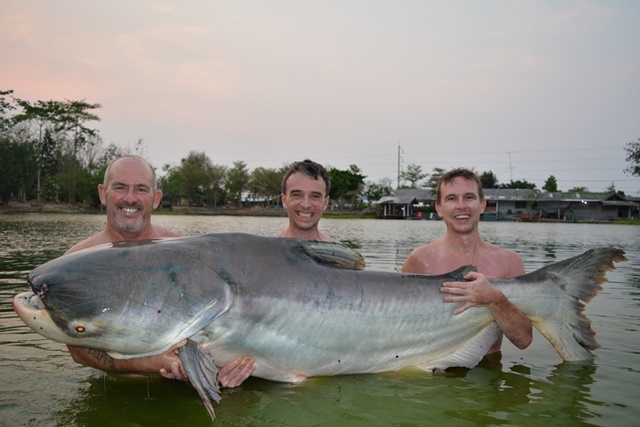 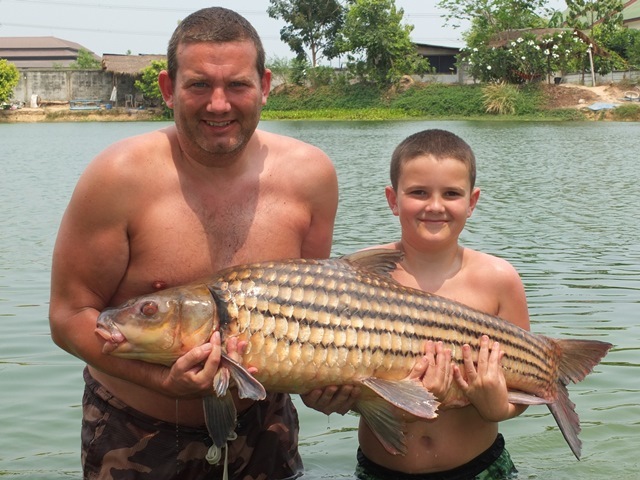 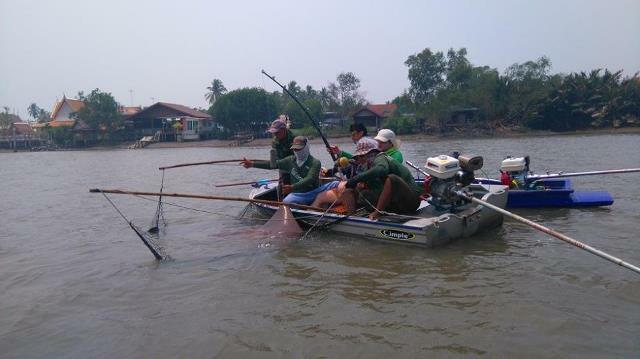 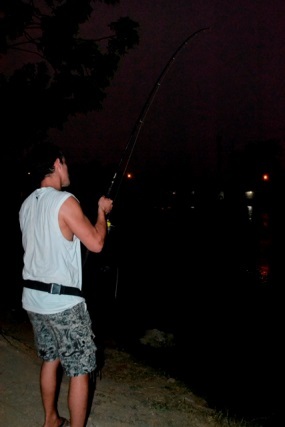 They had a great day catching Mekong catfish, big-Y catfish, chao phraya, striped catfish and catfish shark. 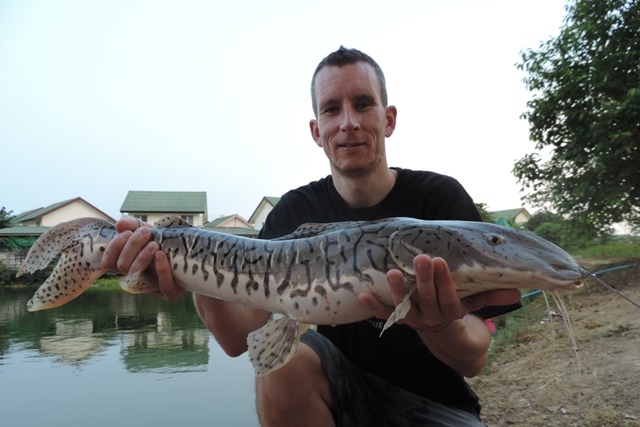 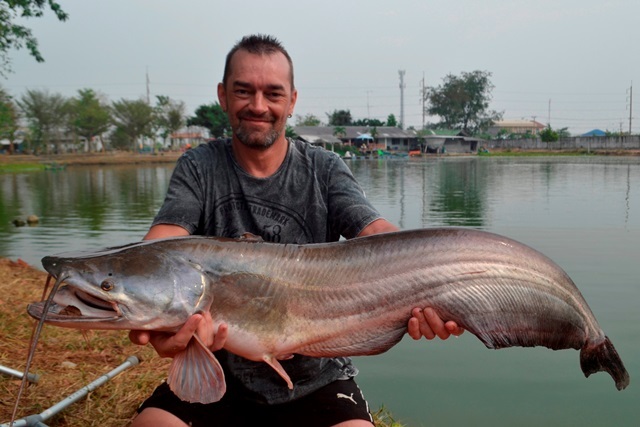 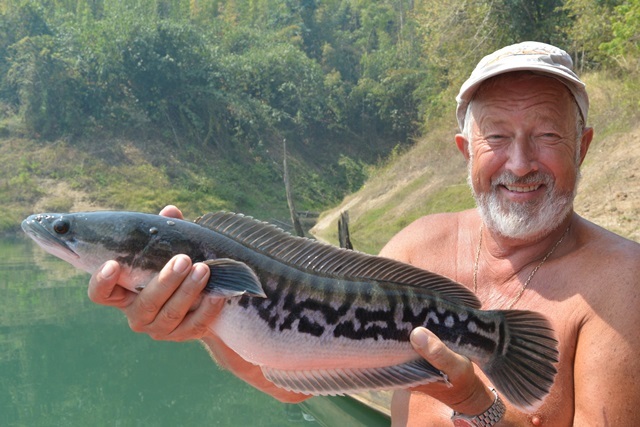 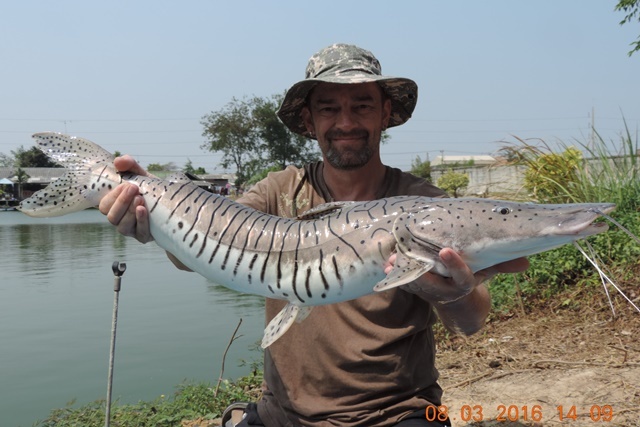 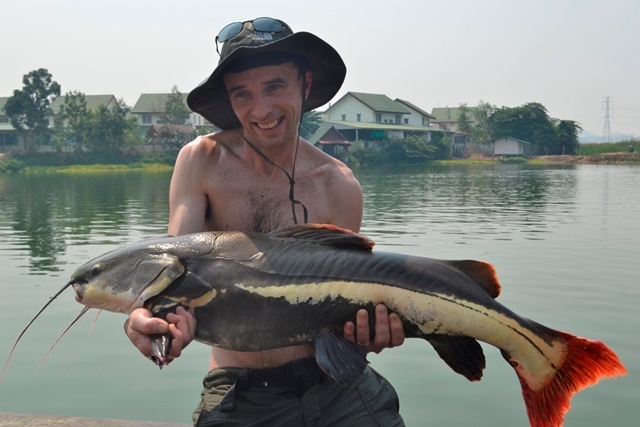 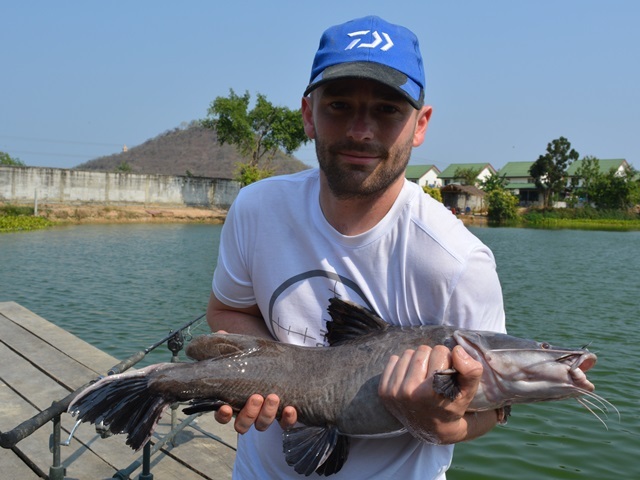 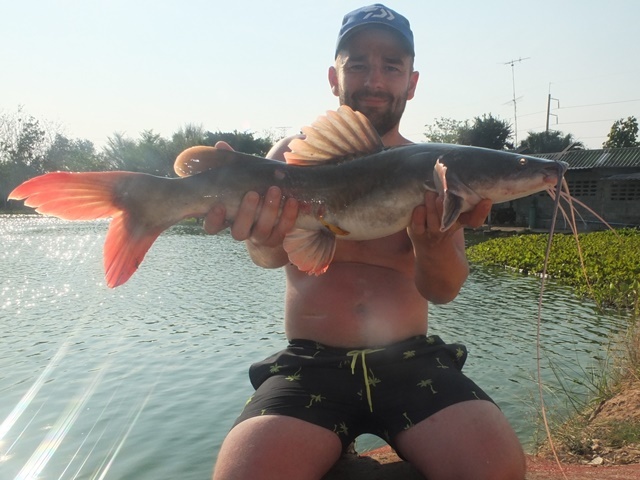 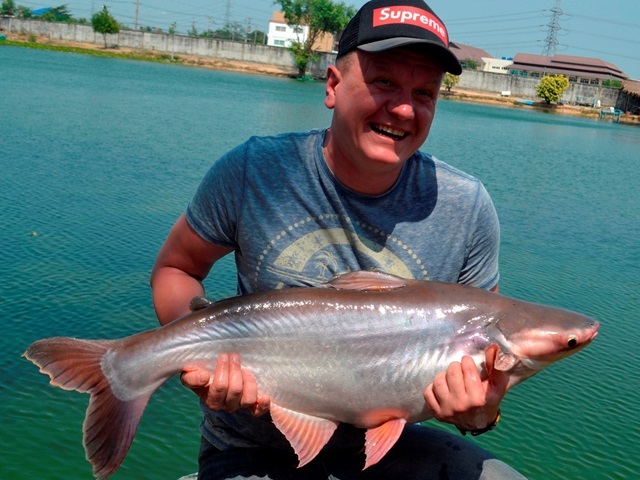 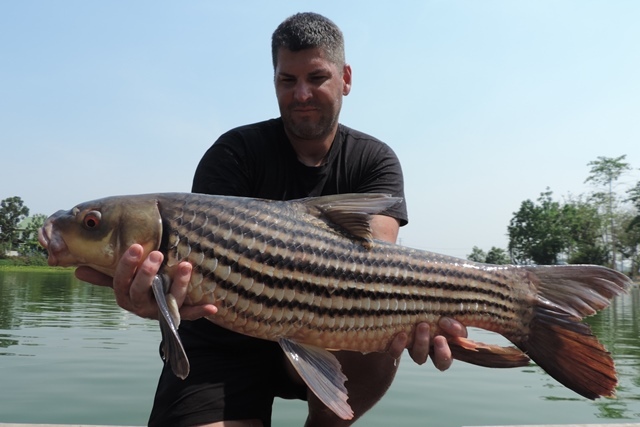 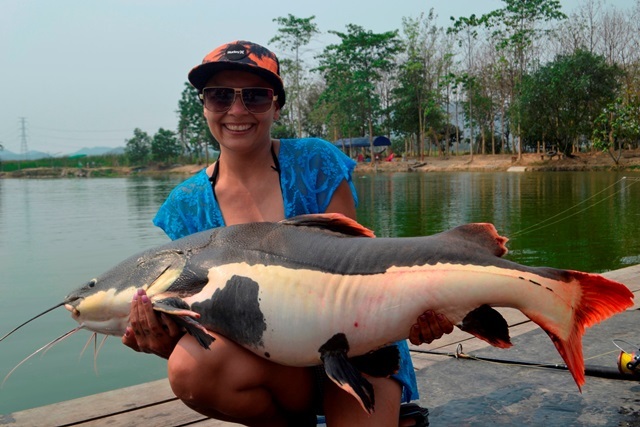 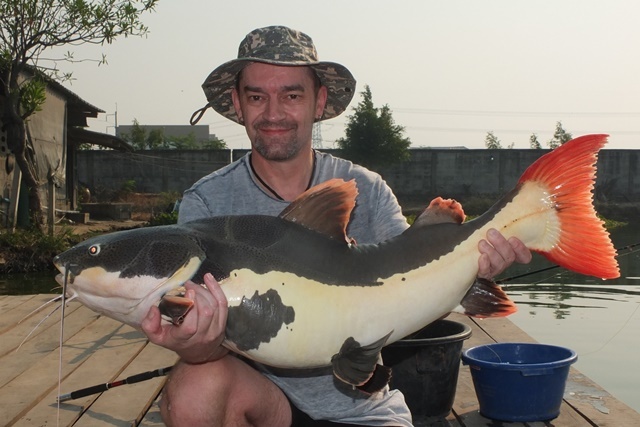 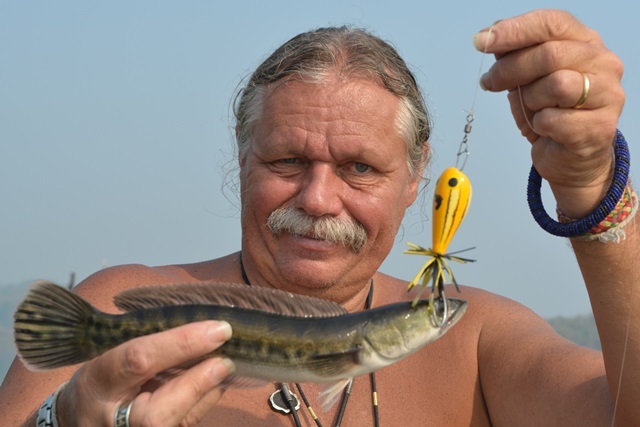 Polish angler Karol Jasinski who resides in the UK was all smiles with his catches of Mekong catfish, catfish shark, striped catfish and Amazon redtails. 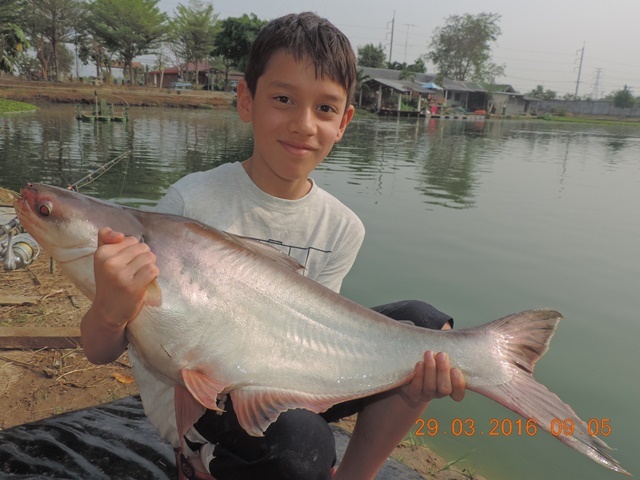 Tap of Bangkok Fishing Guide Service first trip of the month landed his customer a nice Siamese carp and some Amazon redtails. 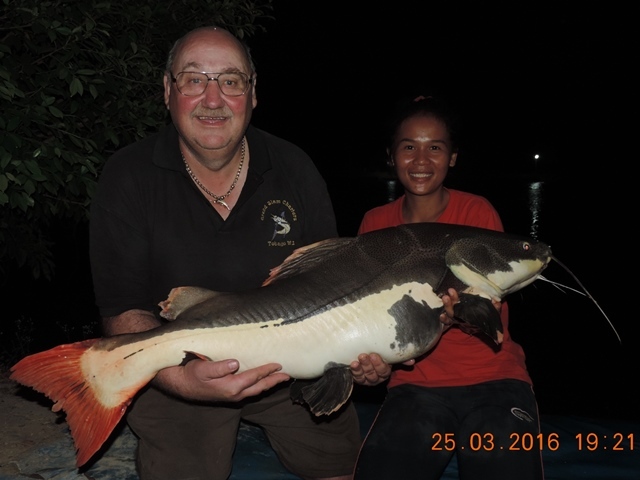 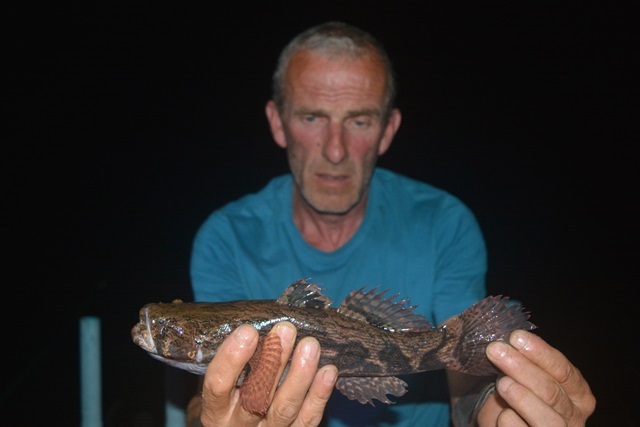 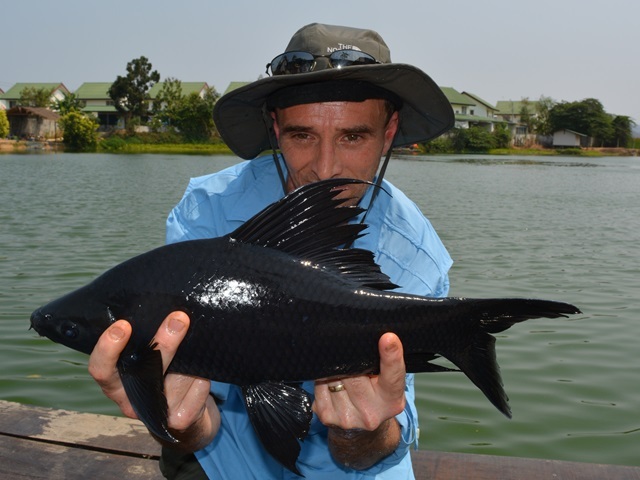 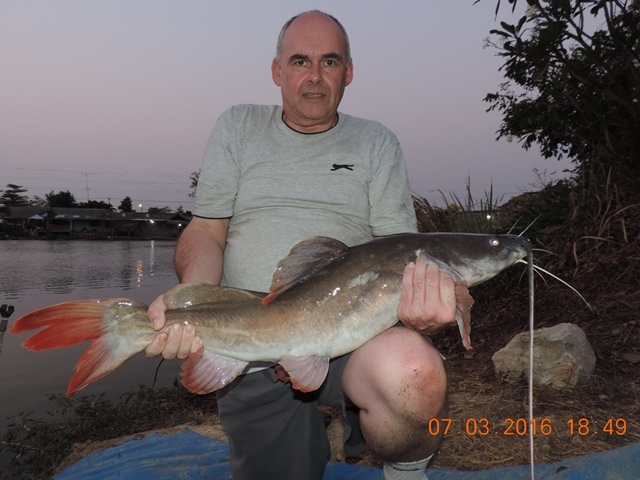 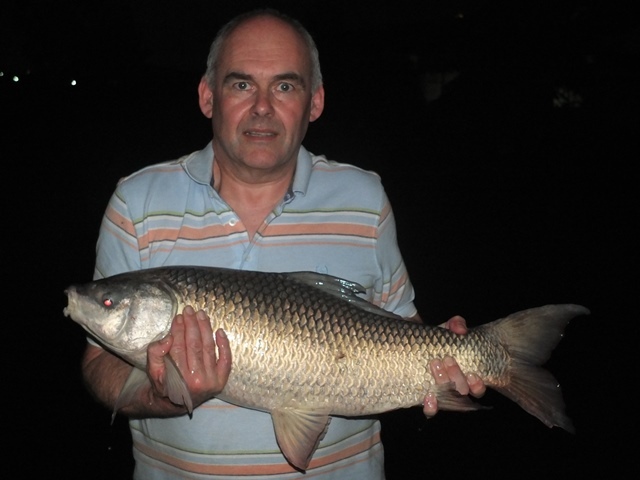 Neil Hunt returned to Palm Tree and caught a stunning rohu as well as Amazon redtail and striped catfish. 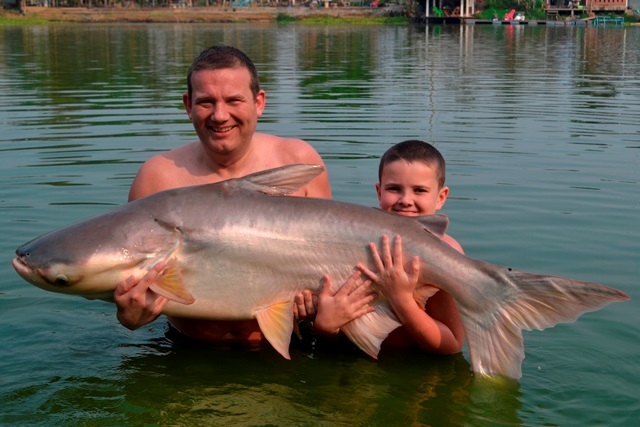 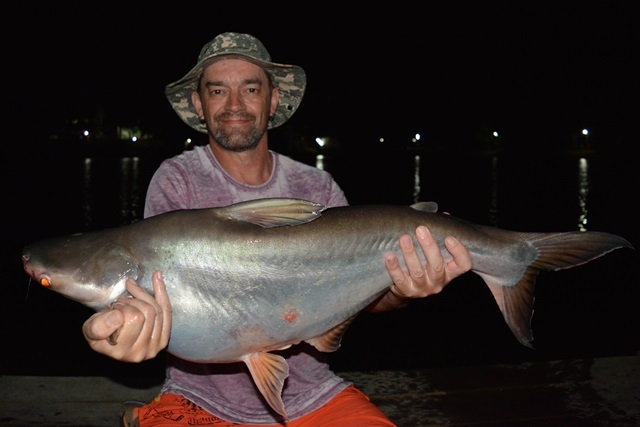 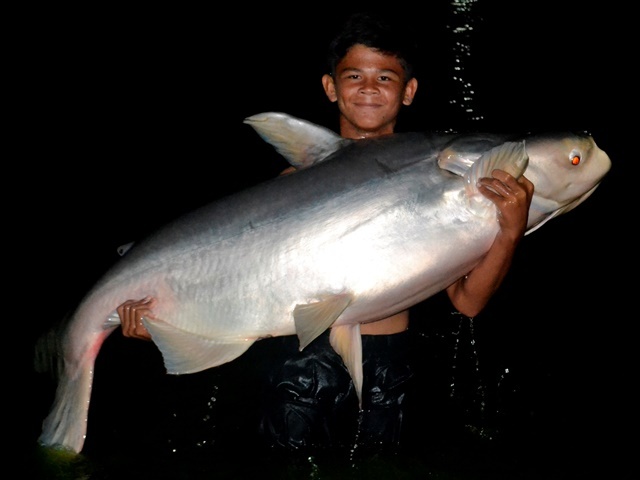 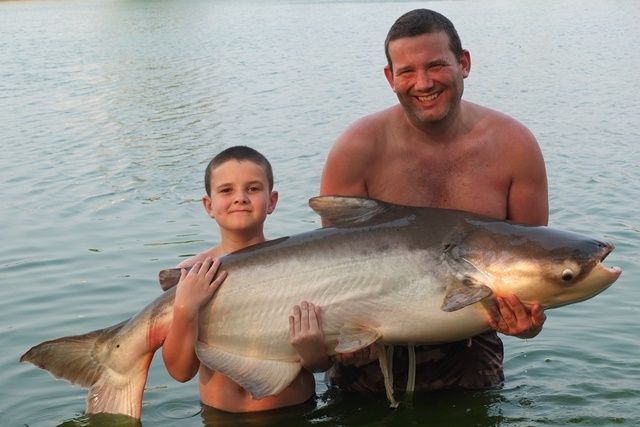 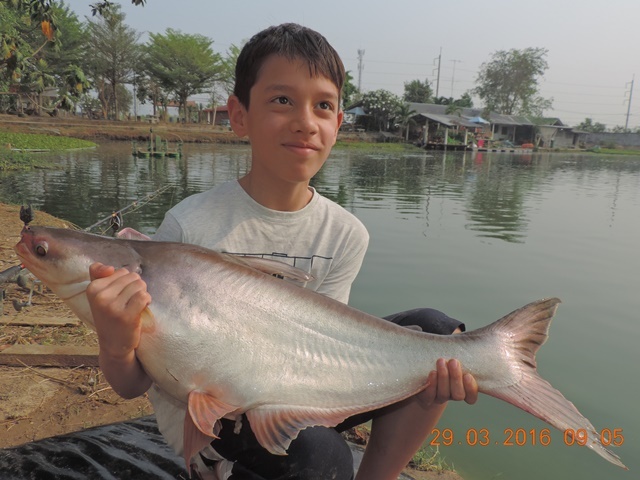 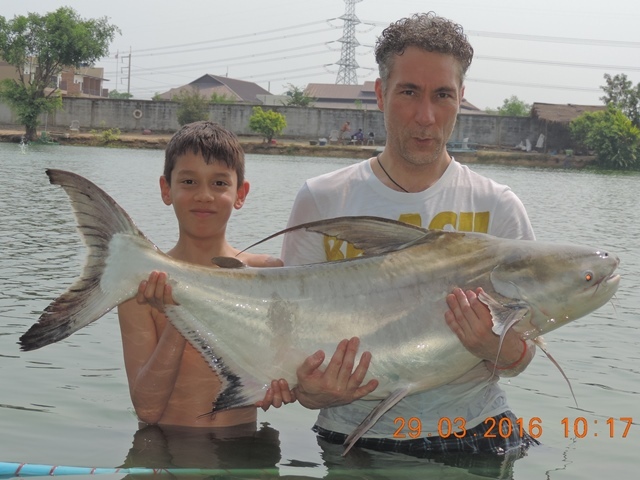 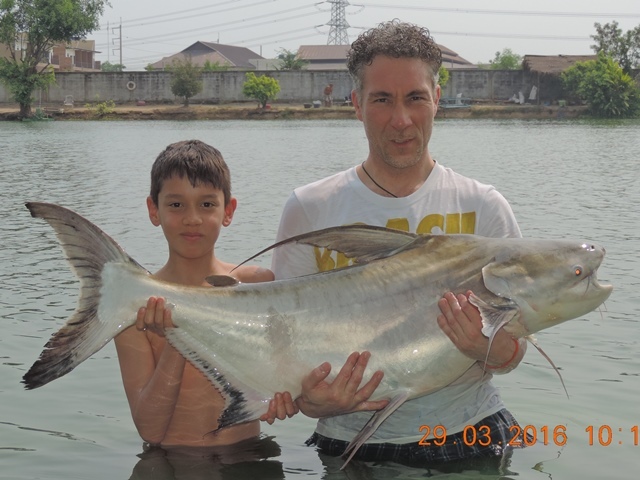 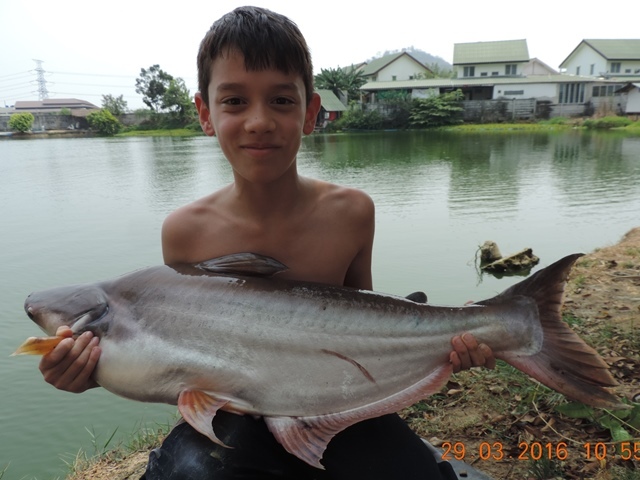 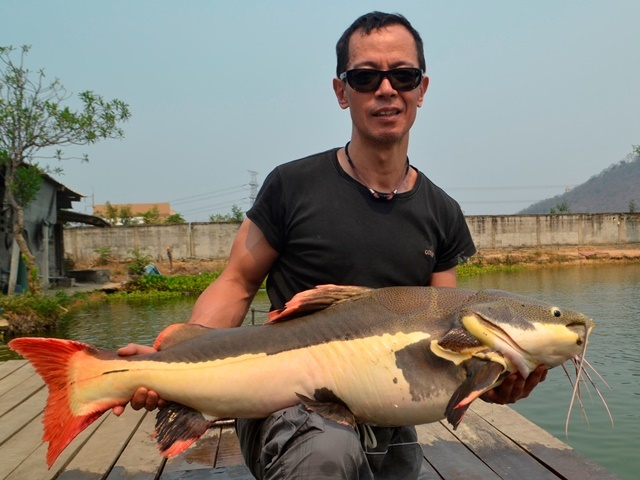 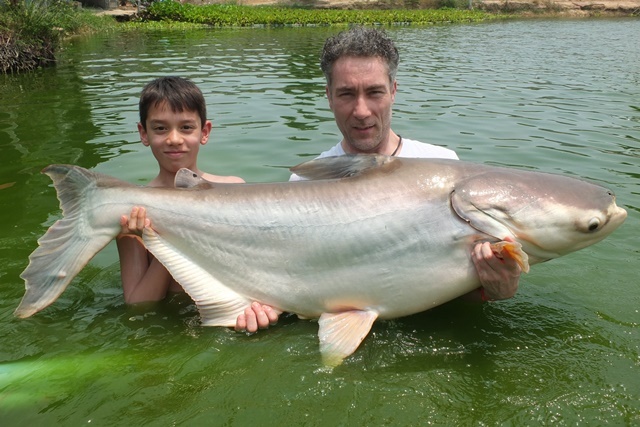 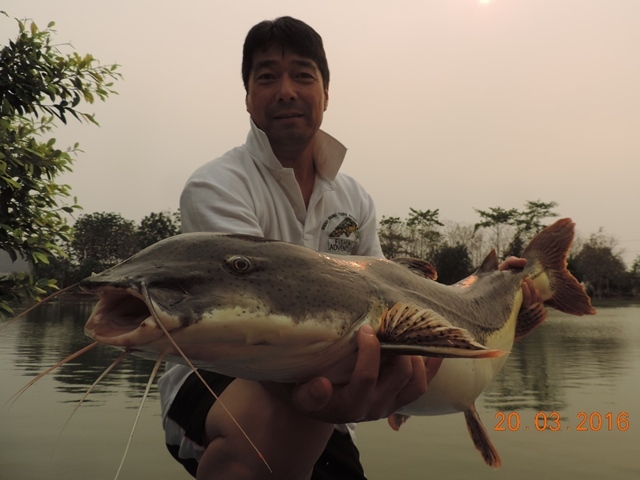 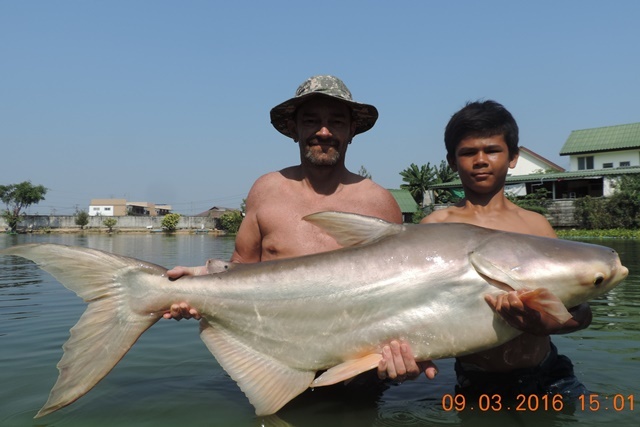 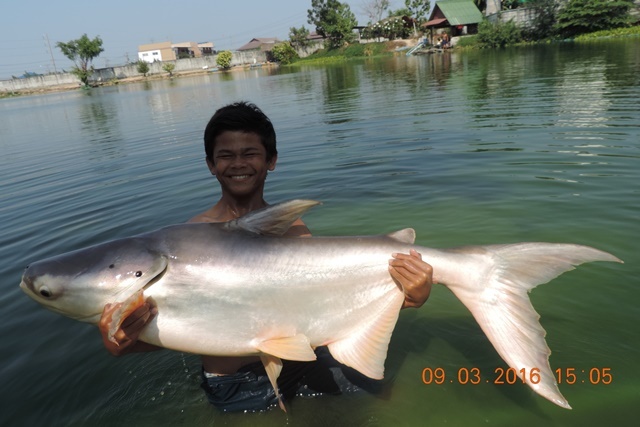 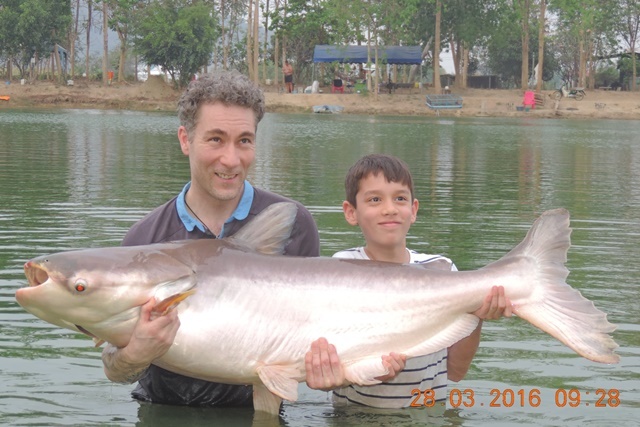 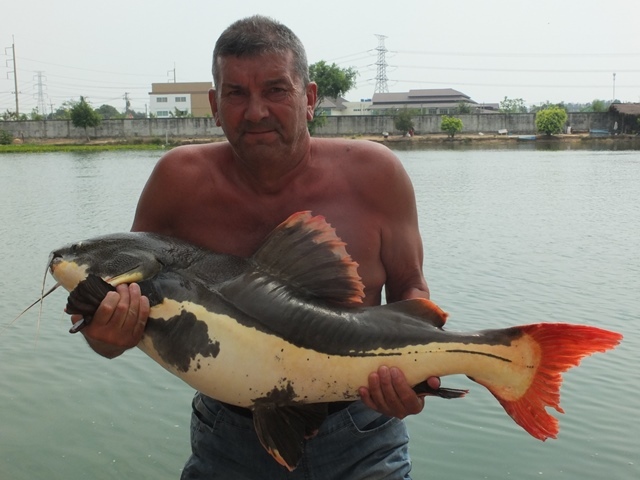 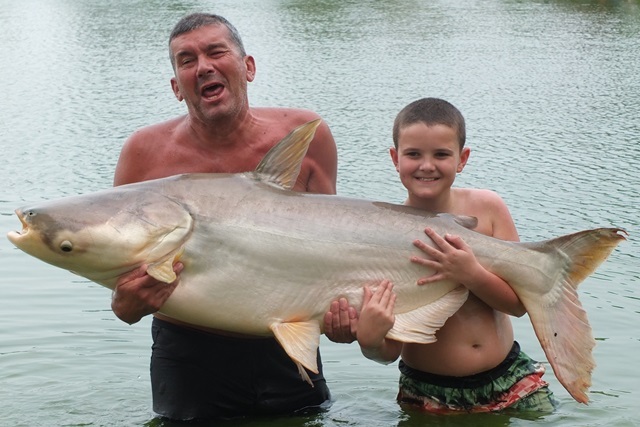 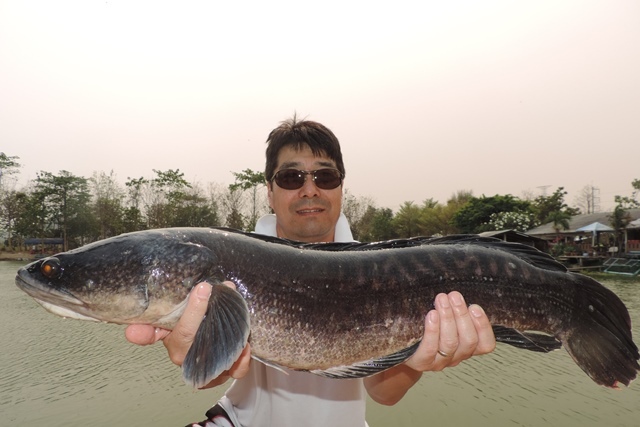 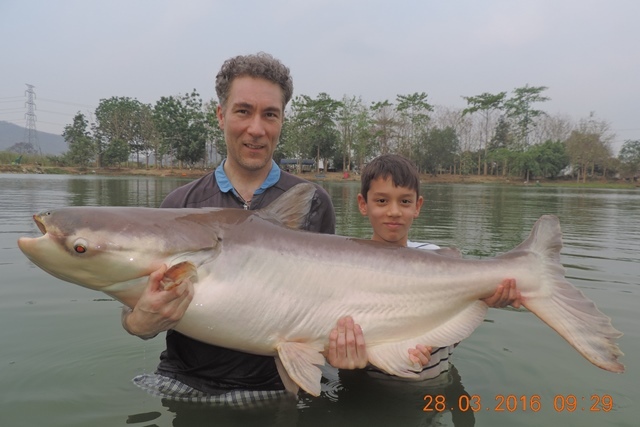 Bangkok resident Norio Nomoto visited with his son and had a couple of enjoyable days catching Mekong catfish, big-Y catfish and Amazon redtails. 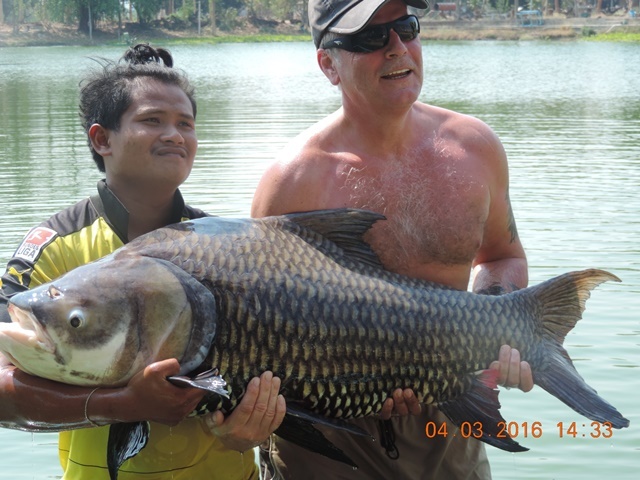 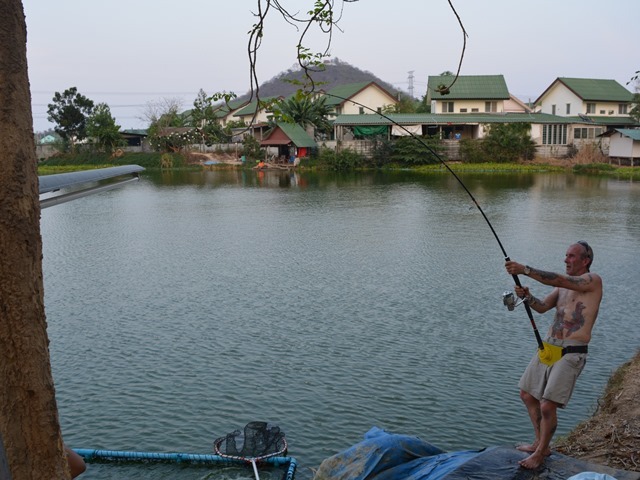 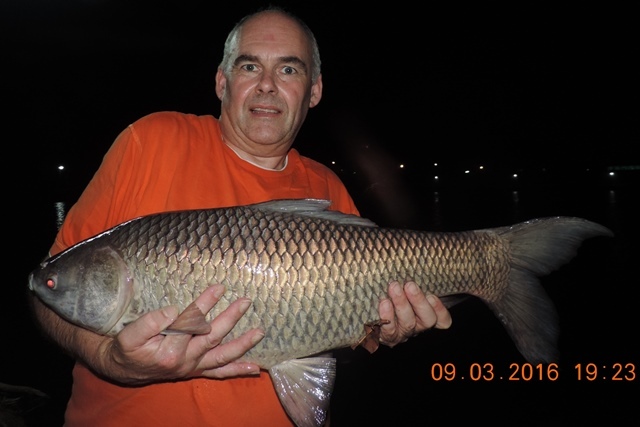 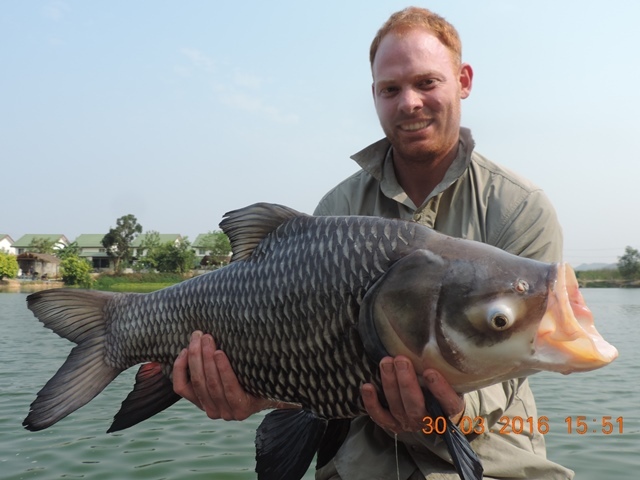 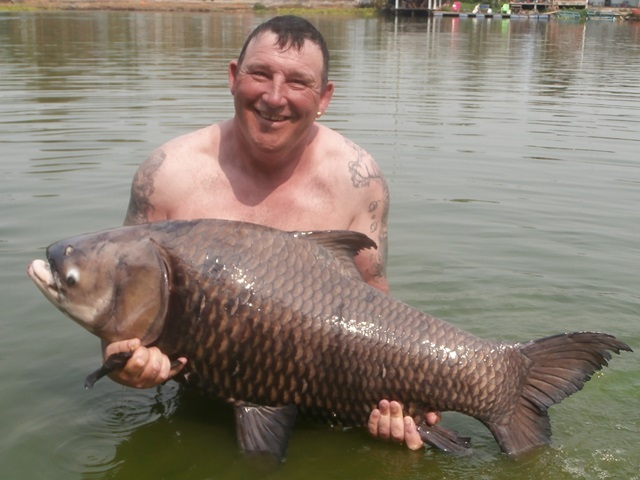 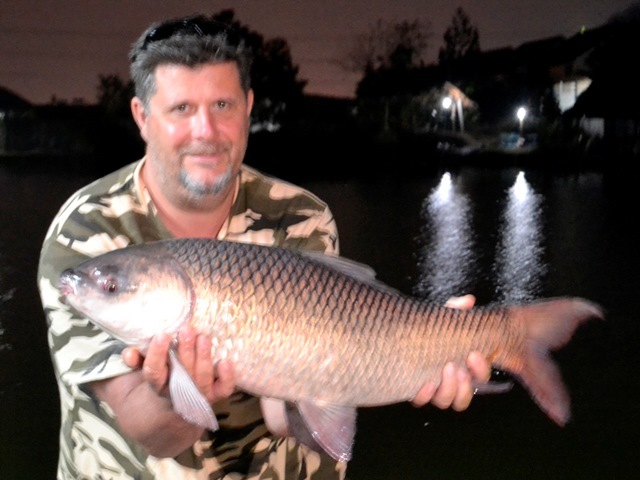 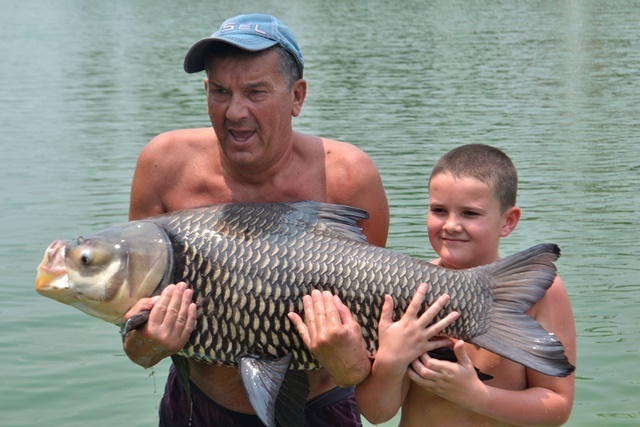 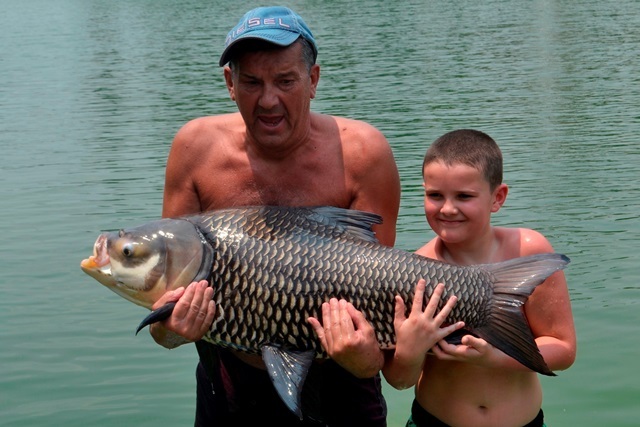 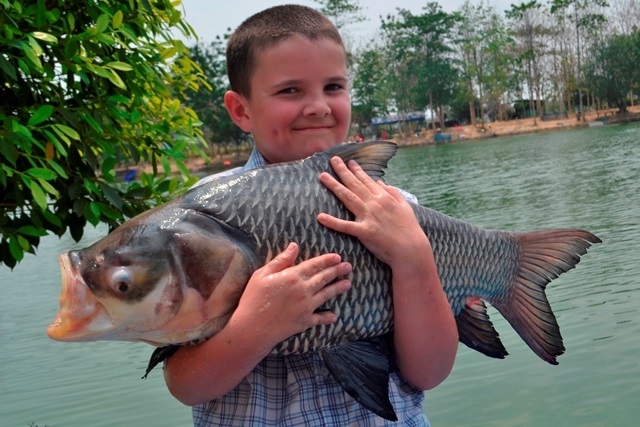 Barry Gregory brought up a couple of customers from Cha Am who caught Siamese carp and Amazon redtails.